…before heading to the beach for some more relaxing and playing. 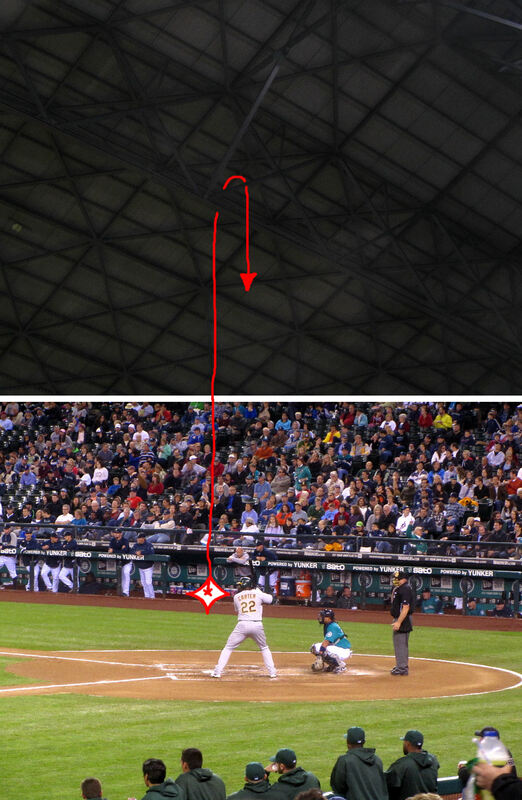 high side of the roof might be home plate where baseballs would be hit straight up from home plate. Wait, wait…turns out we were among the first 100 cars with four-or-more passengers and, therefore, we parked for free! Cool. 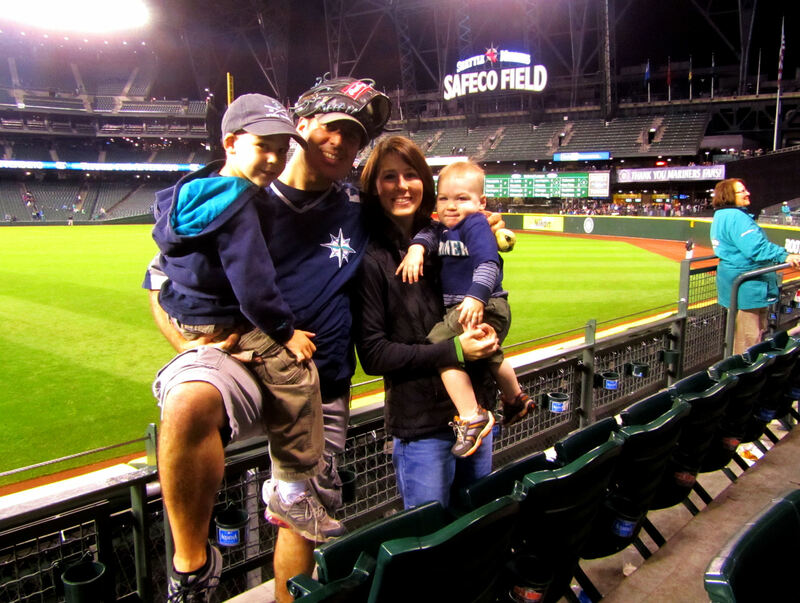 None of us had ever experienced anything like that before at an MLB game! 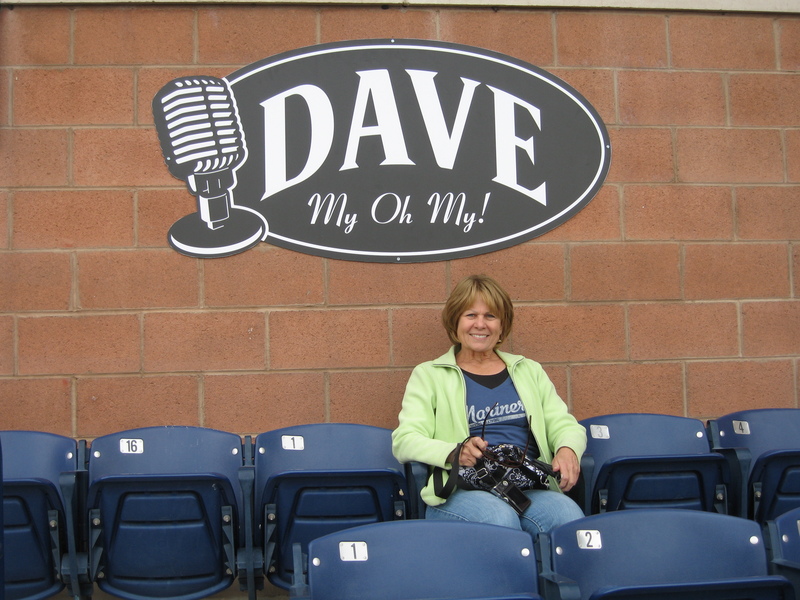 Oh, lookie there, its our Roadtrip guest: my mom! 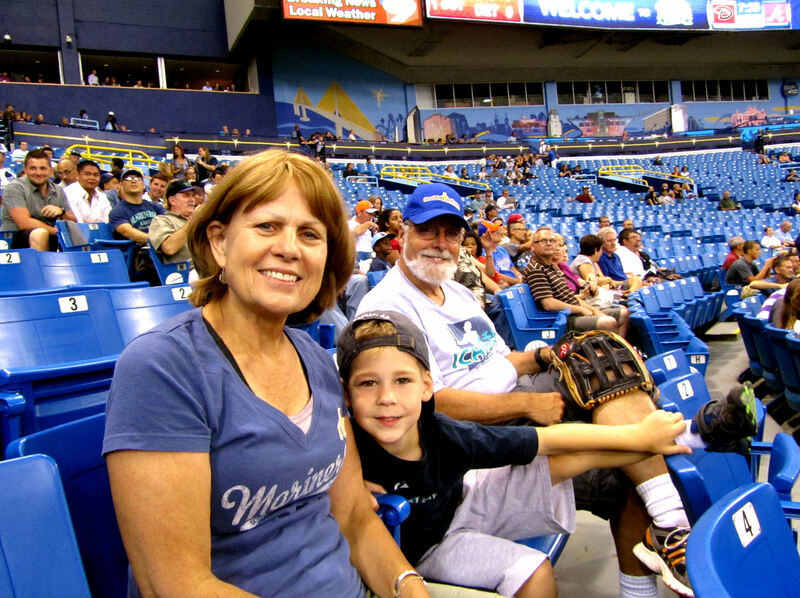 Tim was super-psyched to have his grandma join us for some baseball and other fun in the Tampa Bay area. She is, hands down, one of Tim’s favorite people in the world. 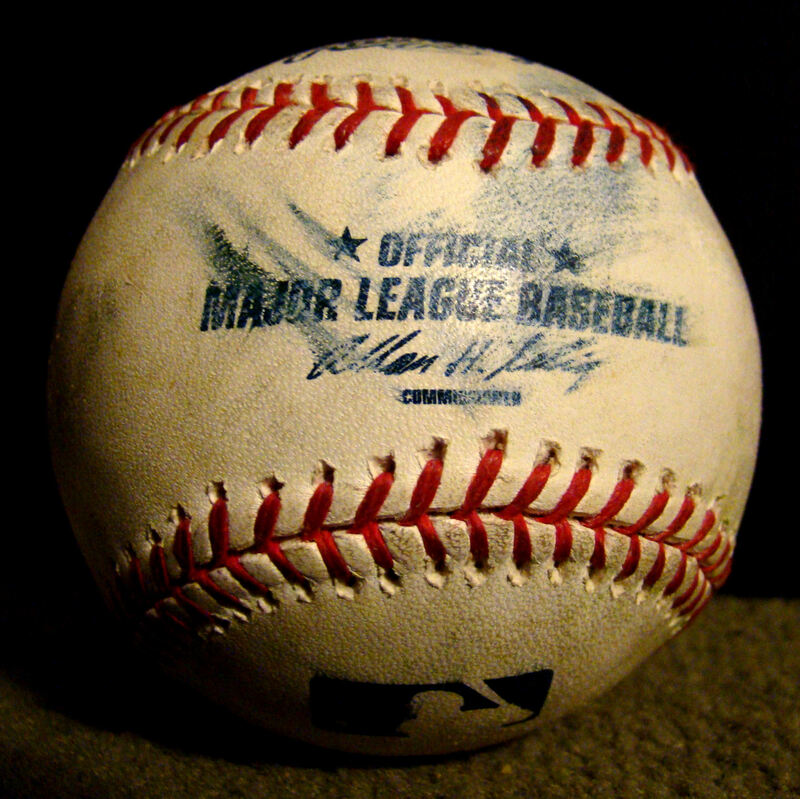 there are only three teams (the Cardinals, Royals and Rockies) that we have not seen play a home game. 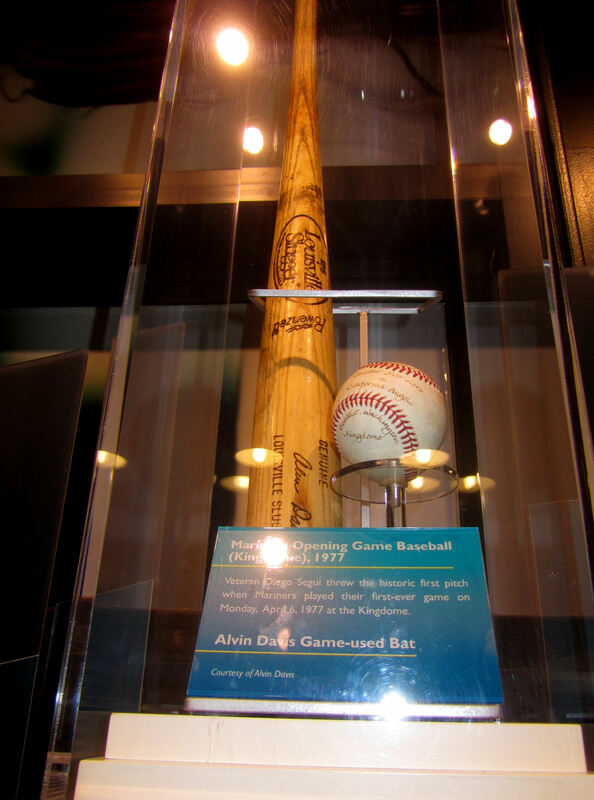 We will finish those teams off in 2012 – although we will also have to back track to Minnesota (Target Field) and Miami (new Marlins ballpark) before we can say we have been to games at all current-MLB stadiums. Check that out. 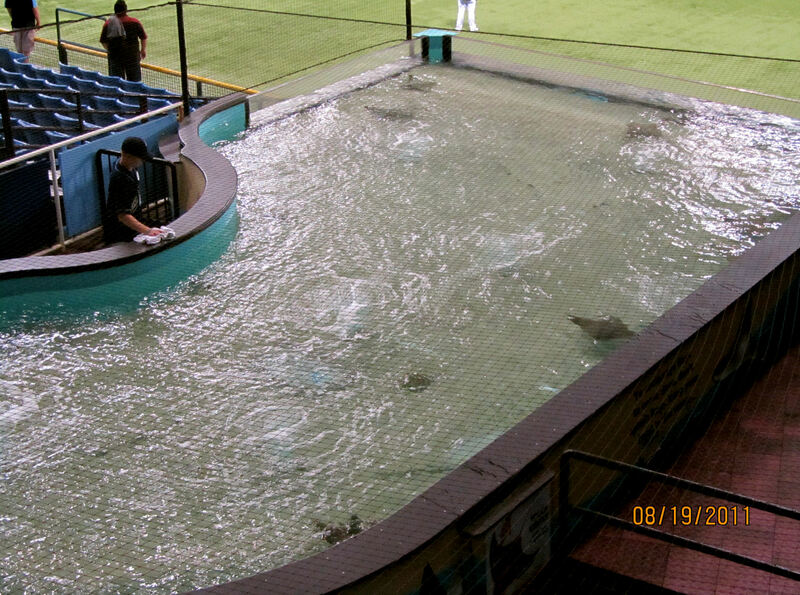 Rays are swimming by literally three feet away from those seats. How awesome is that? 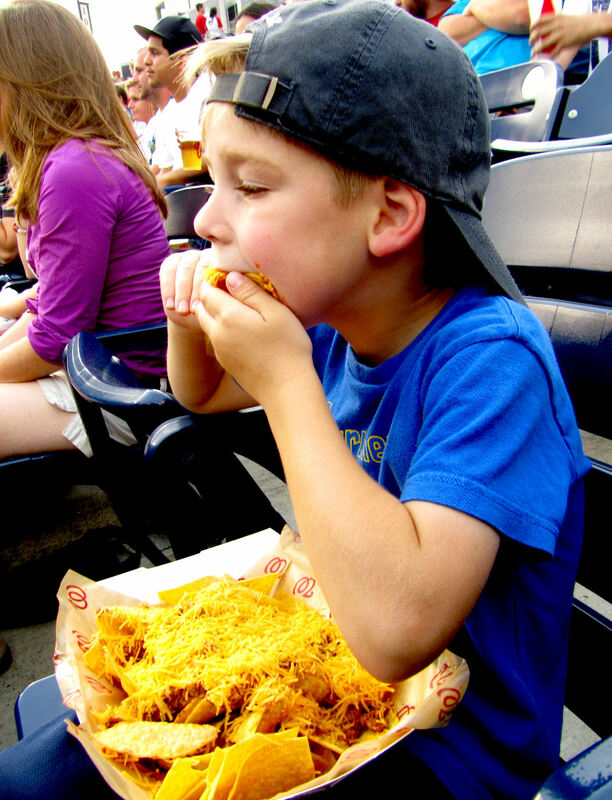 These are officially Tim’s favorite seats at any MLB ballpark. 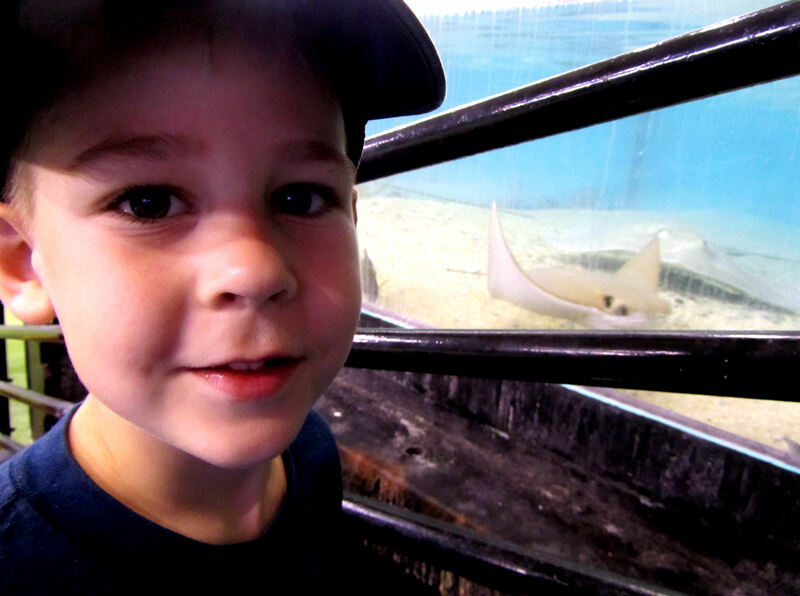 (And, as I type this, he reminds me that he didn’t love them just for the rays, he loved the horseshoe crabs too!). 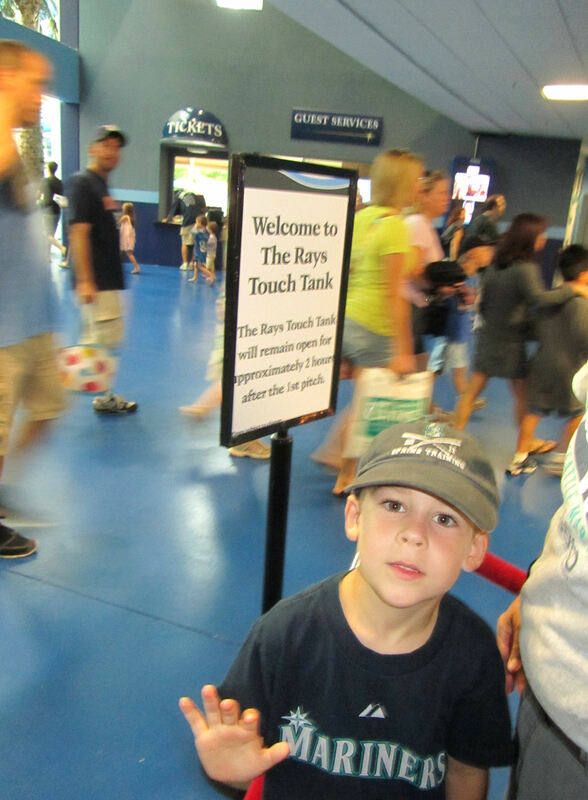 …welcomed us to Tropicana Field with a toss-up. 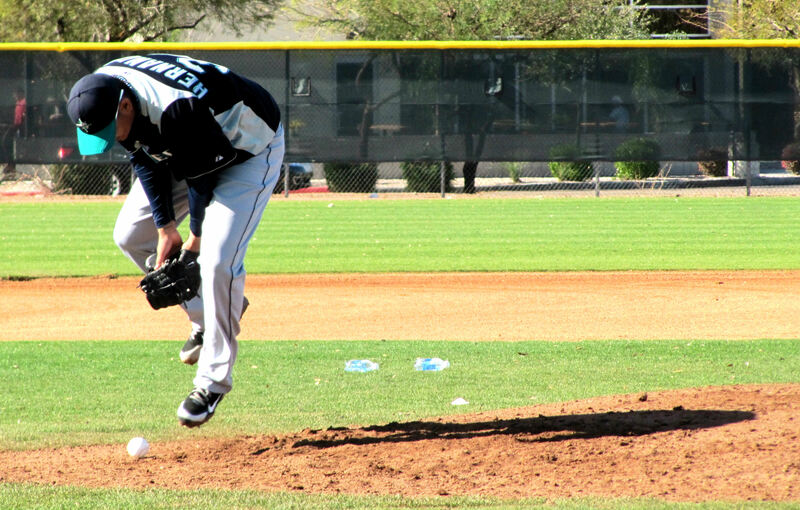 FYI, David Price is the guy running to the left, McGee is the guy acting like he is about to make a backhanded catch. 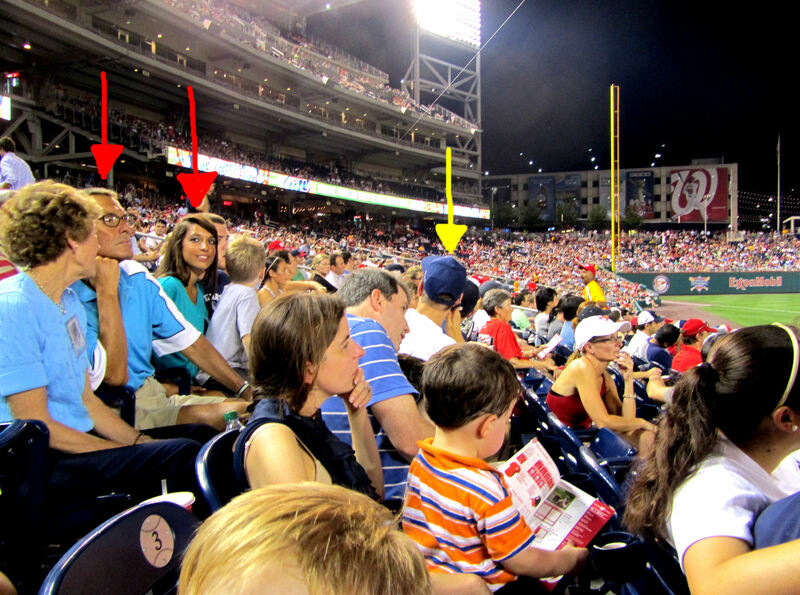 Unless you have these super-fancy tickets along the foul line, fans cannot get down to the field by the bullpens. 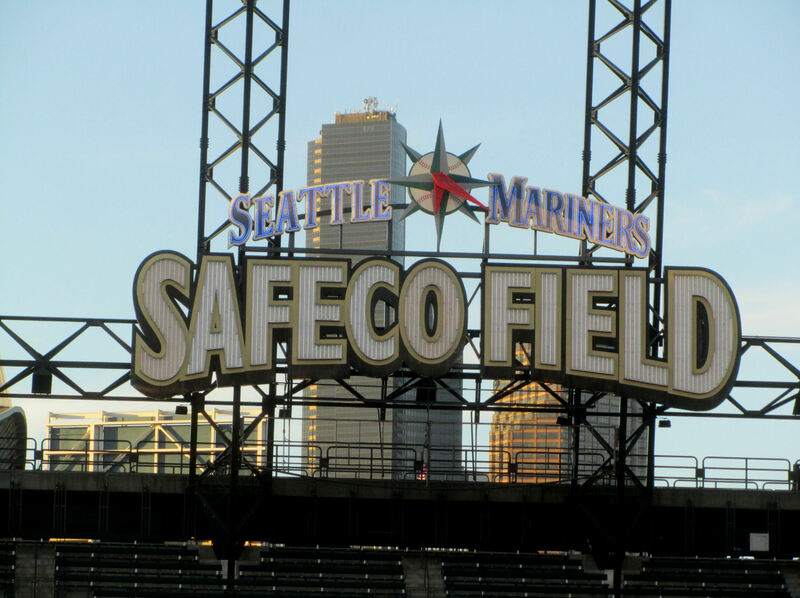 Its not as bad as in Miami where normal fans cannot get to the field anywhere in fair territory. 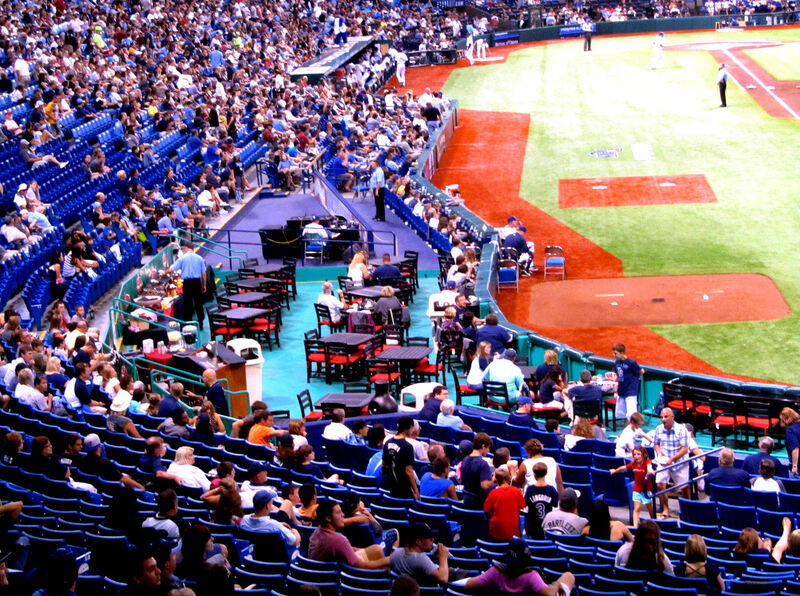 At Tropicana Field, any fan can get down to the front row on the field between the dugouts and the bullpens, but then these big party areas set back the normal fans about 20-30 feet from the field. 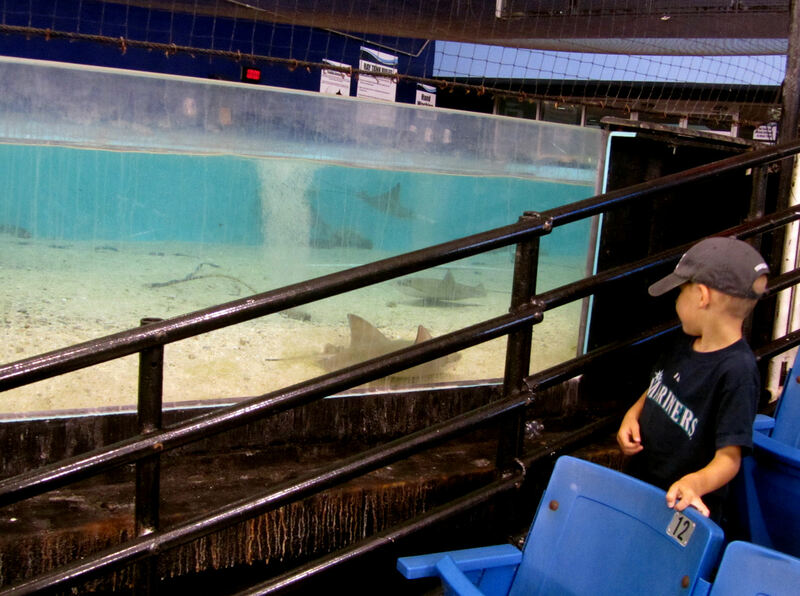 As would become a recurring theme of this weekend, Tim wanted to go back out to the CF seats so he could watch the rays in the rays tank. 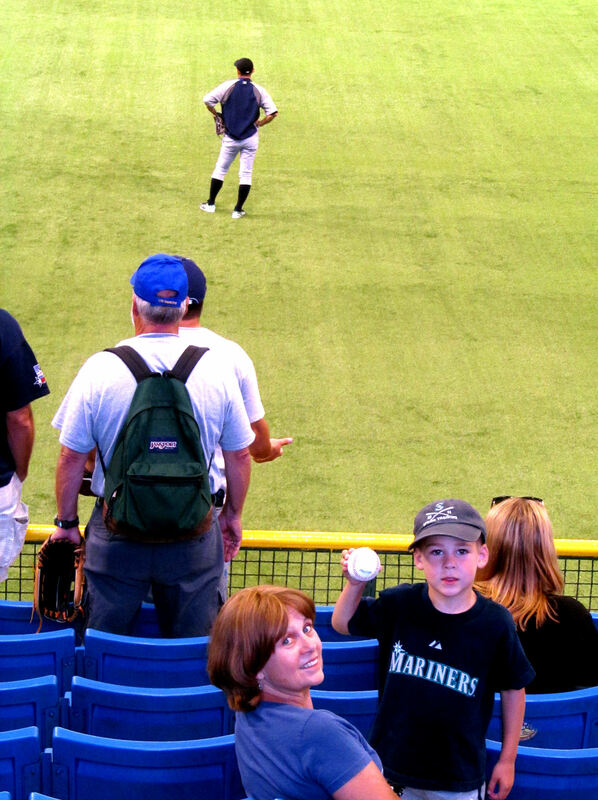 My mom took him out there and my Dad and I hung out by the Mariners bullpen. 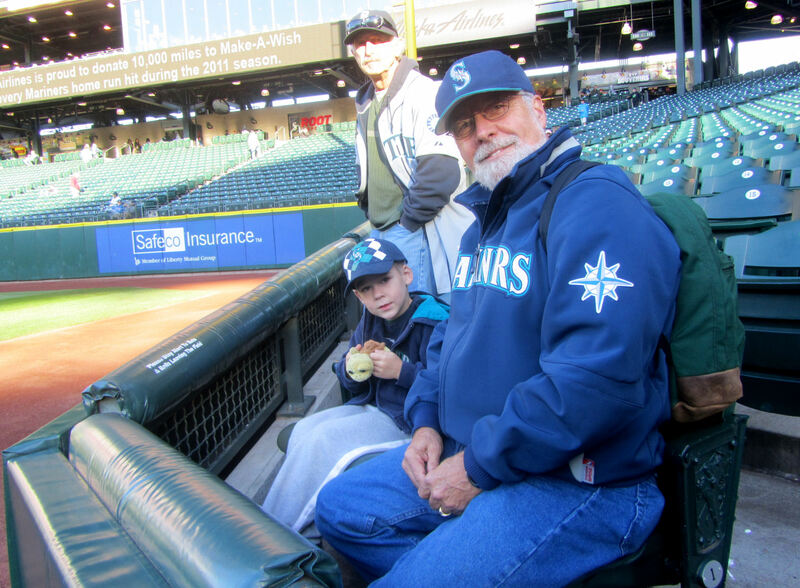 …by the foul pole, and my Dad hung out in…oh, probably…section 133 or so by the bullpen mounds. 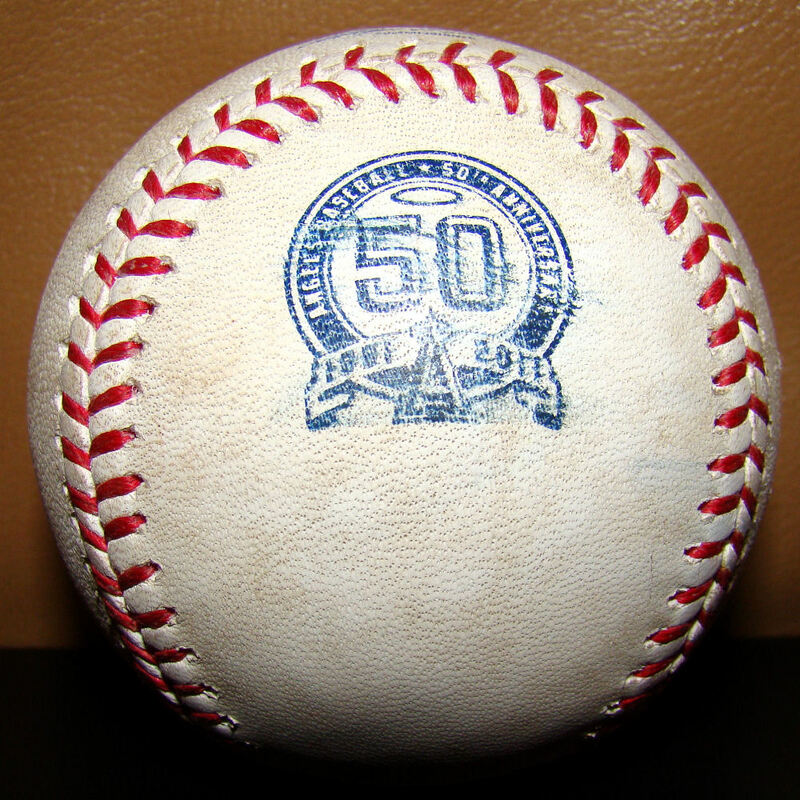 My Dad’s positioning paid huge dividends: Michael Pineda tossed him a baseball. 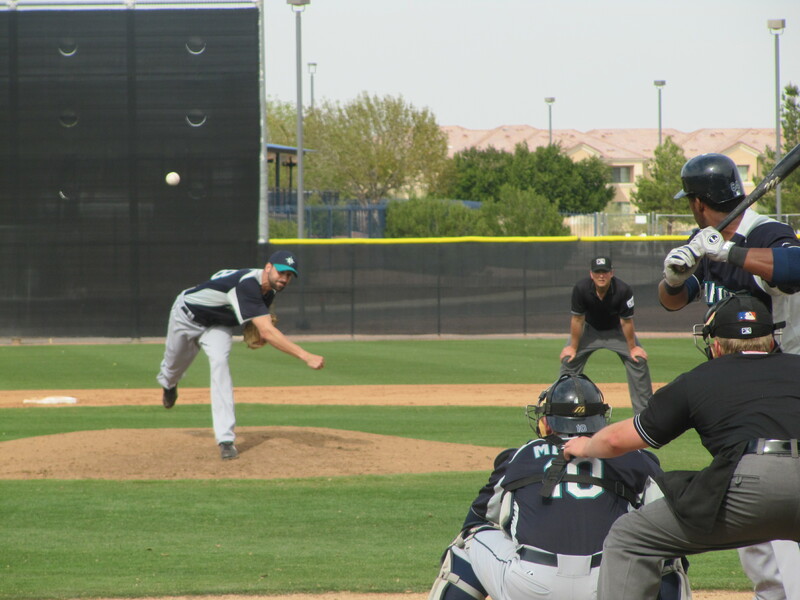 Pineda has had a rougher go of it in the second half of the season, but I think he is going to develop into a dominating MLB pitcher. 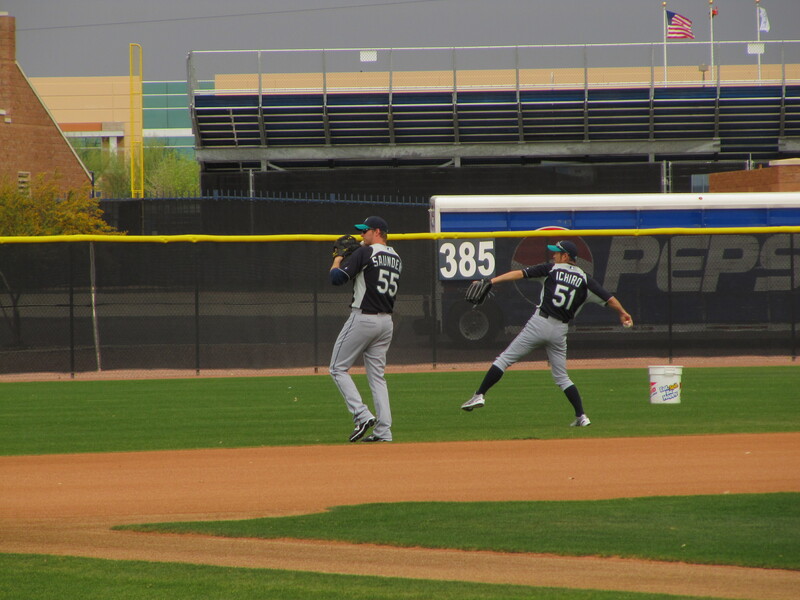 A few minutes later, Dan Cortes (who is standing above and slightly to the left of the bald security guard in the last picture) finished playing catch with Josh Lueke. 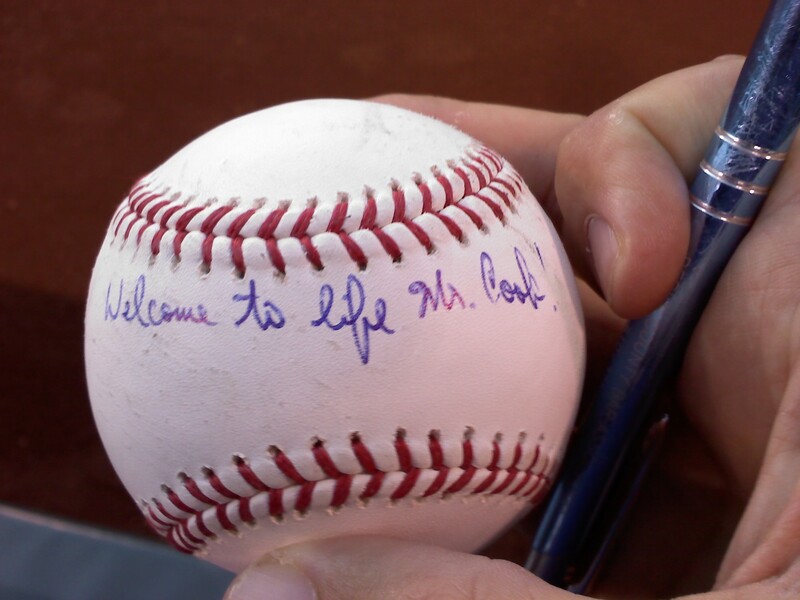 When I called out his name, Cortes happily tossed me his unofficially rubbed up and dirty baseball. 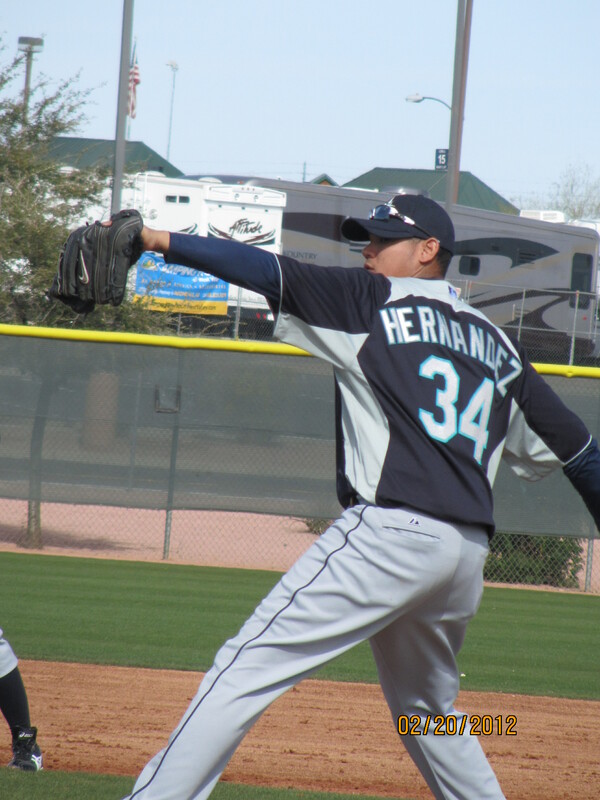 I’ve chatted with Cortes a few times this season. He seems really nice. 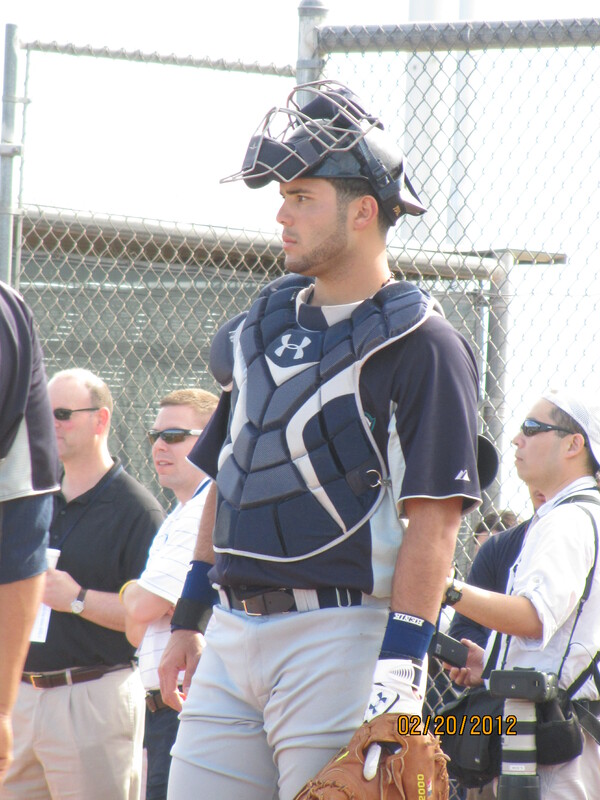 He’s at the stage that he’s excited to be in the big leagues and he is ready to spend a little time chatting to fans who recognize him. 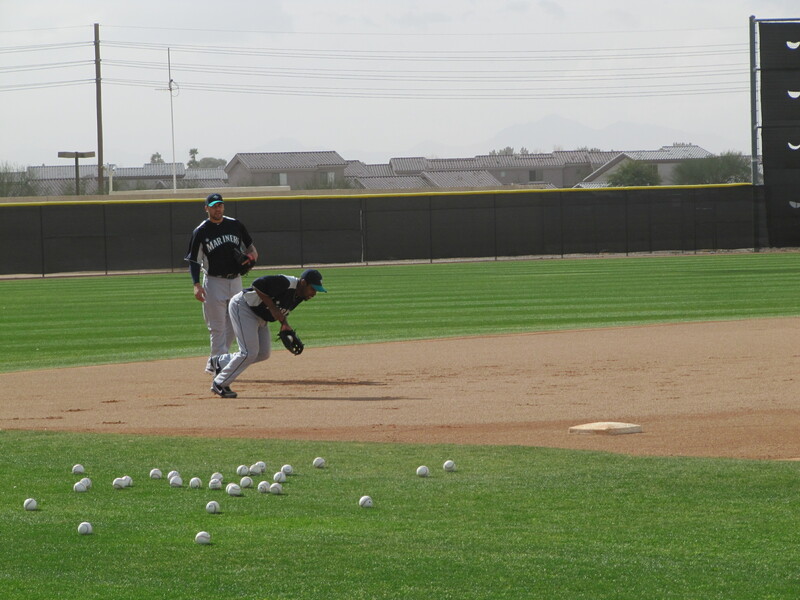 When the pitchers finished playing catch, they disbursed across the outfield. 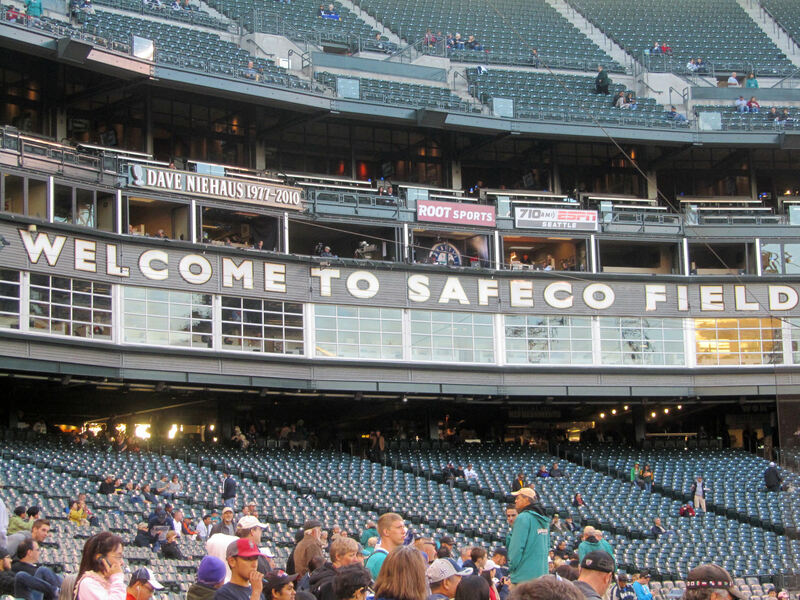 I spend a few minutes hanging out in LF, but it was somewhat crowded and I was alone. 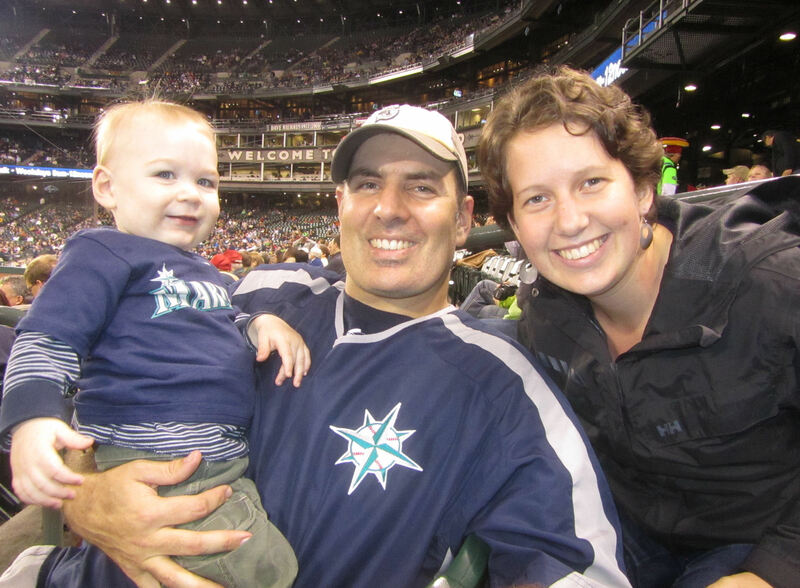 I figured it would be more fun to go meet up with Tim and my mom in CF. 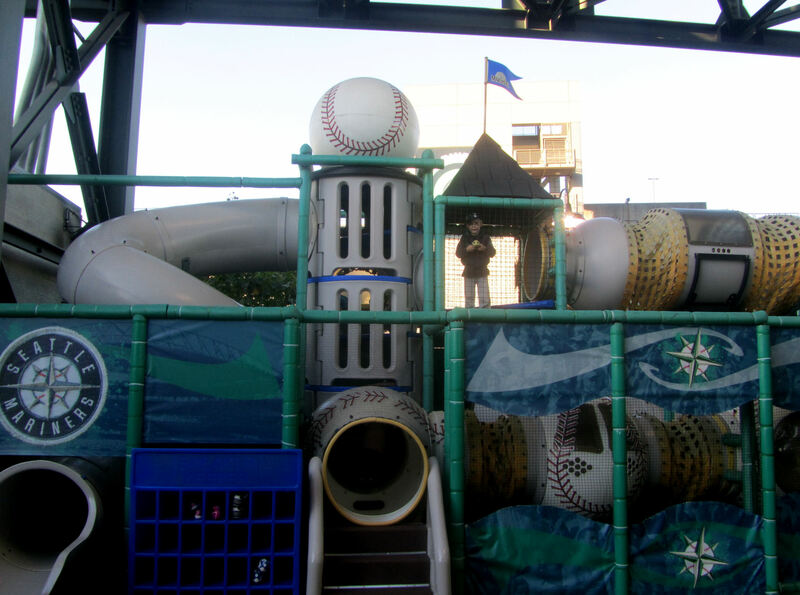 I started toward a tunnel to run out to the concourse, but then I figured I might as well walk to the LCF side of the batters’ eye in the seats. 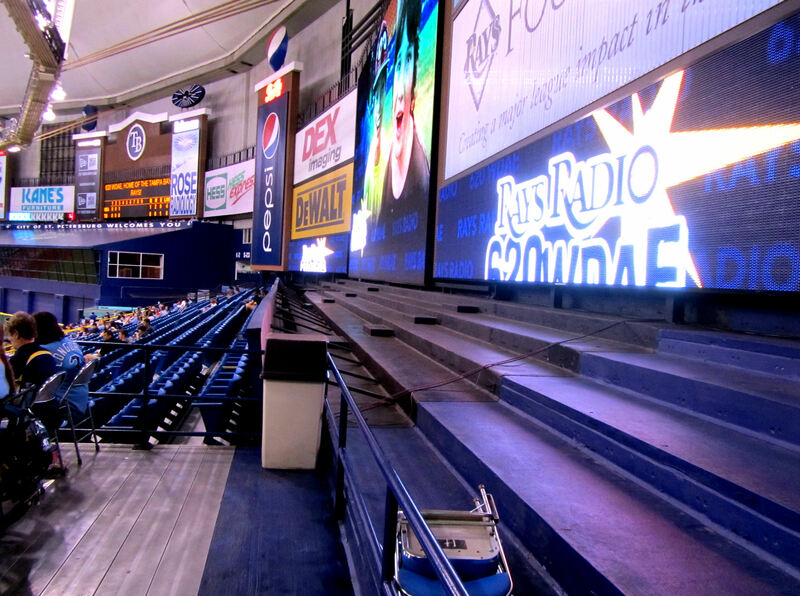 I could then run down into the concourse and head over to the RCF seats. The decision paid off. 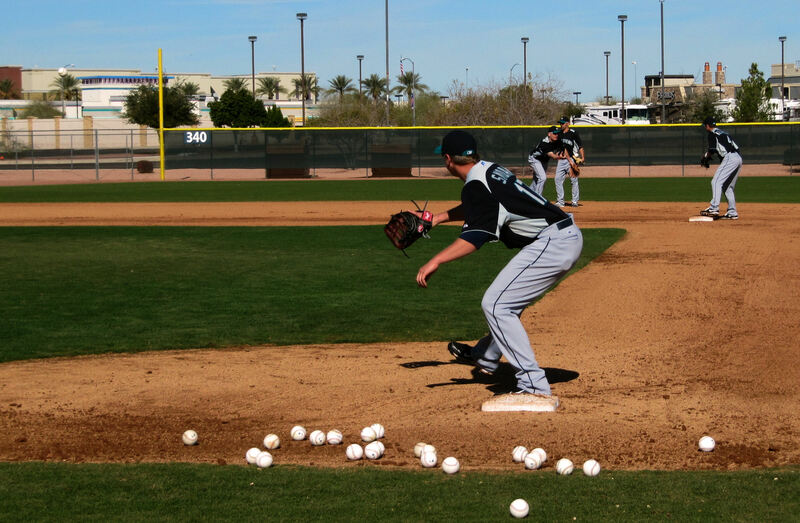 In deep LCF, Tom Wilhelmsen was all by his lonesome shagging baseballs. 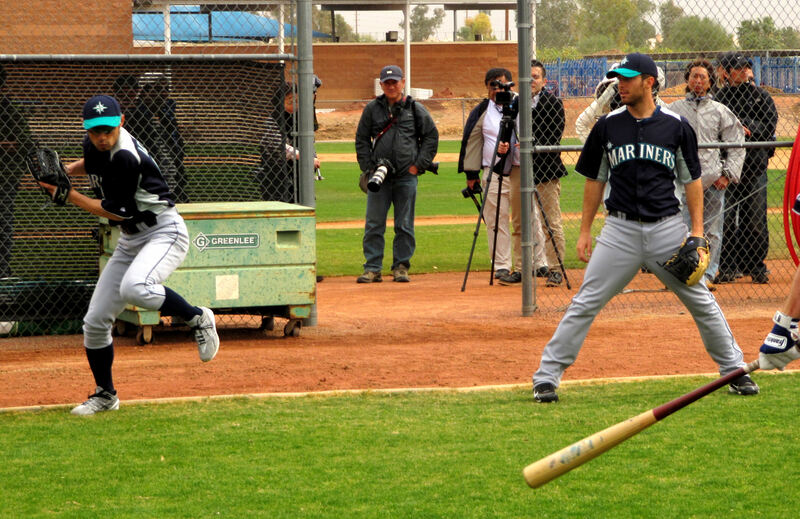 Wilhelmsen is in a similar place as Cortes – happy to be in the major leagues. But add to the mix that fact that he was out of baseball for about 6 years. Two years ago, he was a bartender in the Phoenix area. 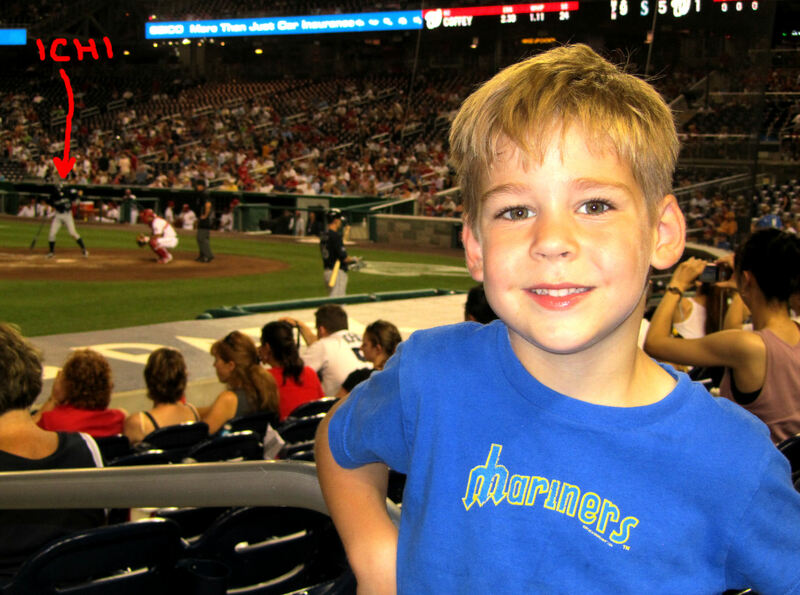 Now, he is a Major League baseball player. What wouldn’t he have to be happy about? 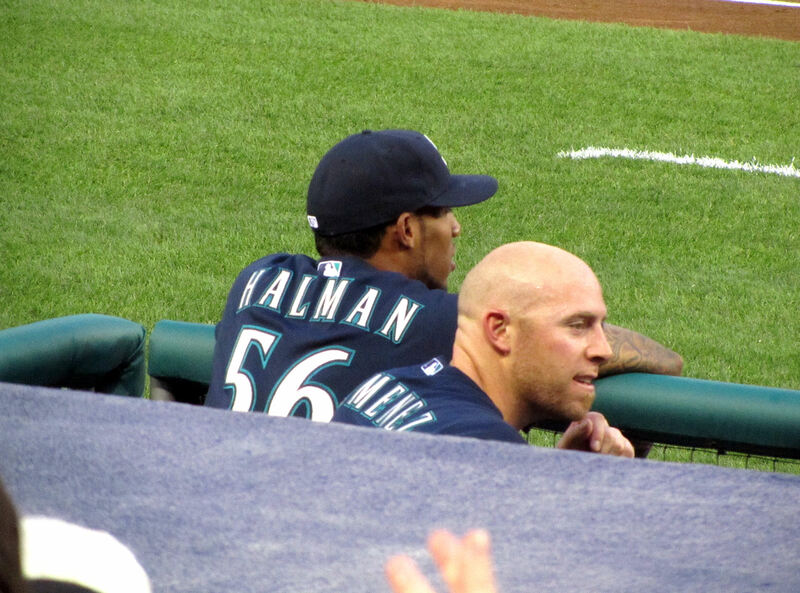 As I passed behind Wilhelmsen, a ball was driven into the deepest part of LCF. 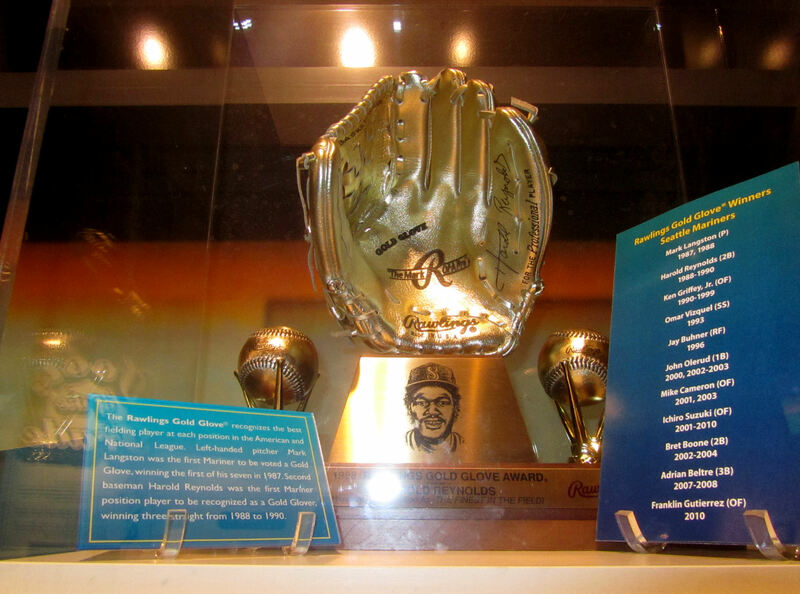 I called out Tom’s name and flashed him my glove. He then disappeared from sight for 3-4 seconds and returned ready to fire me a strike. 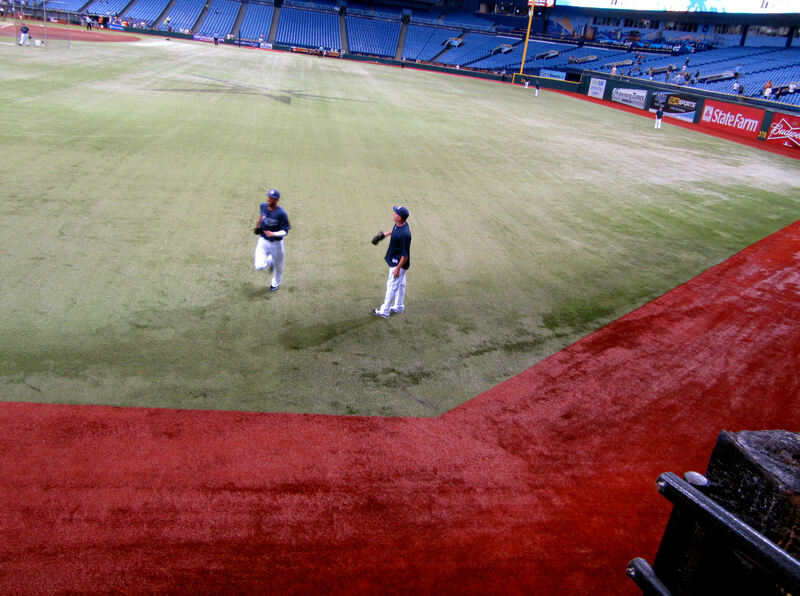 And then it was time for one of the most exciting BP moments or our season. My Dad was in straight away right field. 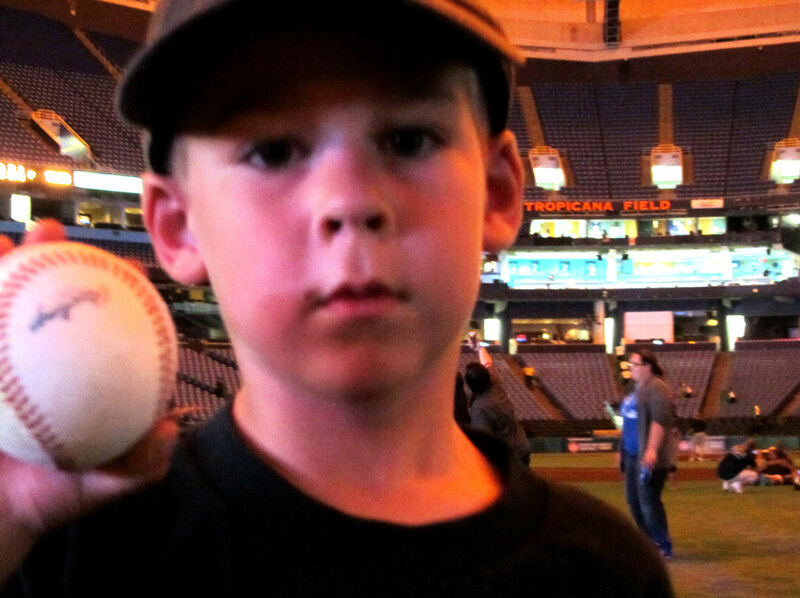 I relocated to RF after Jason Vargas tossed him his warm up ball in LF. 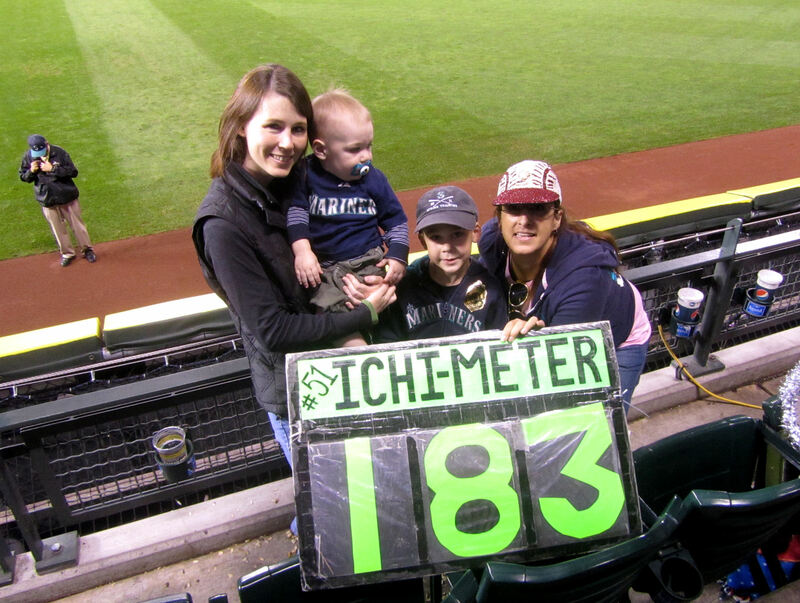 We all decided to go hang out over there when we saw that Ichiro was shagging fly balls out there. 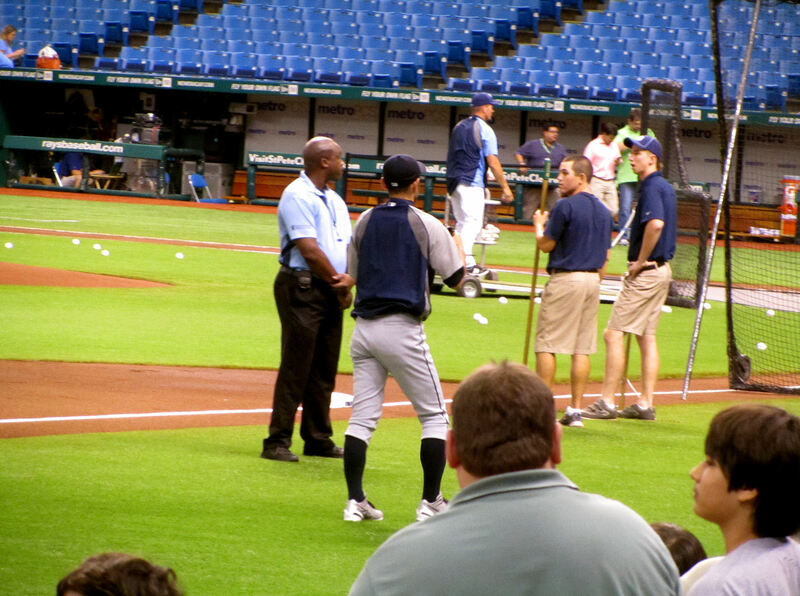 You can only go in the front row in the outfield during BP if you have front row tickets – my guess is that it is a safety issue. The railings are ridiculously low. Anyway, we couldn’t get into the front row. 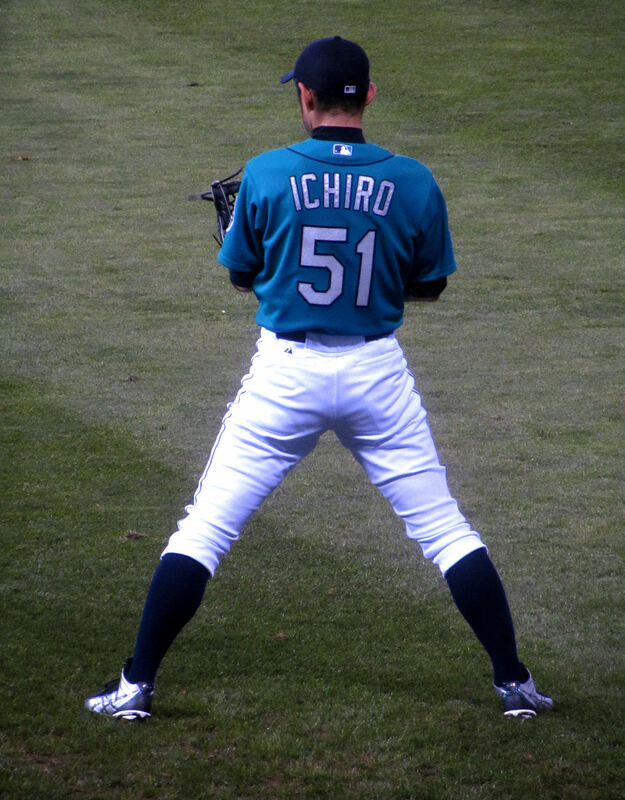 So Tim and I were standing together in the second row directly behind Ichiro. 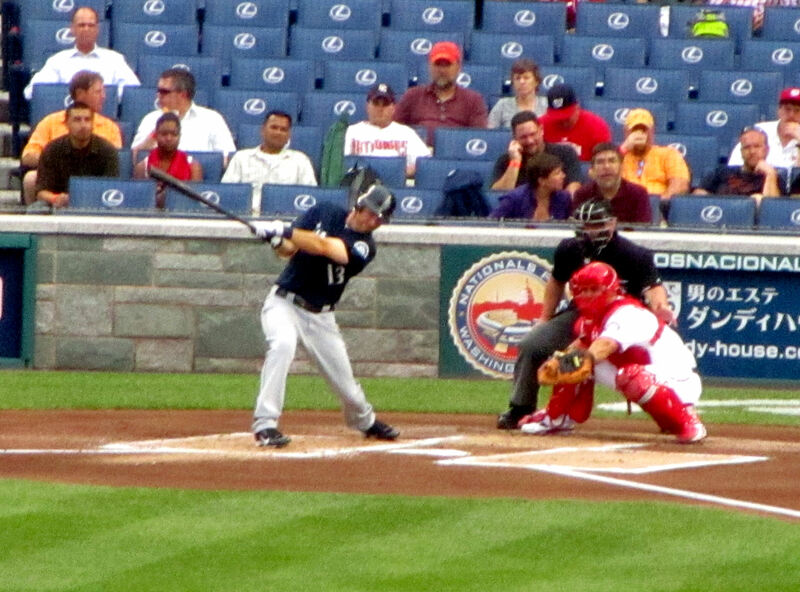 Oddly enough, Tim was actually standing directly in front of me – i.e., we were both standing in front of the same seat in the second row. 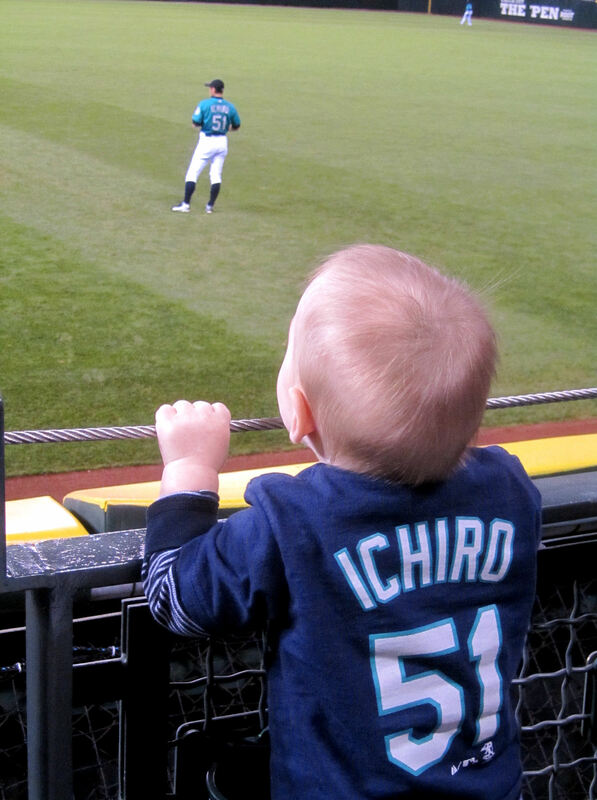 One of our lefties spanked a ball over Ichiro’s head. 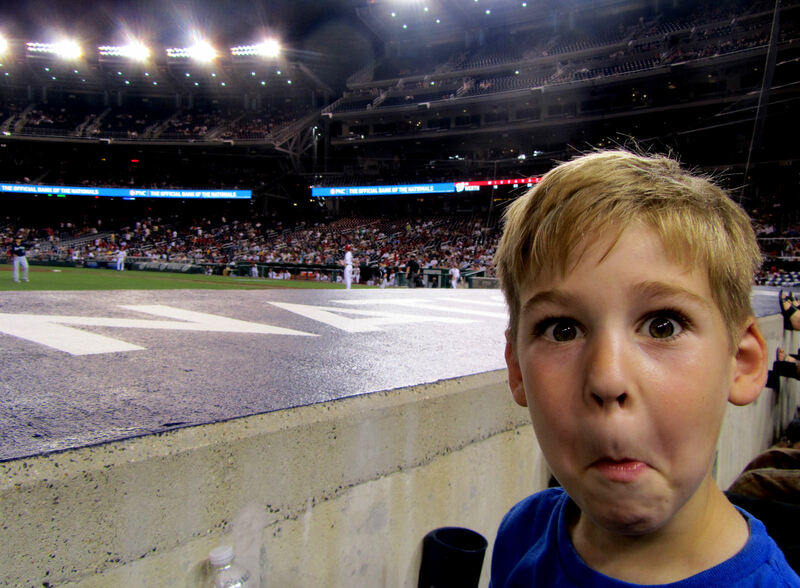 It ended up on the warning track directly in front of us. 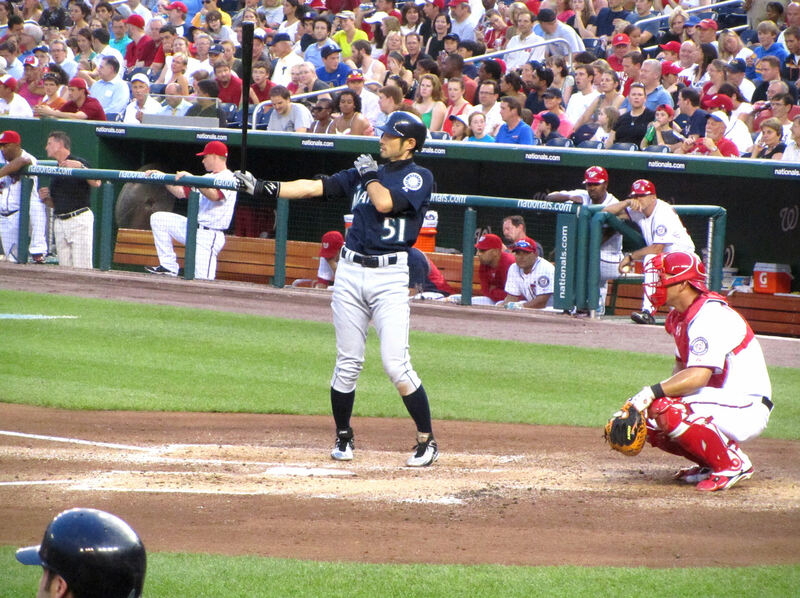 As Ichiro came back for it, Tim and I both called out to him and politely asked for him to toss the baseball to us. 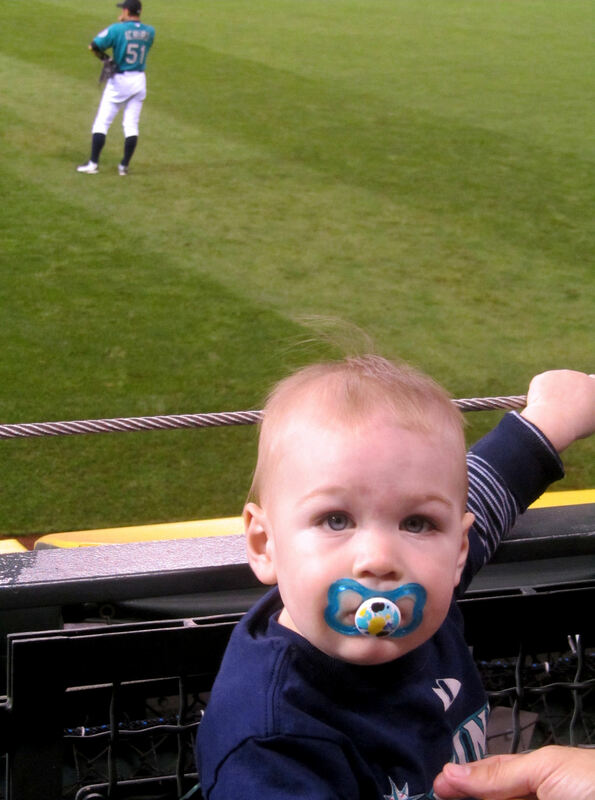 As he grabbed the baseball, he looked up right at us. 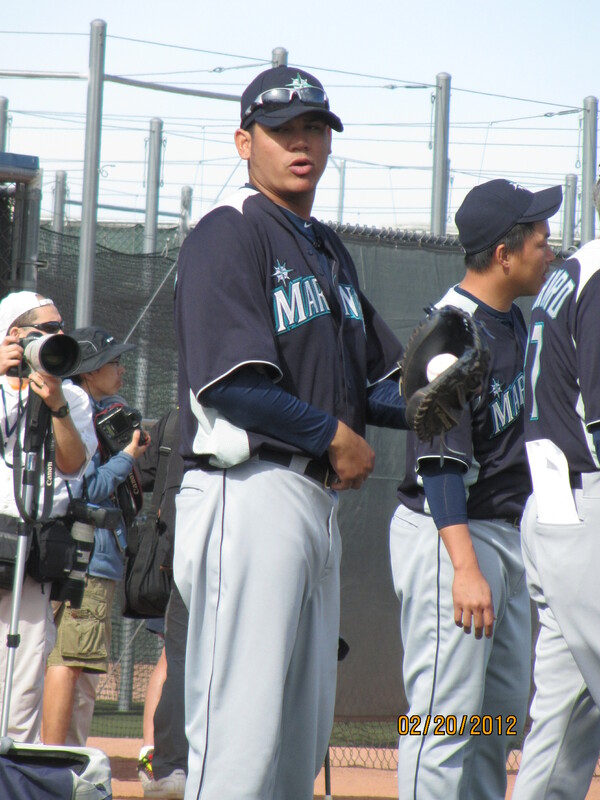 He saw Tim decked out in Mariners gear. Our eyes connected. 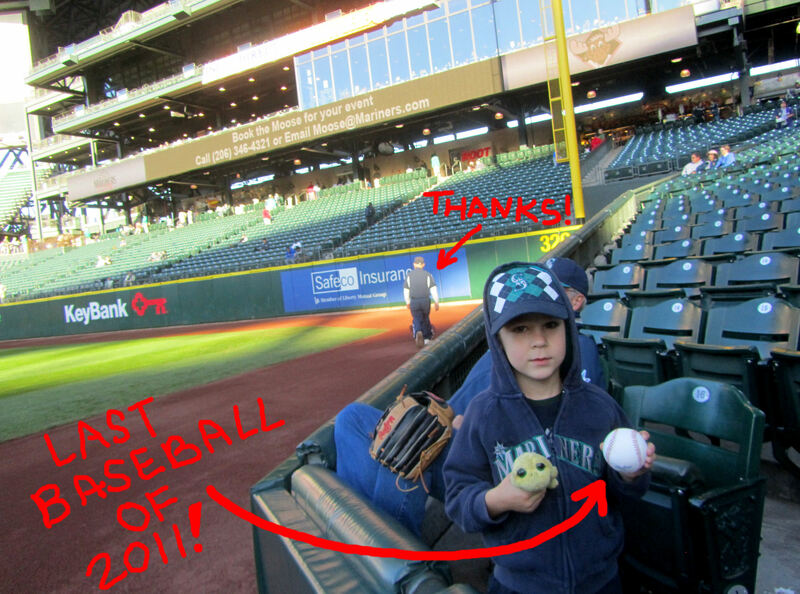 And he tossed the baseball right to us. But there was a problem. There were grown men on either side of me in the front row. 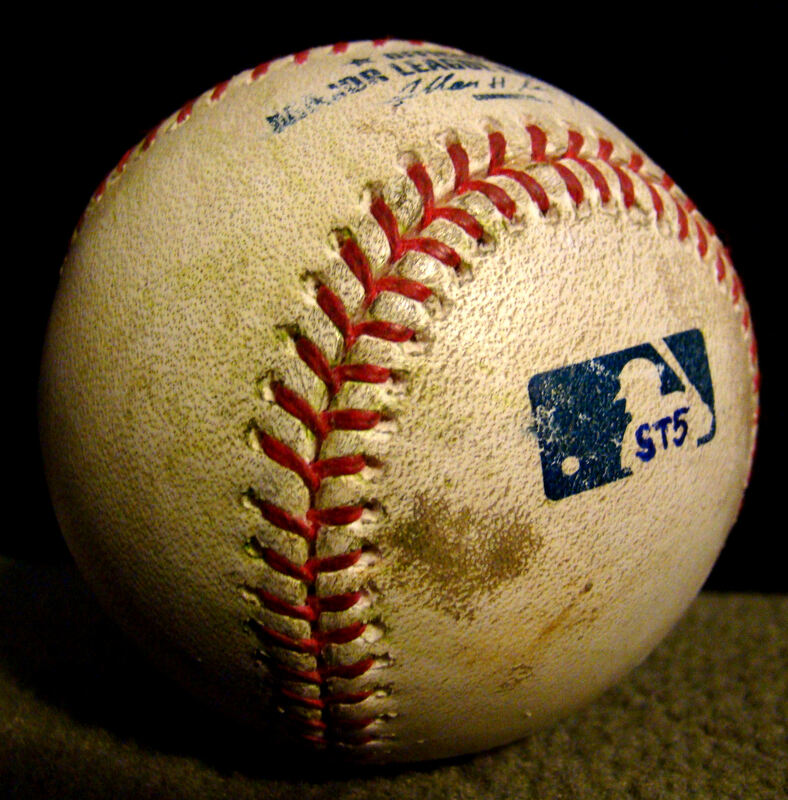 For us to get the baseball, one of two things would have to happened. 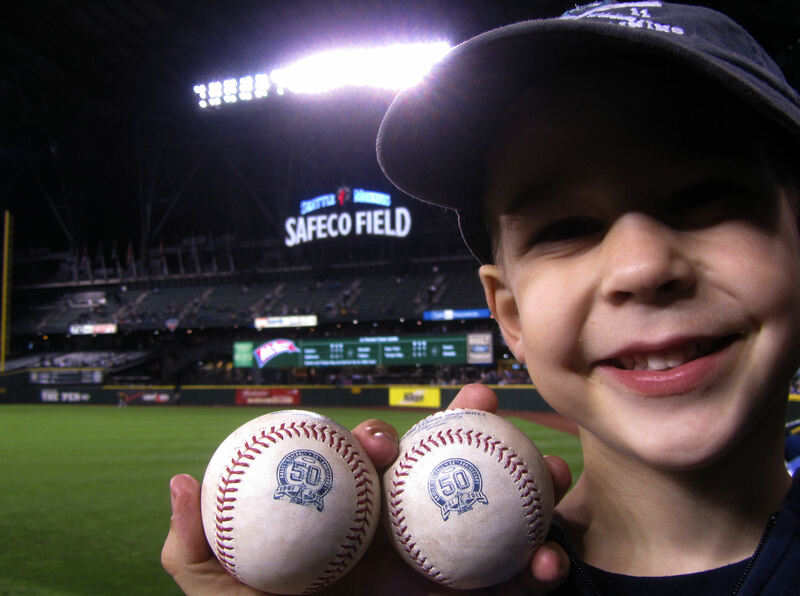 The first option was if, noticing that the baseball was plainly for a little kid (Mariners fan) who had asked for it, the two guys would just let it sail between them so we could catch it. That option was a no go. 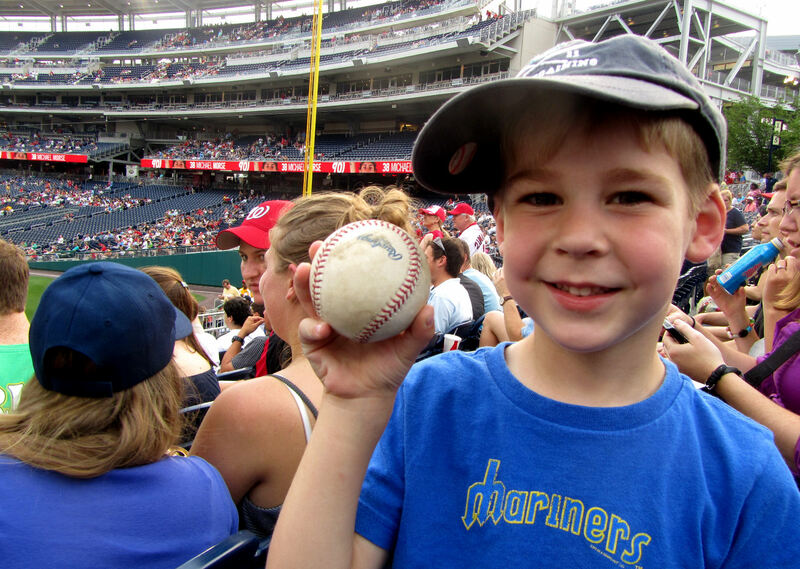 Both seemed intent on depriving Tim of the baseball that his baseball hero had decided to toss right to him. 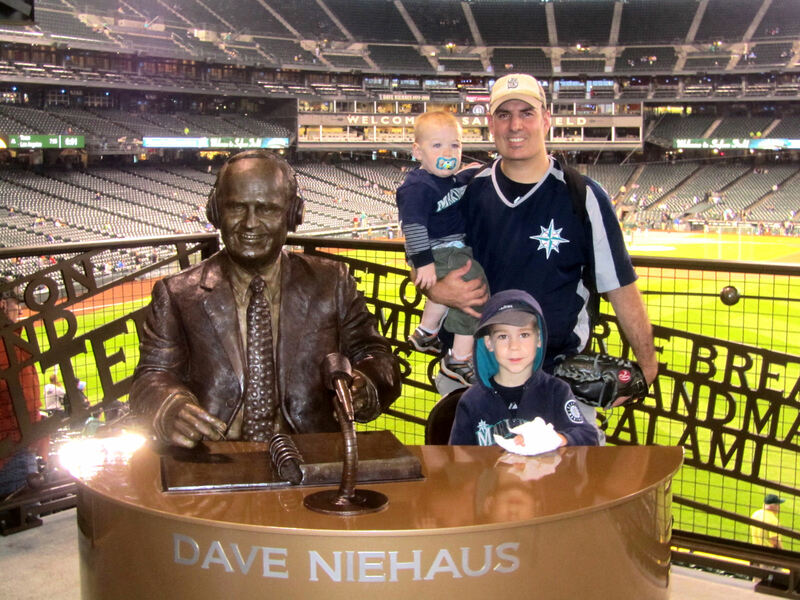 The second option was for me, without the ability to enter the front row, to someone beat out two grown men standing closer to Ichiro and catch the ball before them. And that’s what would have to happen. 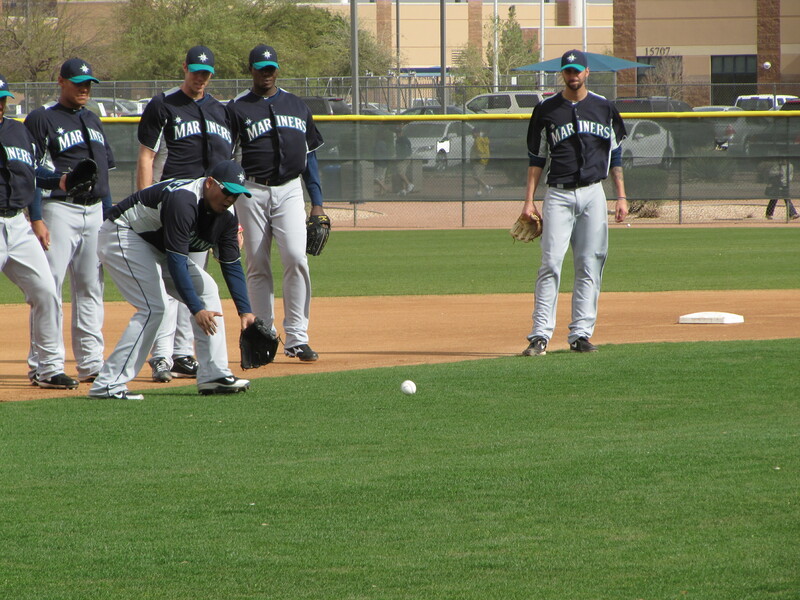 As the ball sailed to me, the guys crashed in from both sides. Luckily, neither guy reached out toward the field for it, they just moved laterally. Their gloves came together like a curtain trying to shut us out. But I leaned WAAAAY forward (Tim slid to the side so I didn’t smash him into the seat in front of me) and my pushed through the narrow opening between their gloves. 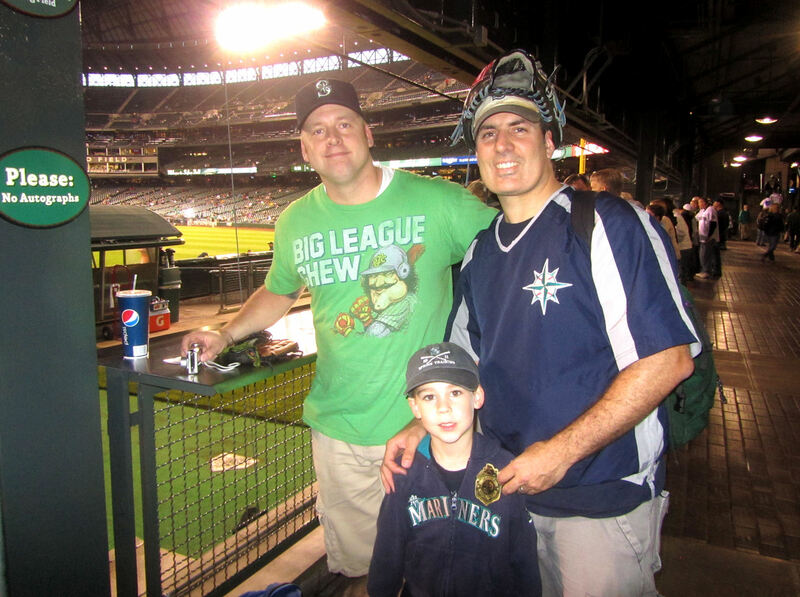 The two guys essentially caught my wrist, and on the other side, my glove caught the baseball. 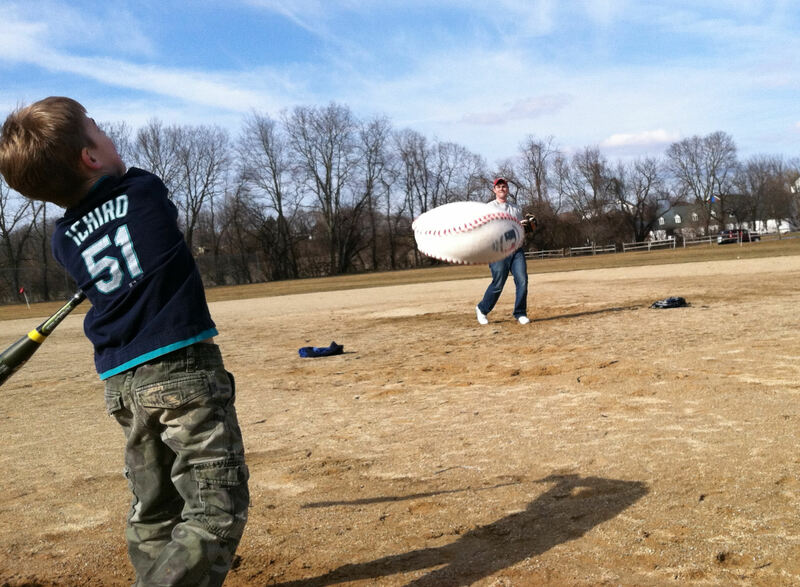 This was already one of our best batting practices ever. 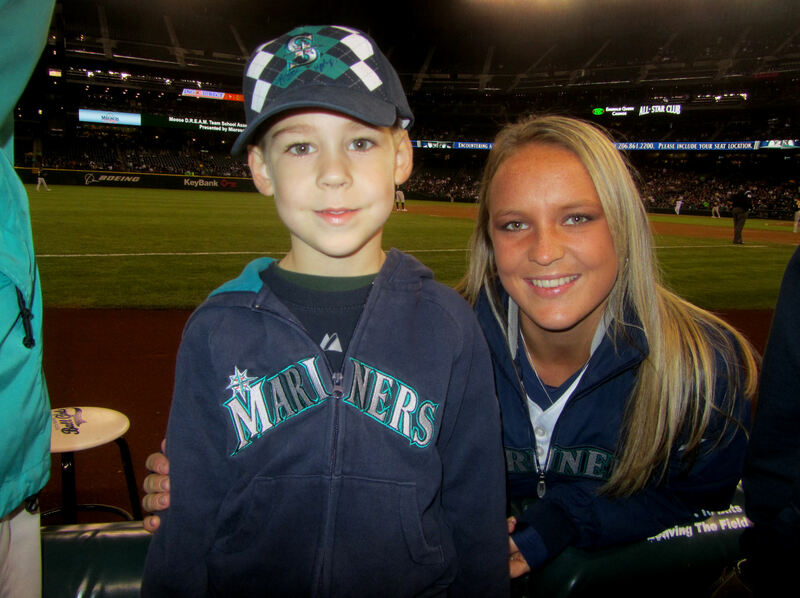 To cap it off, I caught a Kyle Seager (I am pretty sure it was Seager) homerun on the fly at the back of the section. 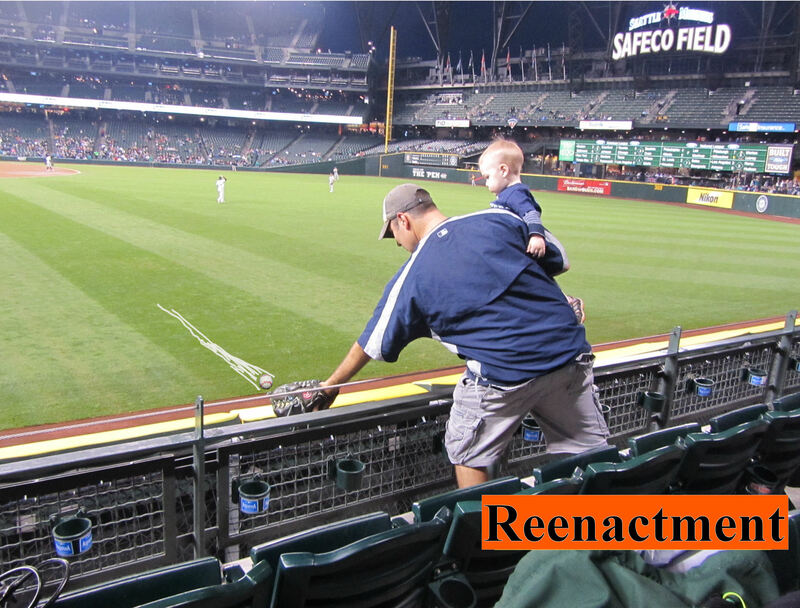 It was pretty exciting since I almost never catch balls on the fly (in fact, this was my first of the season). The ball was hit about 10 feet to my left. I ran over there and it was coming directly to two guys (probably 22’ish years old). 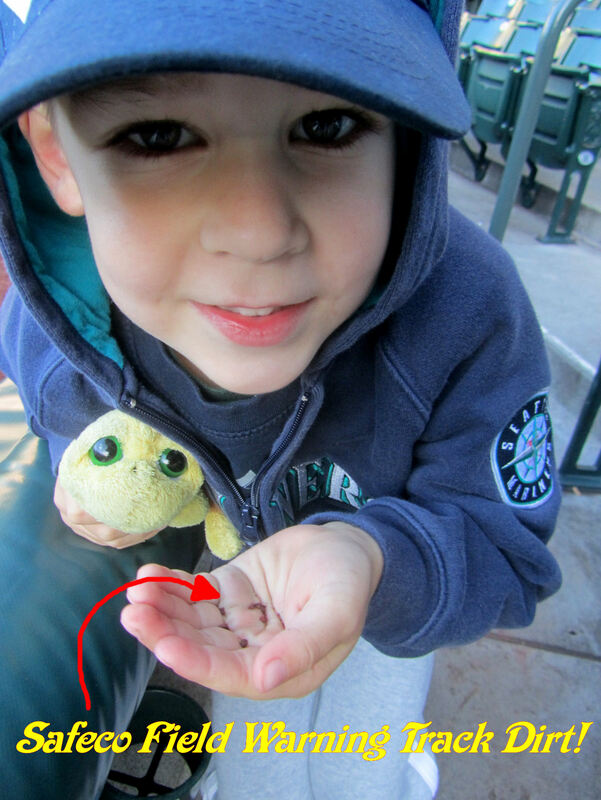 Neither had a glove, but both hopped up and made a quarter-hearted attempt at catching it. But in the end, I think both were scared to try to catch it bare handed. 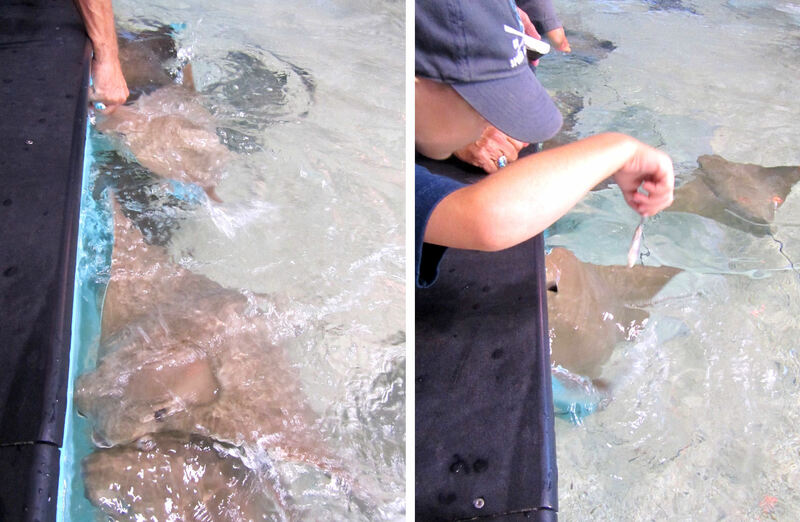 So they let it sail directly between them and straight into my glove. It was pretty cool and my Mom gave a big cheer from the bottom of the section. So that was cool. 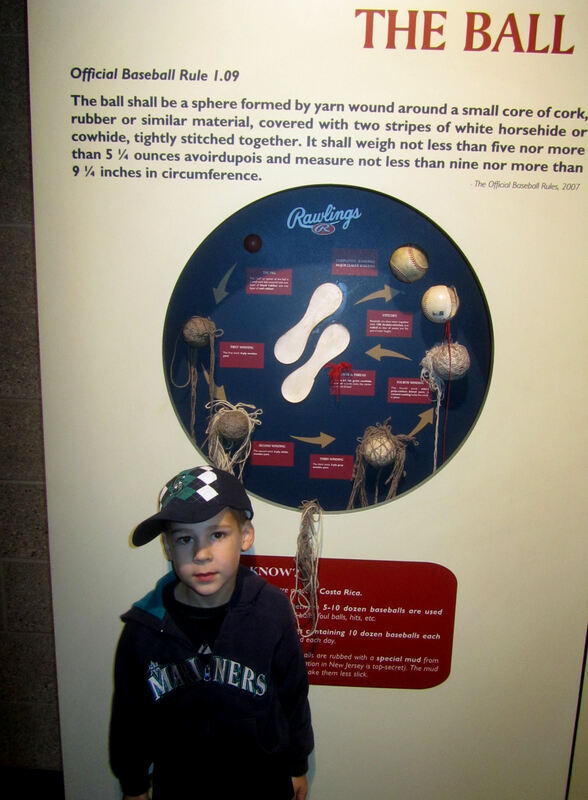 Seager really got a hold of that one. 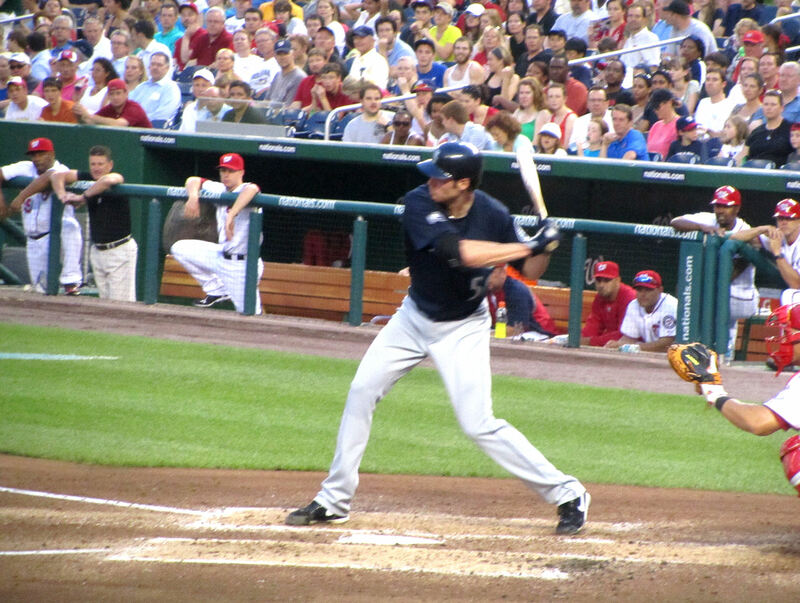 The ball ended up mildly lopsided from the force of the hit. 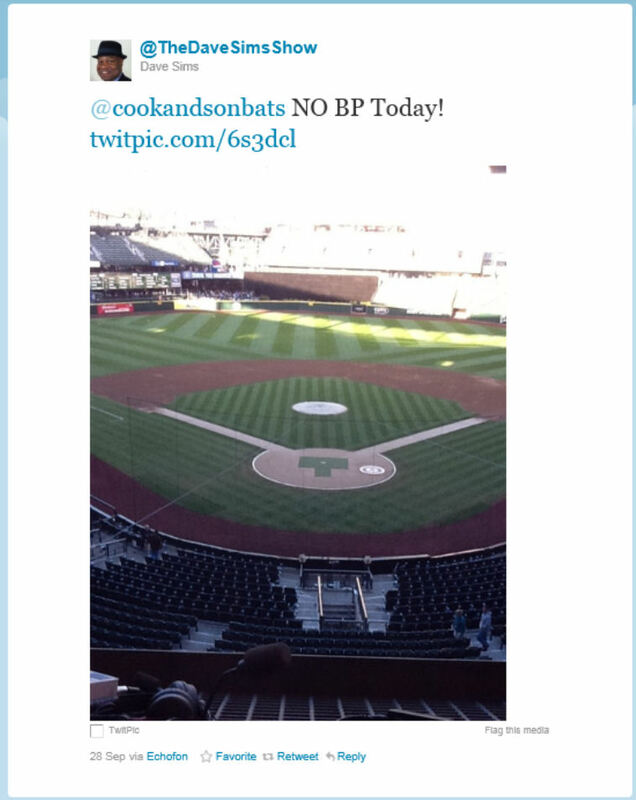 And that was it for BP. 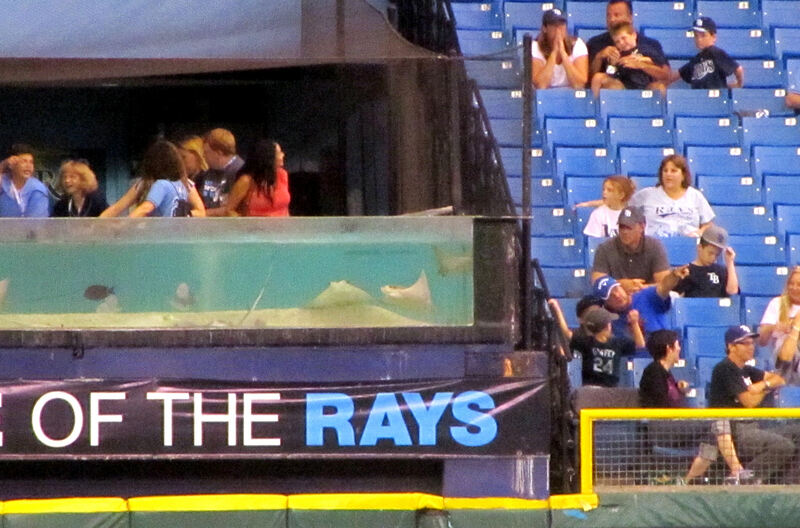 That’s the arm of “Raymond,” the Rays’ mascot. 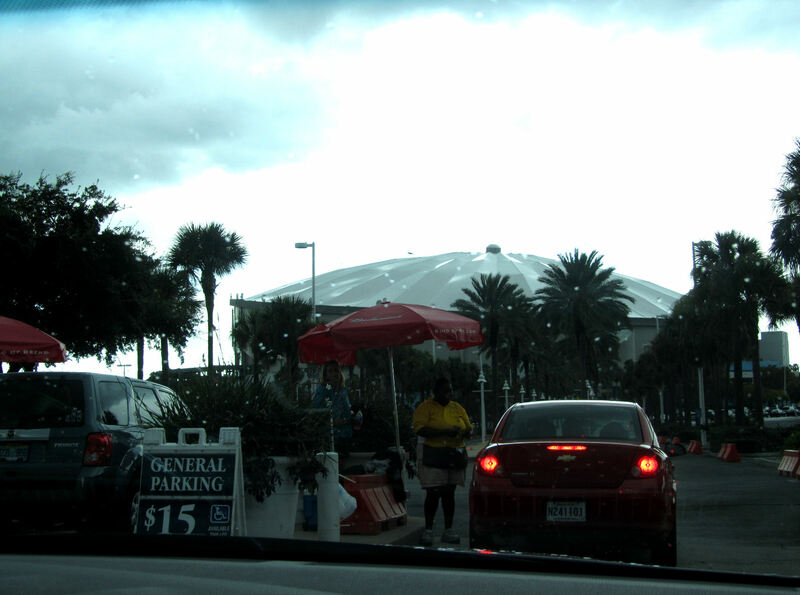 Although many people are down on domed-stadiums (not me, I love ‘em! 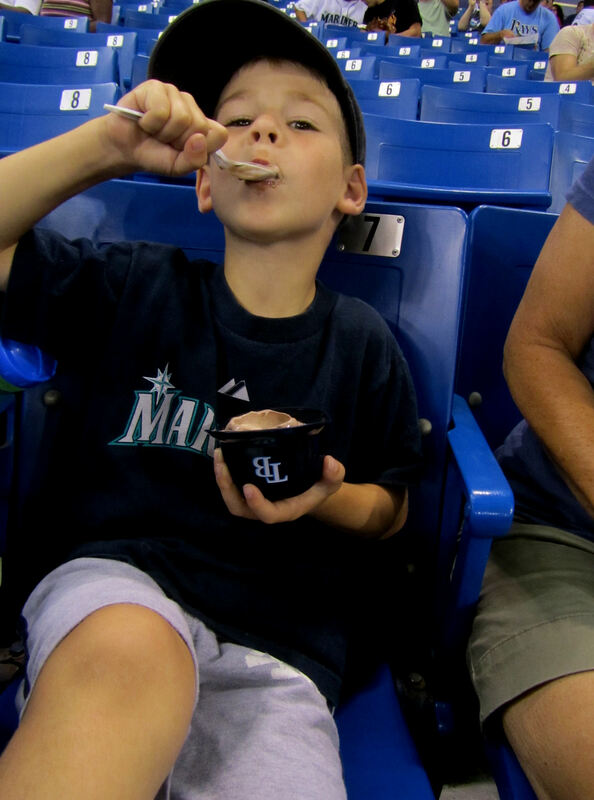 ), no one can credibly say that the Rays haven’t done a great job making their concourses interesting for fans (particularly kids). 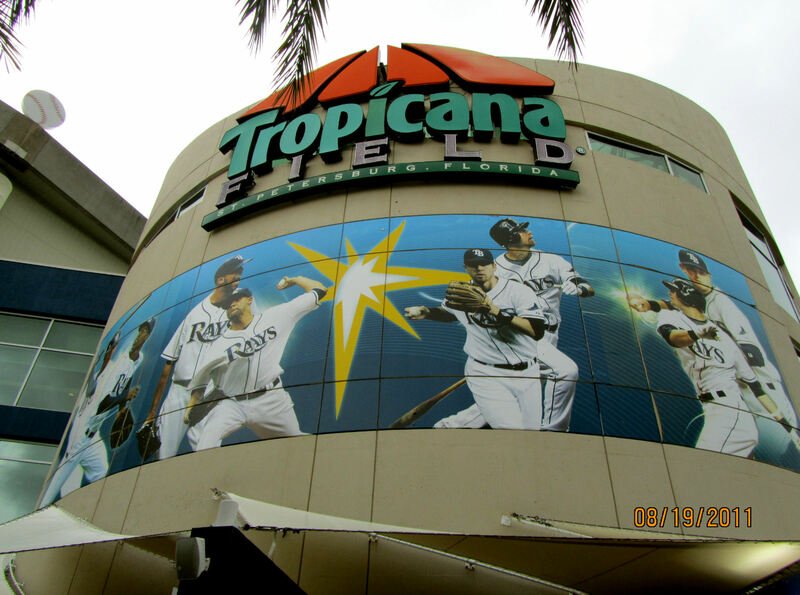 There are tons of things to see and do in the various concourses that circle Tropicana Field. 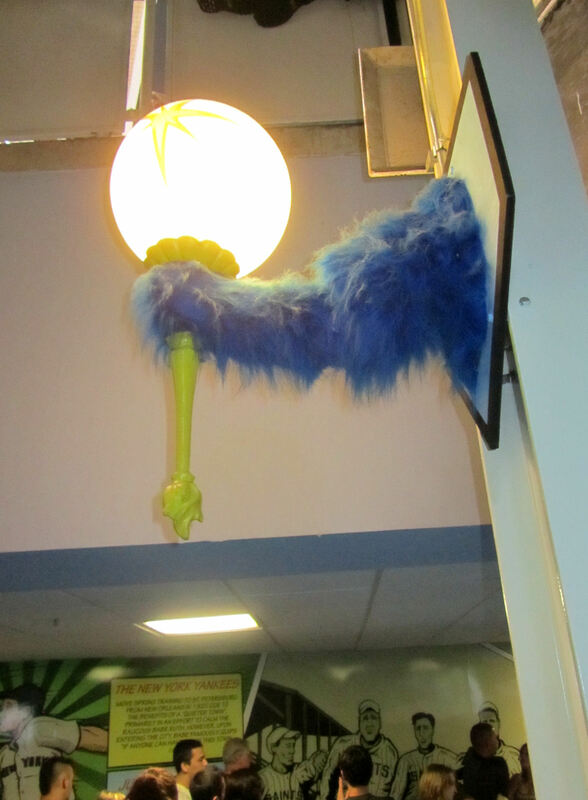 Oops…we forgot about the upstairs waiting area. What is this, the Empire State Building line? 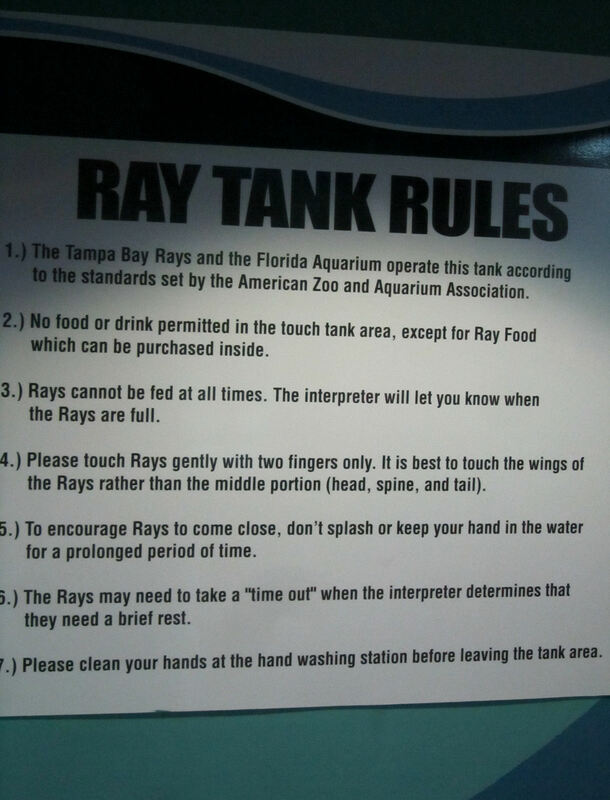 If you had food, the rays would flock to you and stick their faces and wings above the water. 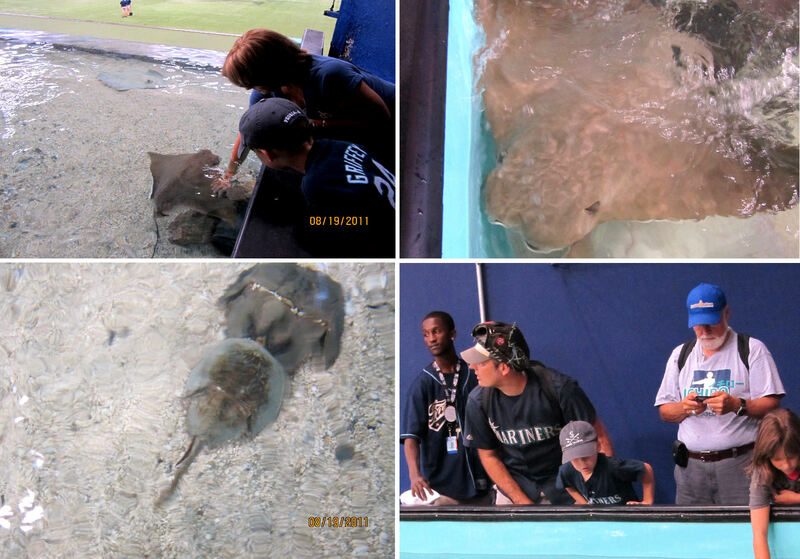 Meanwhile, the horseshoe crab and its baby walked around the bottom of the tank and didn’t bother anyone. 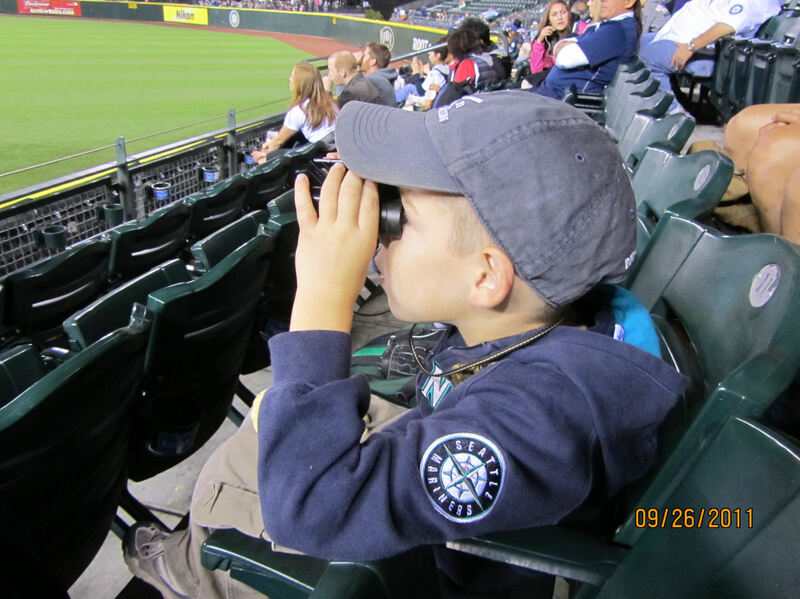 Of course, I had to keep an eye on the field to see if my Mariners would reappear. And they did. 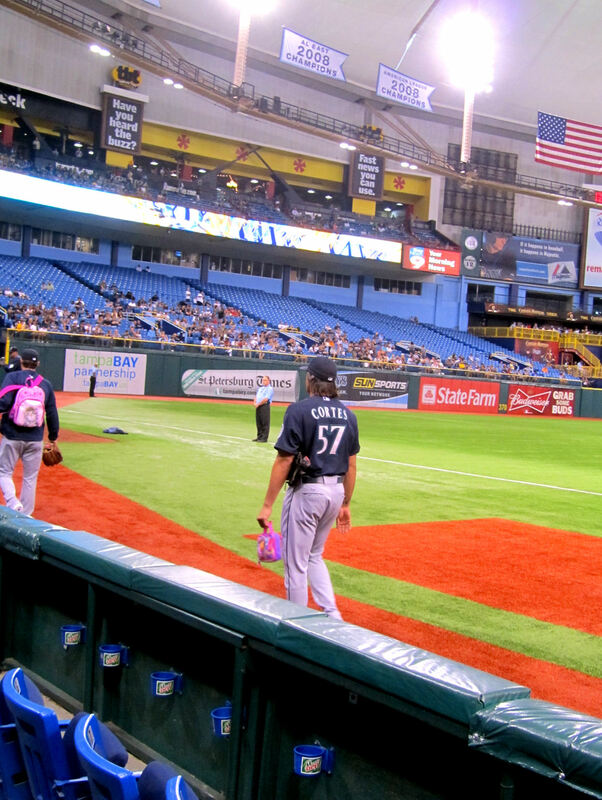 While we were in the rays tank area (you only get 8 minutes in there, something I did not yet know at this point), Felix Hernandez came out to warm up. 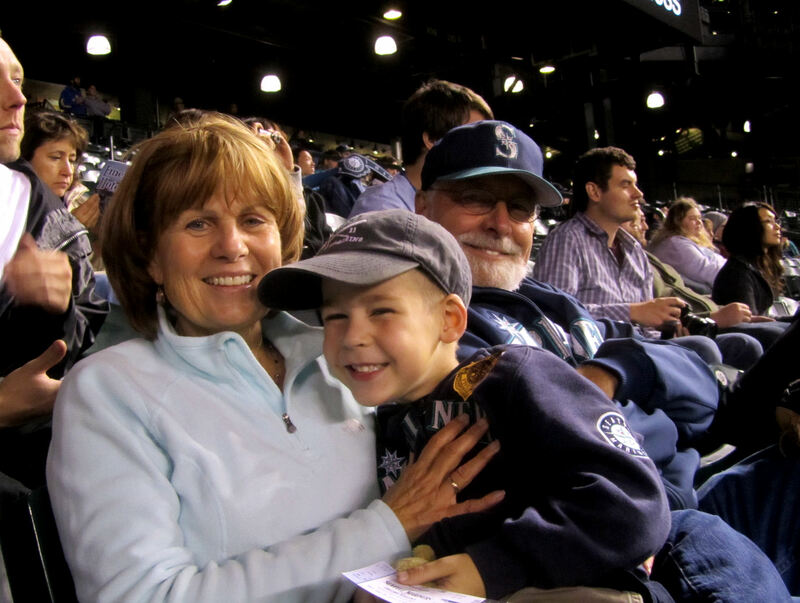 I entrusted Tim to his grandparents’ care and headed off to watch Felix. 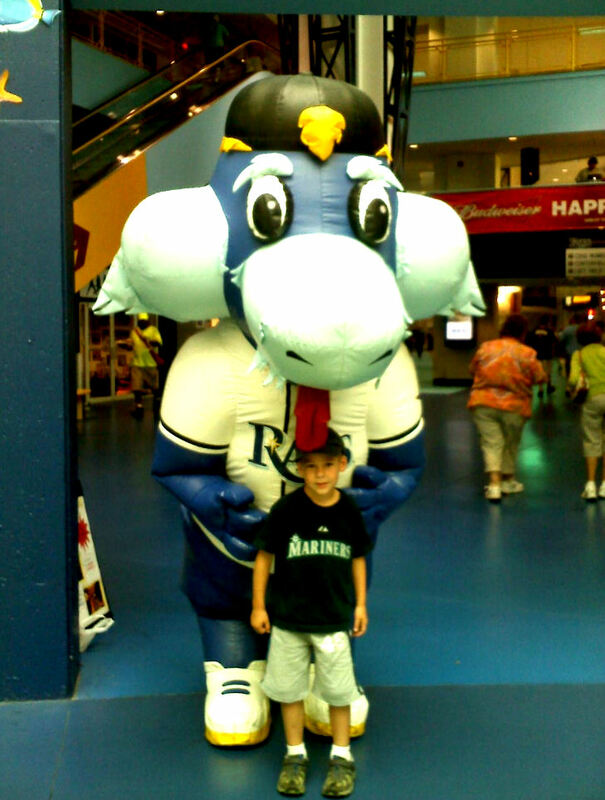 That is Raymond, the Rays’ mascot. 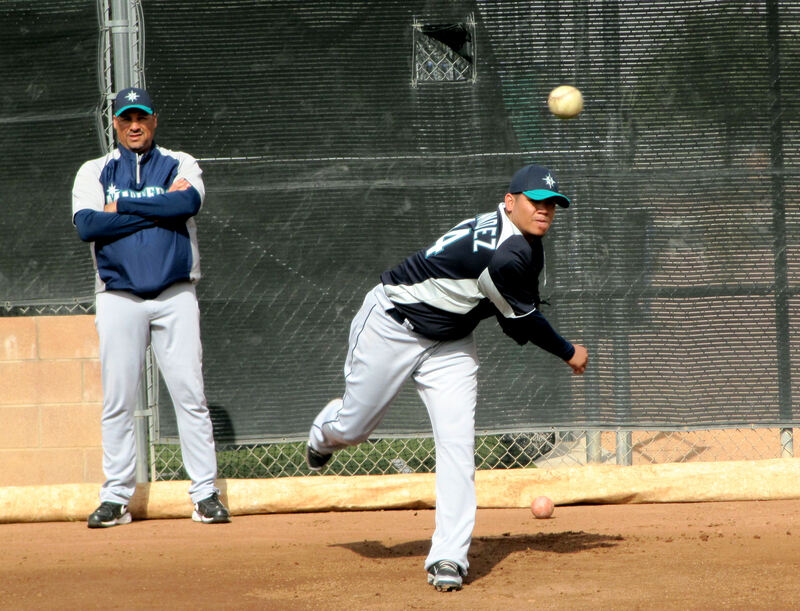 But interestingly, it isn’t the normal Raymond. 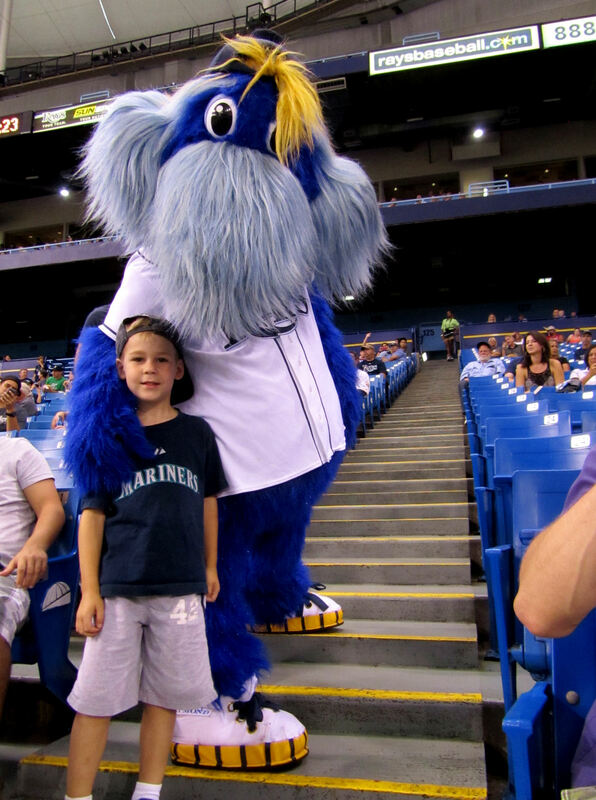 The normal Raymond is fuzzy, like most mascots. 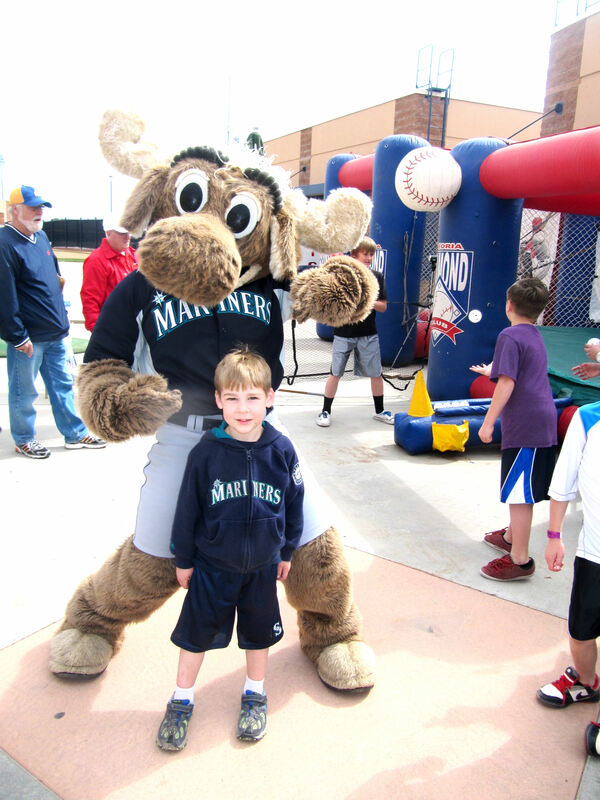 This Raymond was a big inflatable guy. 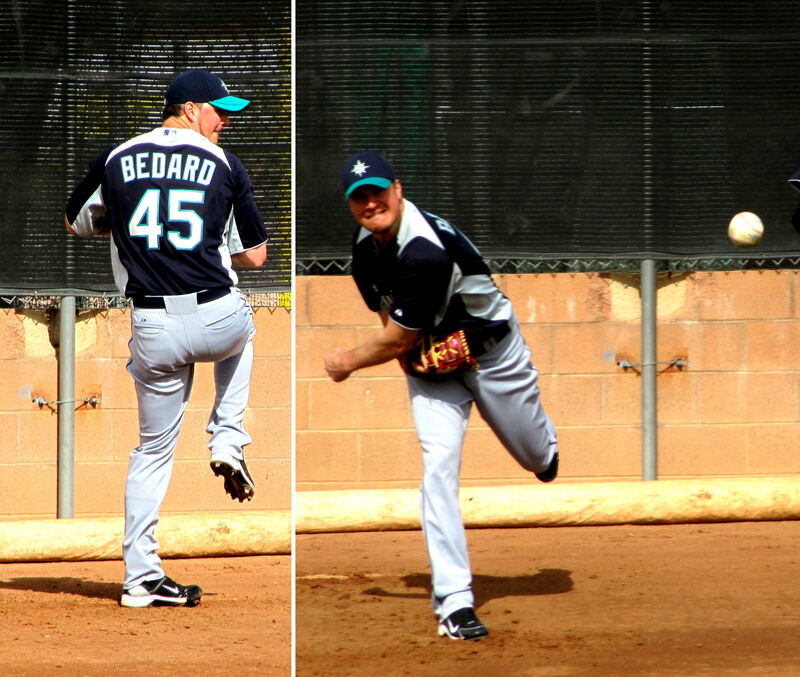 …as I watched Felix run through his pre-game routine. 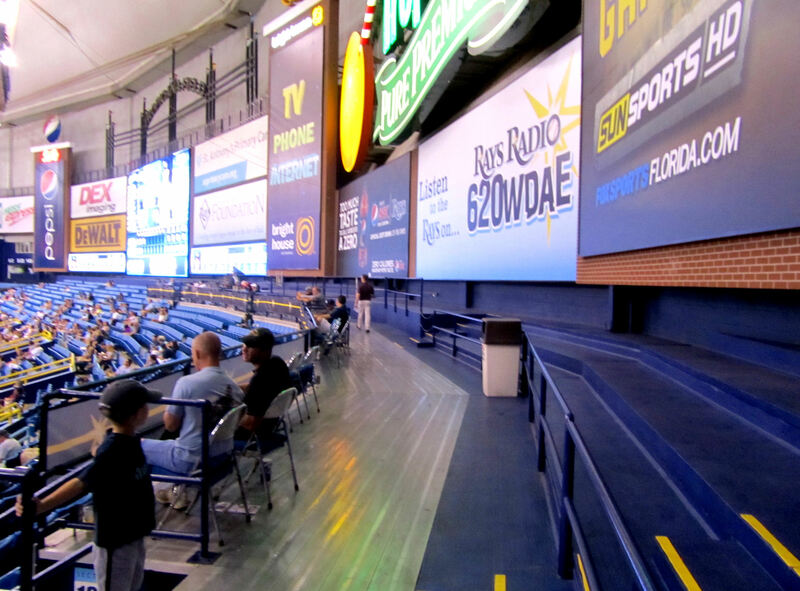 By the way, at Tropicana Field, odd numbered sections are on the 3B/LF side and even numbered sections are on the 1B/RF side. 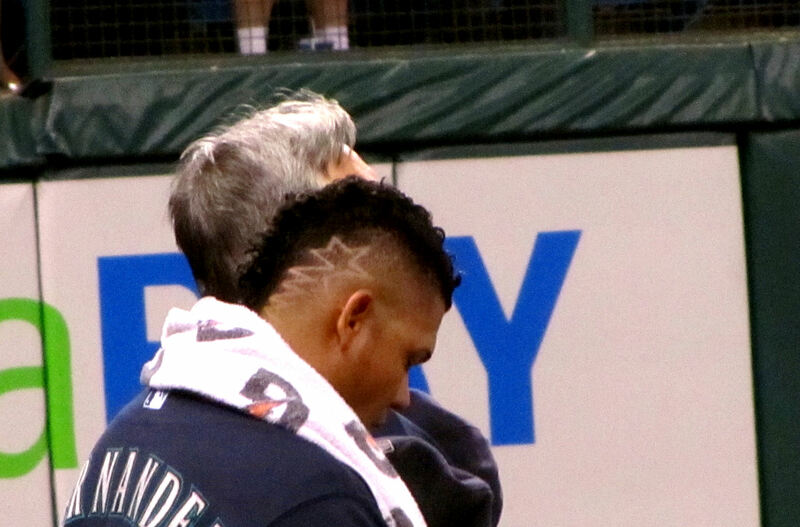 …complete with stars shaved into the side of his head. 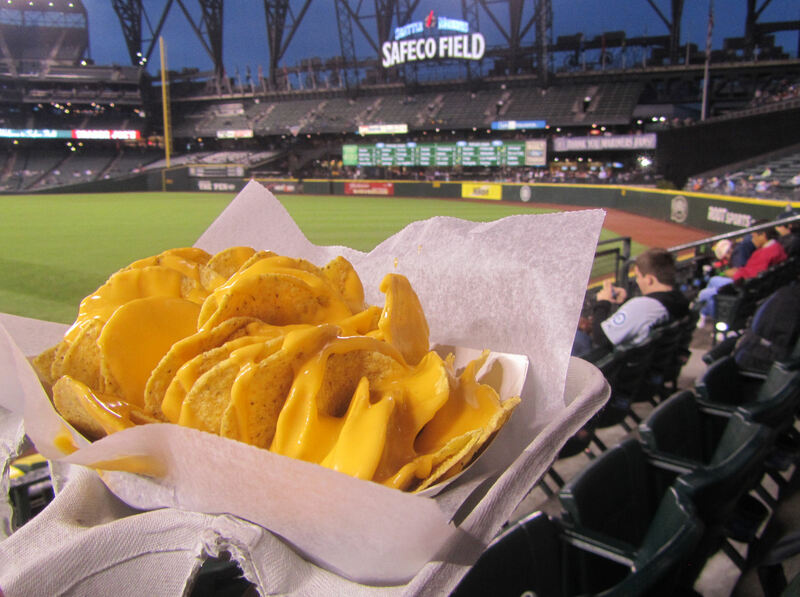 …would start it off hot for the Mariners. 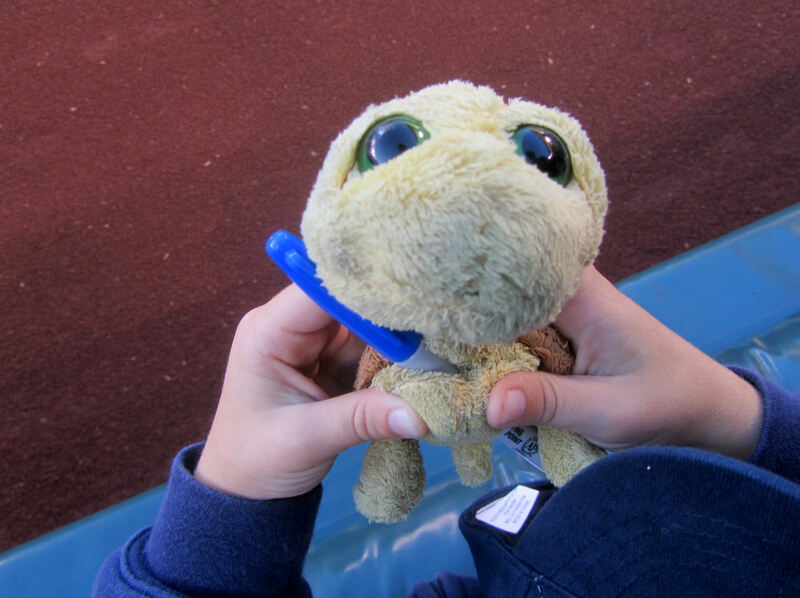 Unfortunately, he popped out foul to the catcher. …and a all-you-can-drink diet coke (actually, it was probably diet pepsi). And I drank a whole lot of diet pepsi to make sure I got my money’s worth. 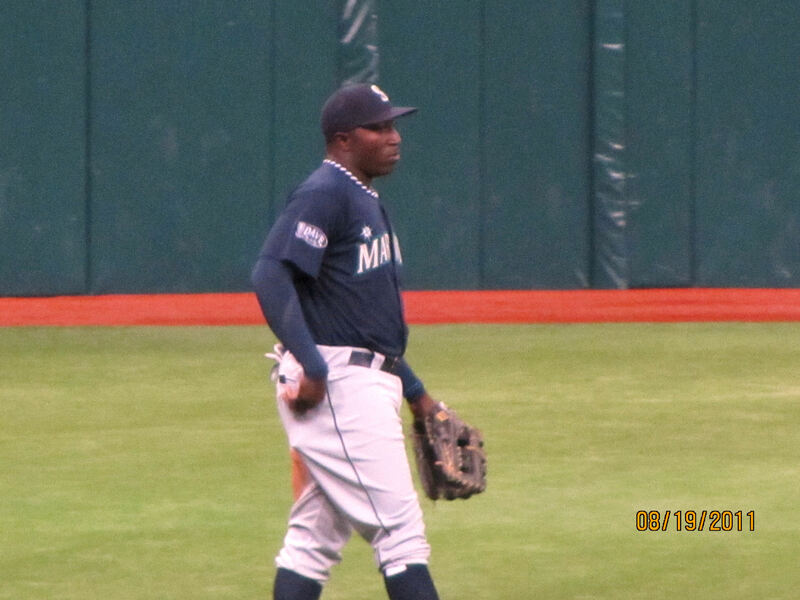 Two minutes later, Raymond was standing two rows behind our seats taking pictures with fans. Oh, well. The chase was part of the fun. 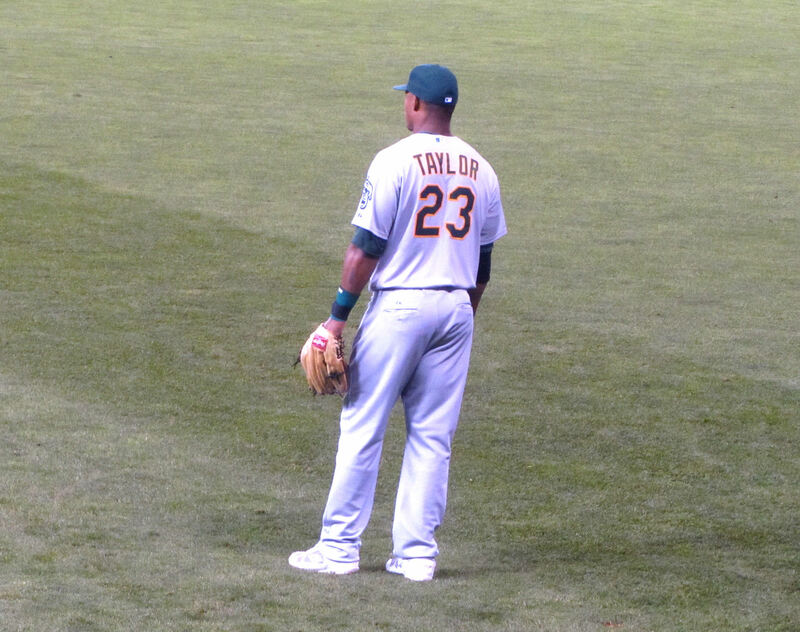 …, was playing LF and was standing directly out from our seats most of the game. 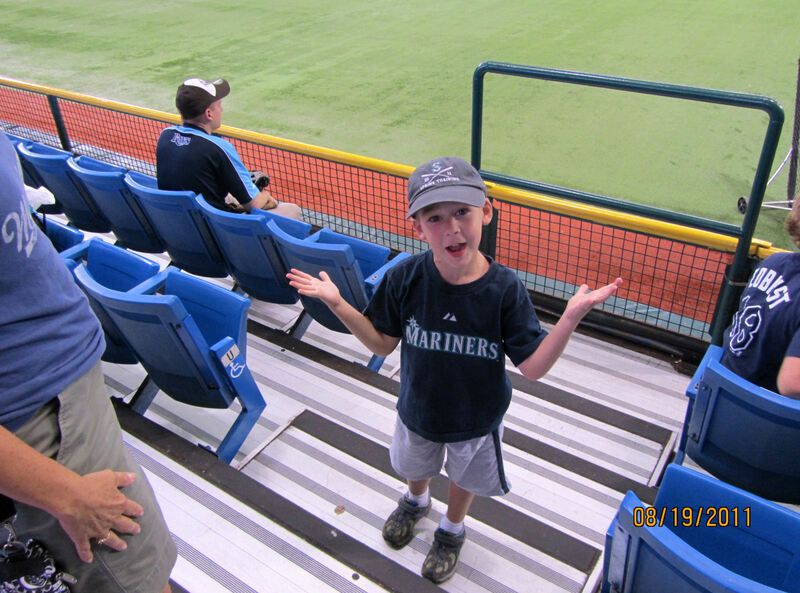 After the Mariners failed to score in the top of the first. 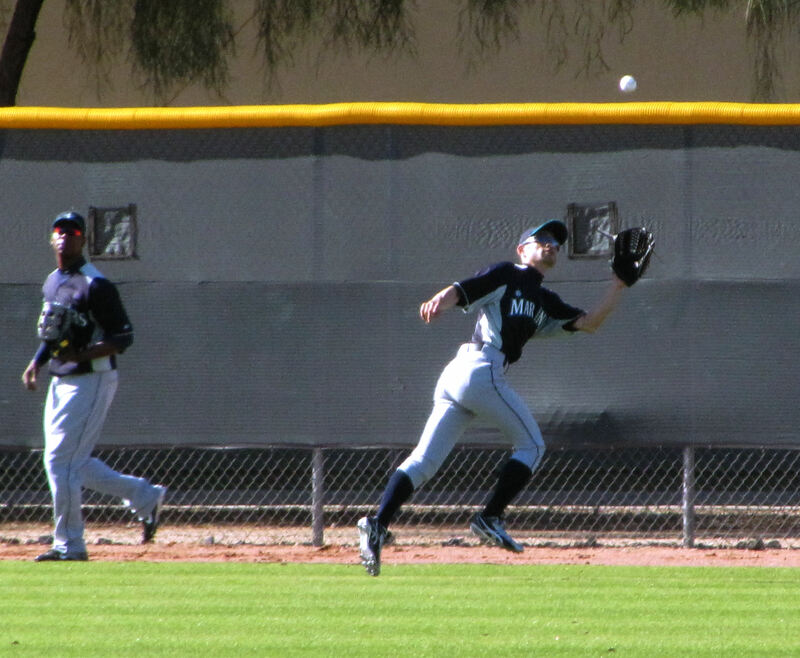 Robinson made a brilliant diving catch on a liner to LCF to retire the first Rays batter of the game in the bottom of the first. 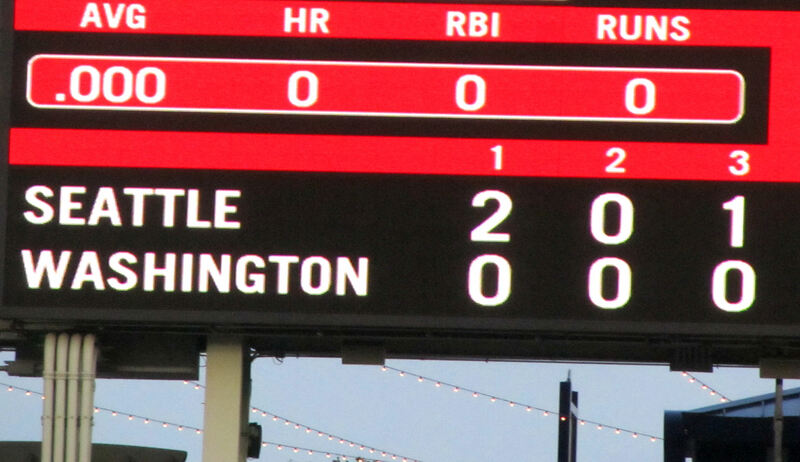 The game was scoreless through the first and second innings. 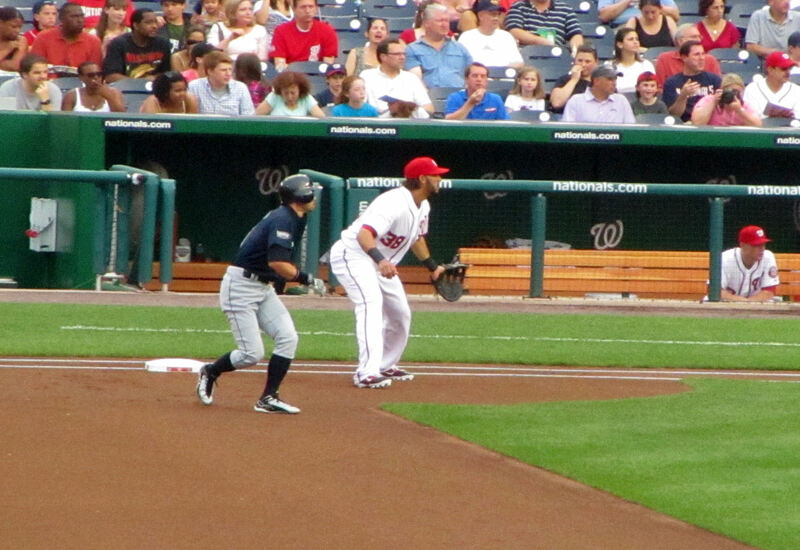 Robinson then led off the third with a double to RF. 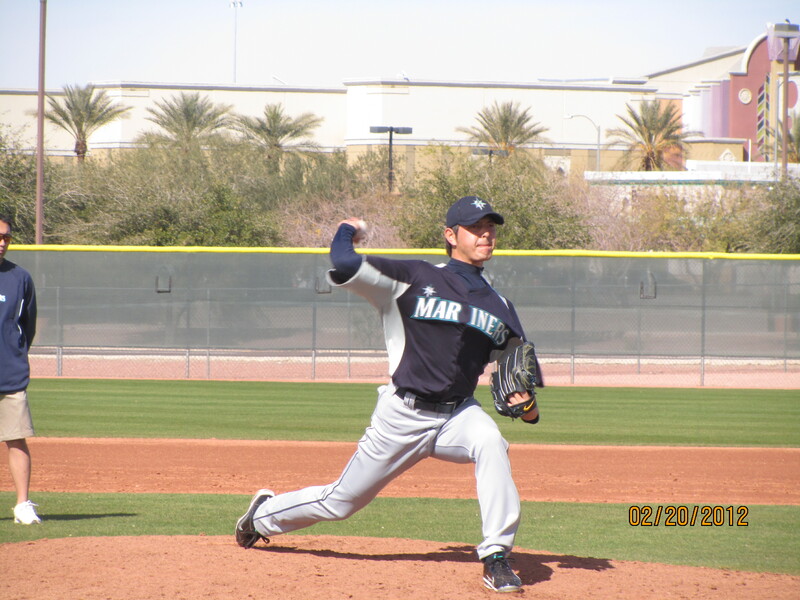 He took second on a groundout by Ichiro. 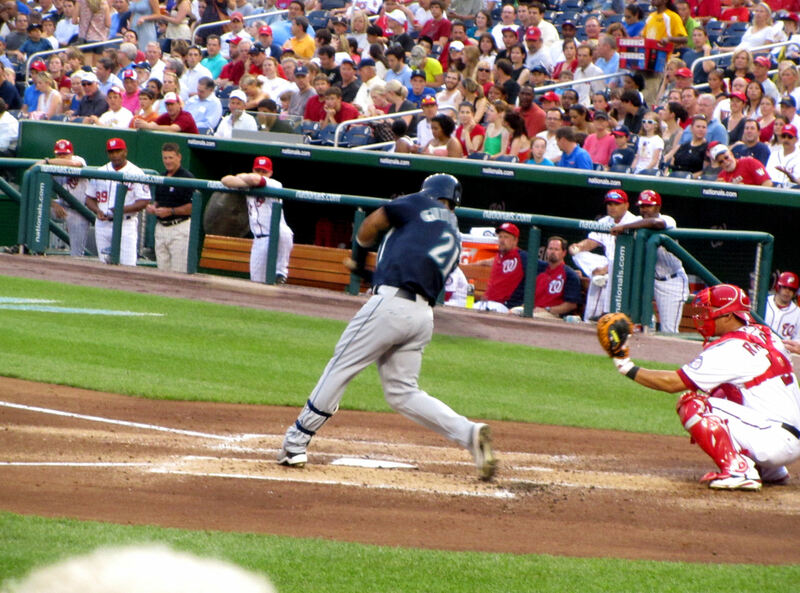 Trayvon then scored the first run of the game when Franklin Gutierrez grounded to short stop Sean Rodriguez who threw the ball way (also allowing Gutierrez to take second). It was time for Tim and I to go on a little adventure. 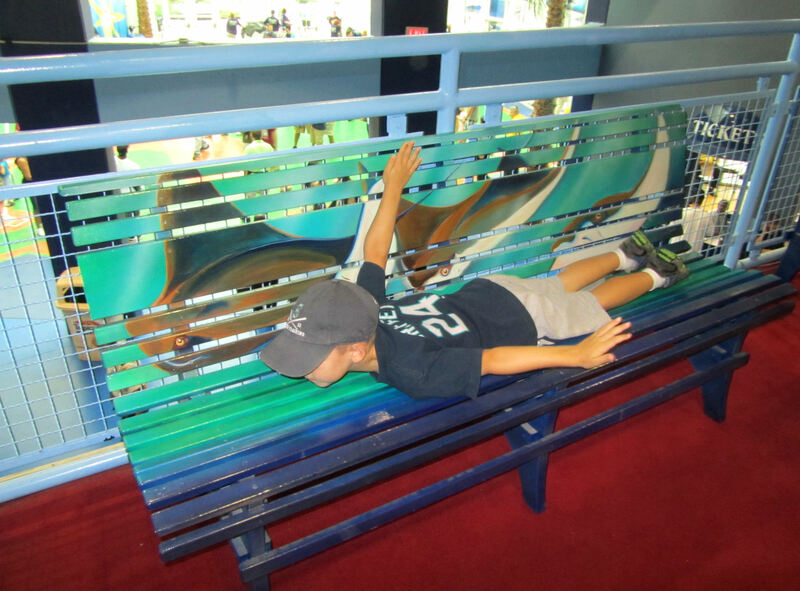 He wanted to go see the rays tank and I wanted to go take Tim’s picture with his Ichiro baseball and the Tropicana Field sign for the myGameBalls.com photo scavenger hunt. I have no clue what the blue risers are behind the cross-aisle. 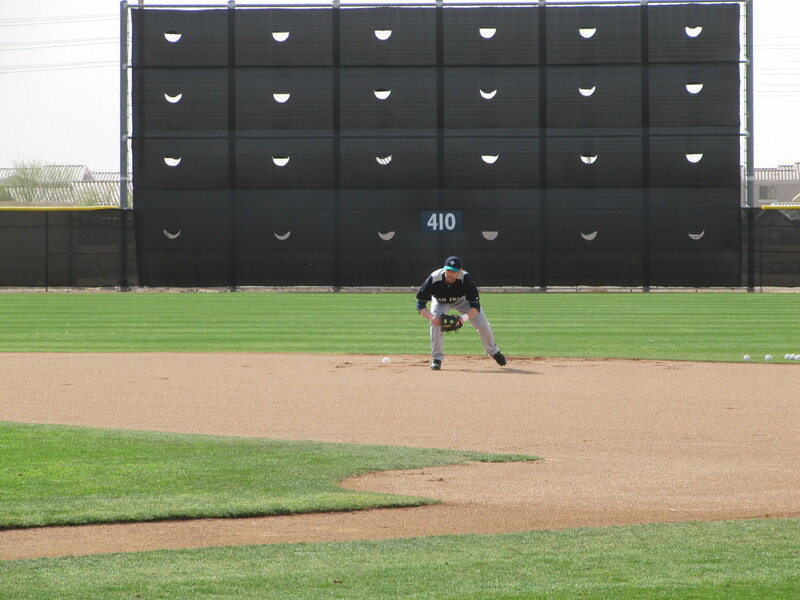 But then Franklin Gutierrez grounded into a double play. 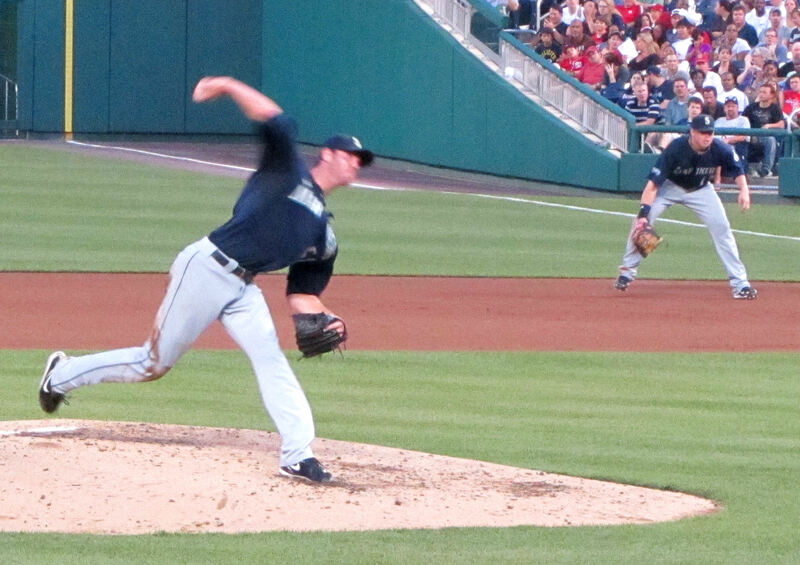 An Adam Kennedy strike out later, the top of the fifth inning was history. 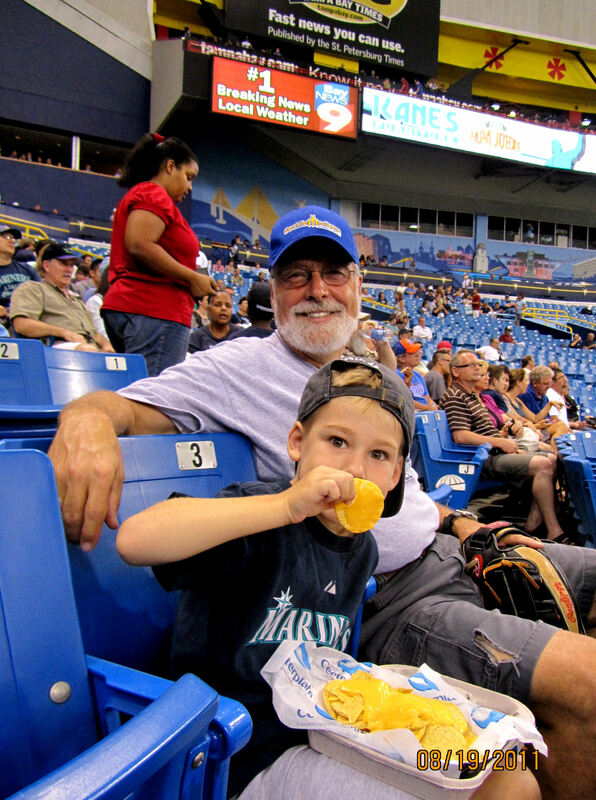 Unfortunately, the Rays tied it up 1-1 in the bottom of the fifth with a run manufactured by B.J. Upton. 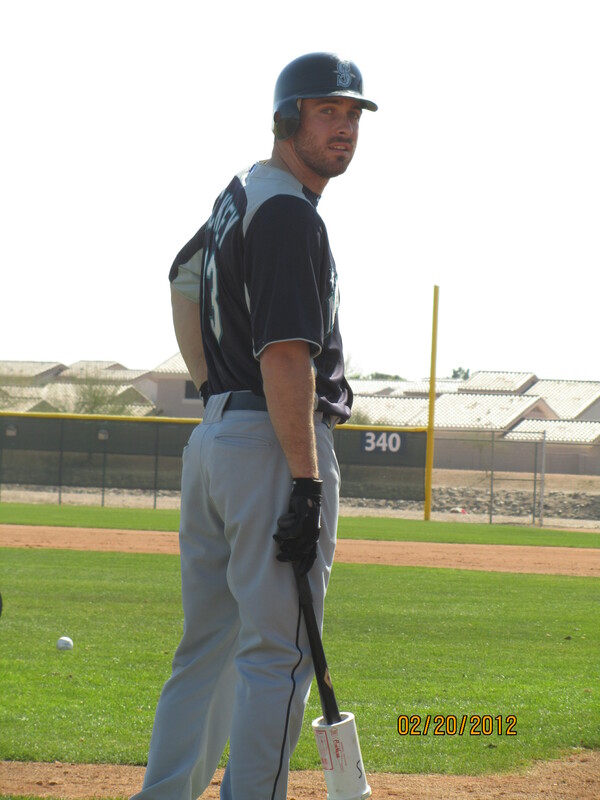 After singling on a weak grounder past Adam Kennedy at third, he stole second, stole third, and scored on a bunt by John Jaso. 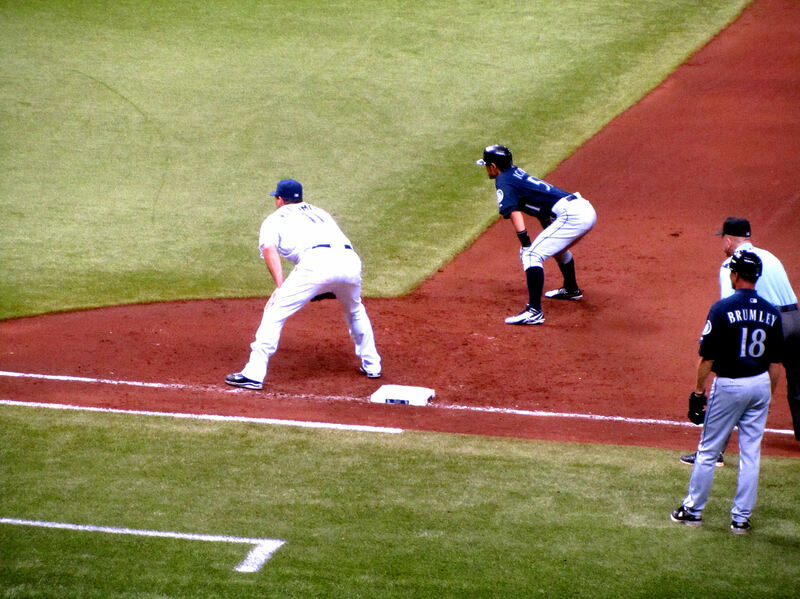 The worst part about it is that Upton should have been out at first. Adam Kennedy didn’t get in front of the ball. Instead he ole’d it right into a single. 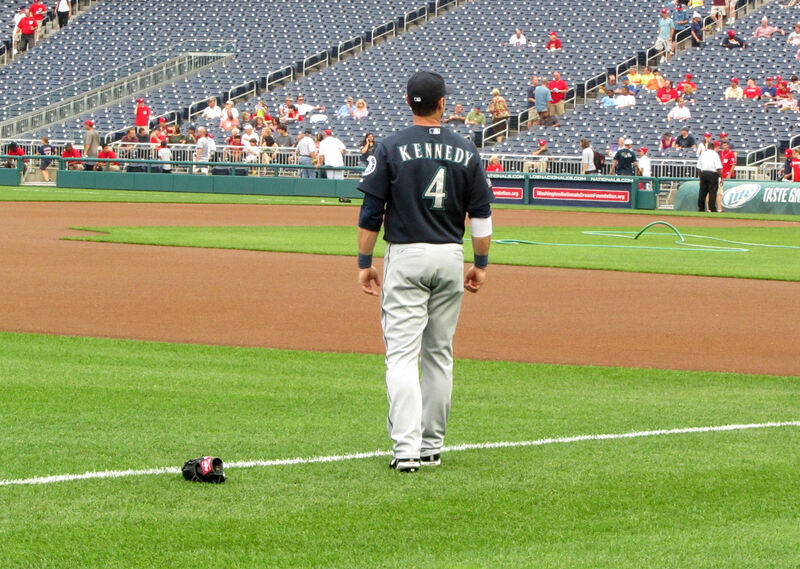 Unfortunately, this would not be Kennedy’s only botched play on the day…so stay tuned. 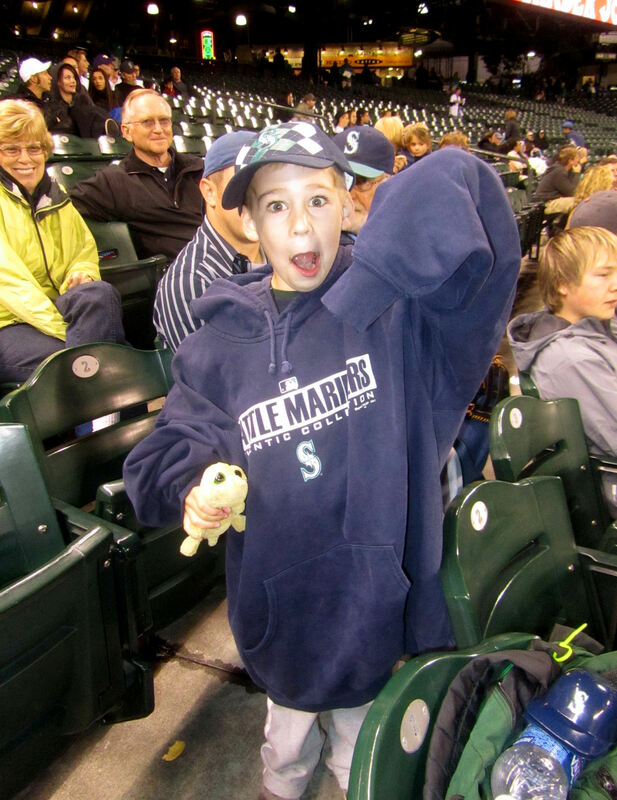 …and then things fell apart for the Mariners. 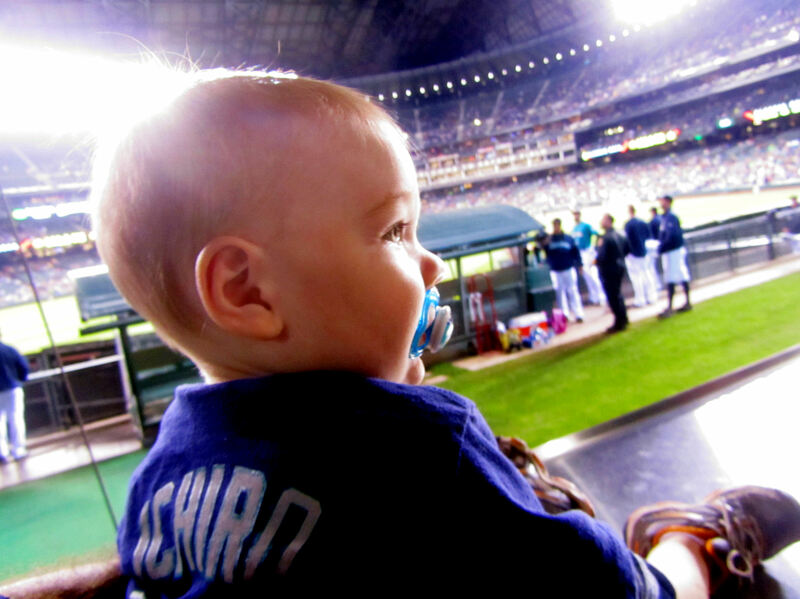 One more out and the Mariners would head to the ninth with the 2-1 lead intact. 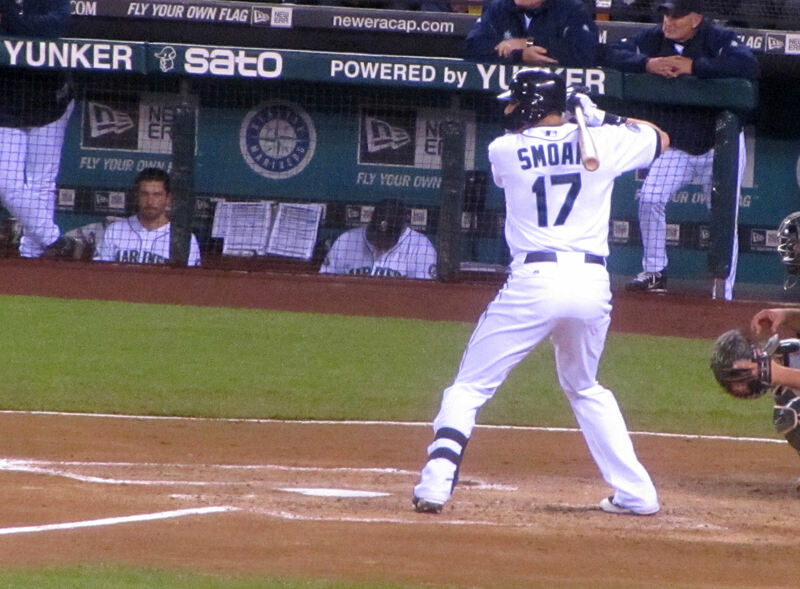 Felix pumped strike one and strike two over the plate. 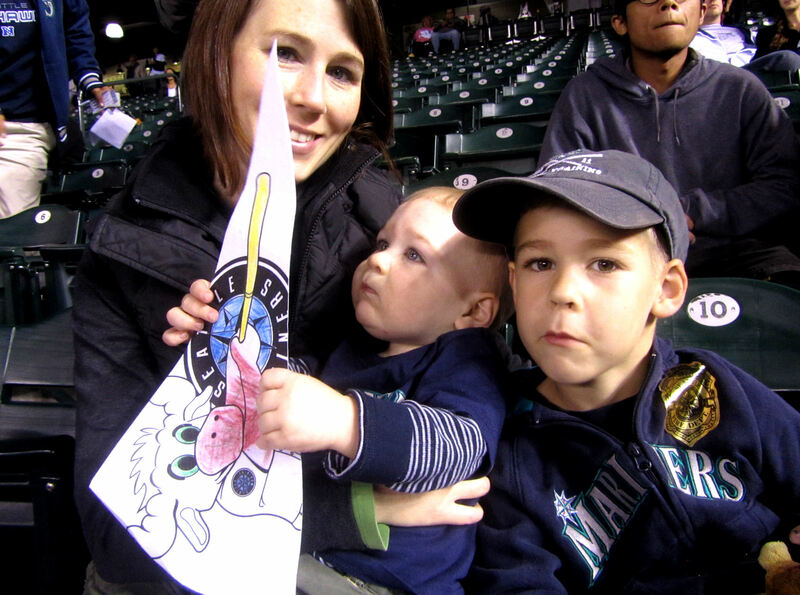 One more strike and the Mariners could stick a fork in the eighth. 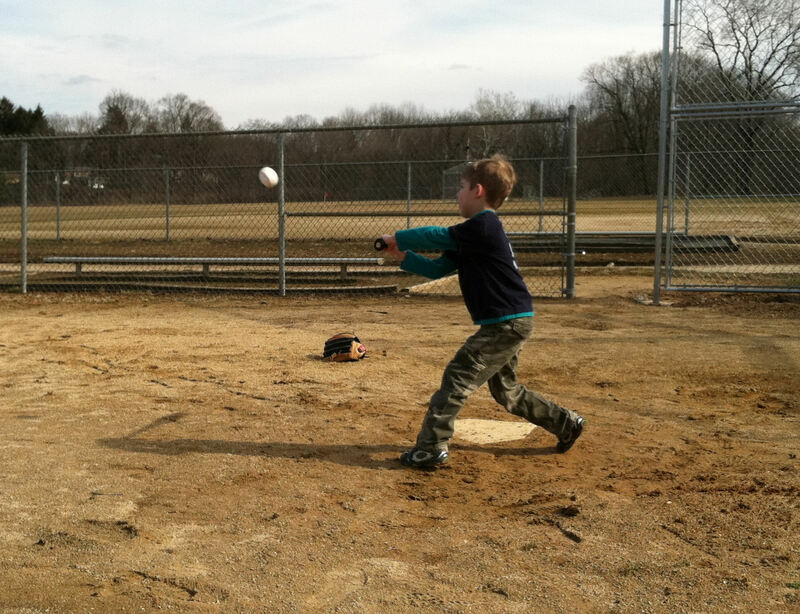 But then Damon hit a grounder between third and short stop. Kennedy moved like a slug over to get it. 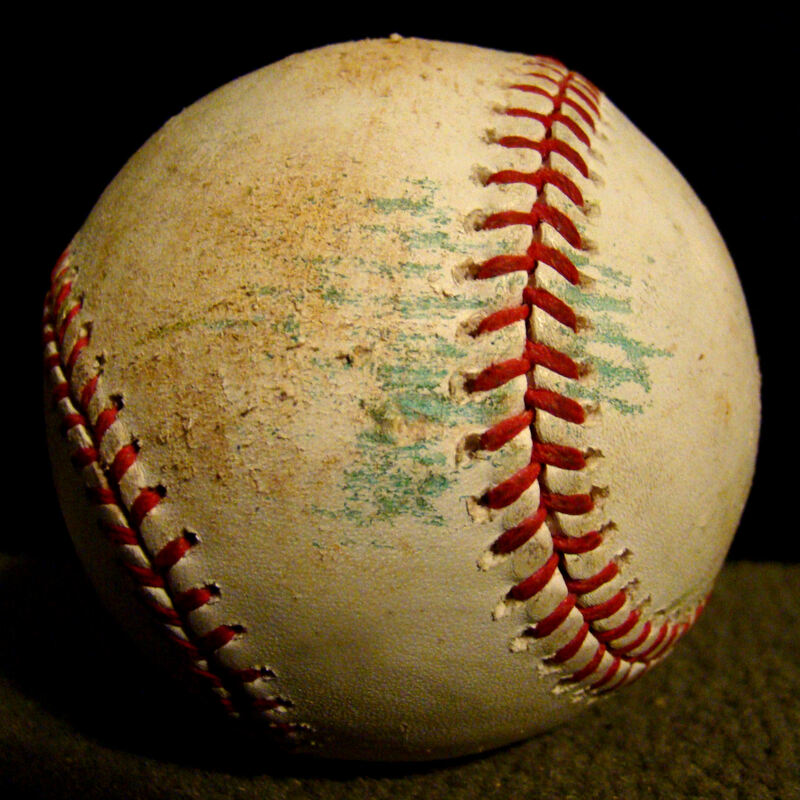 He double or triple or…I don’t know…infinity-clutched the ball. I yelled, “AAAAAAHHHHHHH, GET RID OF IT!!!!! !” And then Johnny Damon crossed first base safe. Any other day, Kennedy makes that play. 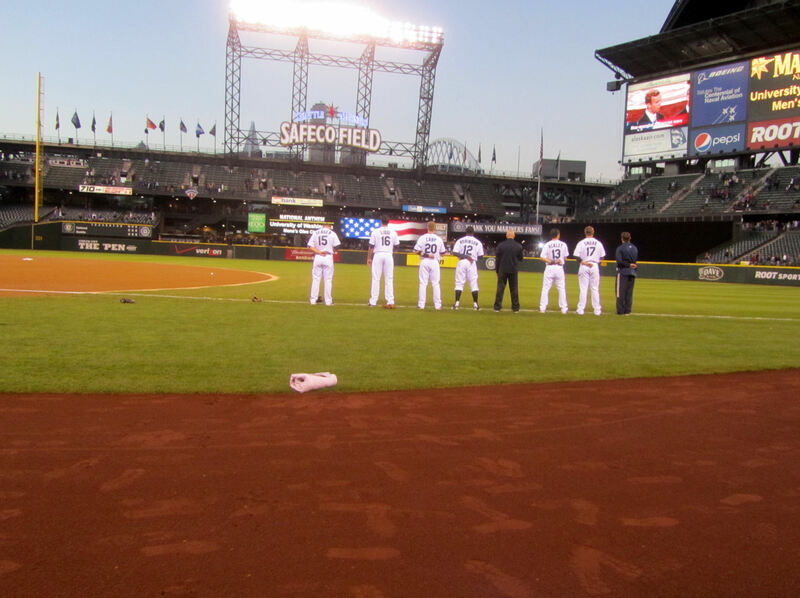 Kyle Seager, Chone Figgins, Jose Lopez, Adrian Beltre, Scott Spiezio, Jeff Cirillo, David Bell, Russ Davis, Mike Blowers, Edgar Martinez, Jim Presley, Jamie Allen, Manny Castillo, Dan Meyer, Ted Cox, Bill Stein, and anyone else who has ever played a single game at 3B for the Mariners would have made the play. 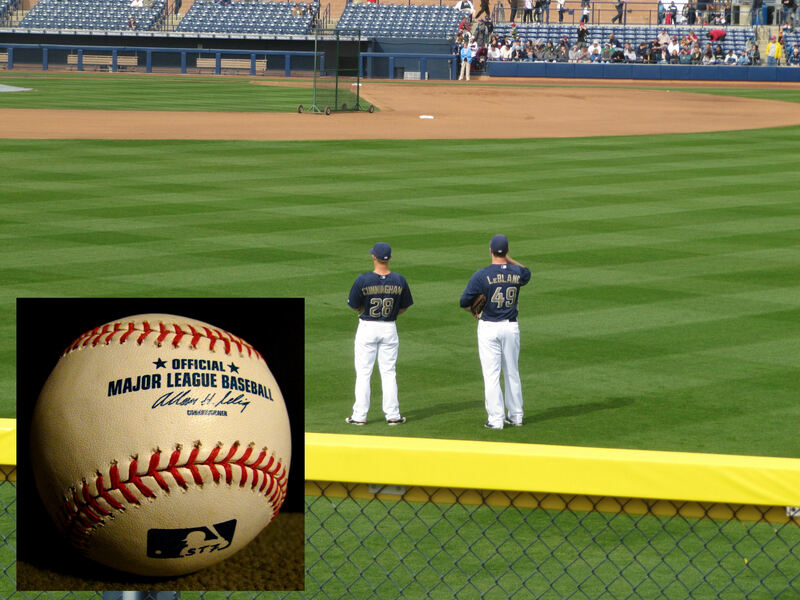 In fact, they would have made the out at either 2B or 1B. 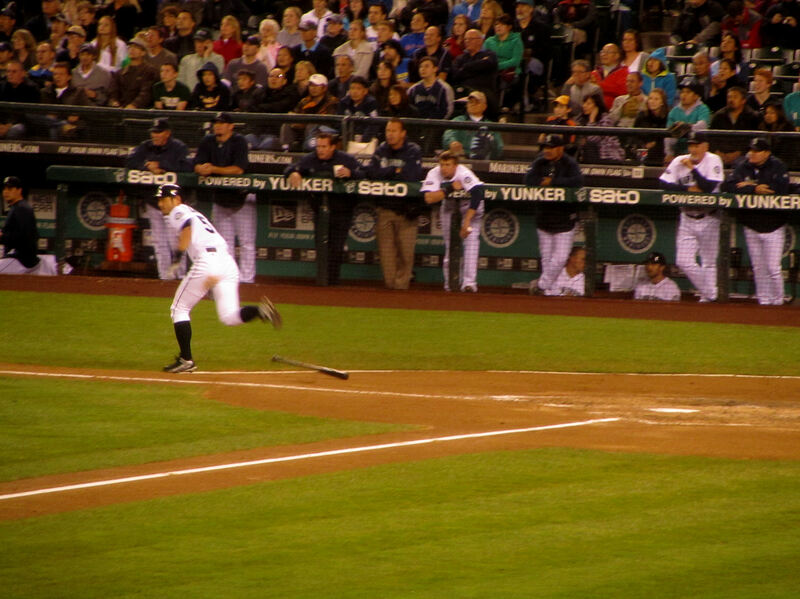 But this was this day, and it was Adam Kennedy (who had already cost Felix a run) was at third, and the play was not made. 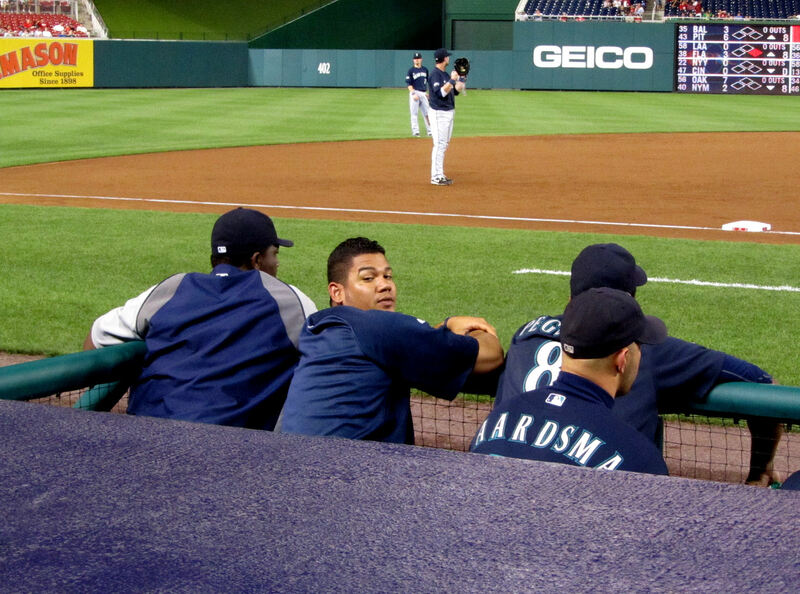 As great as King Felix is, he does not always respond well to boneheaded misplays. And he did not respond well at this game. 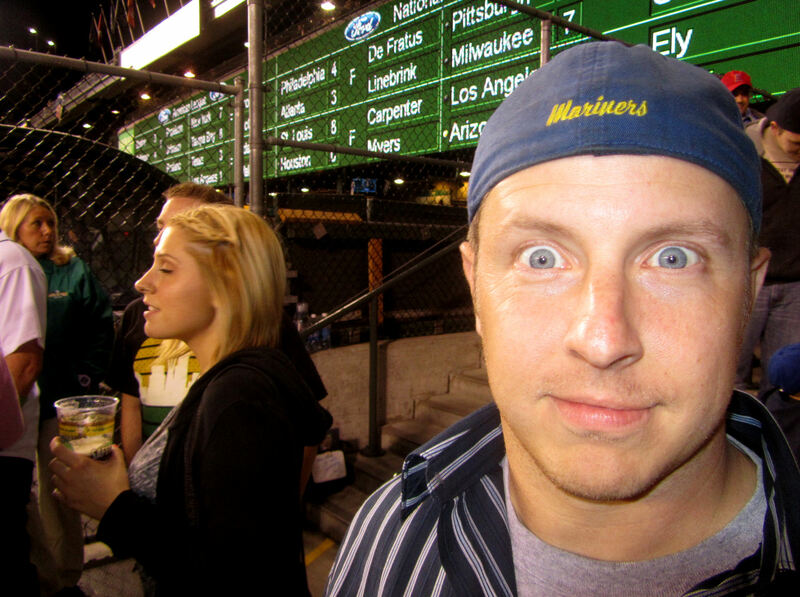 So Evan Longoria and Ben Zobrist both followed with RBI singles. A few minutes later, game over. 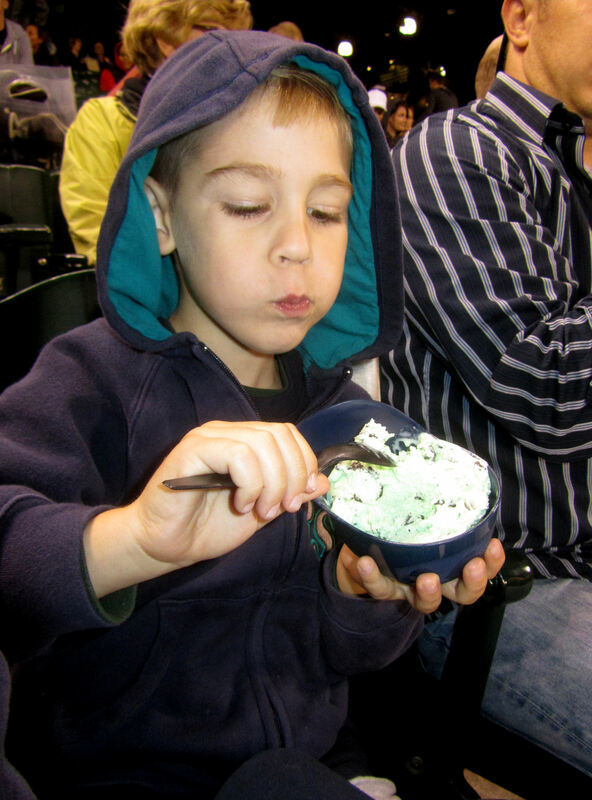 Mariners lose. It was a tough, tough loss. 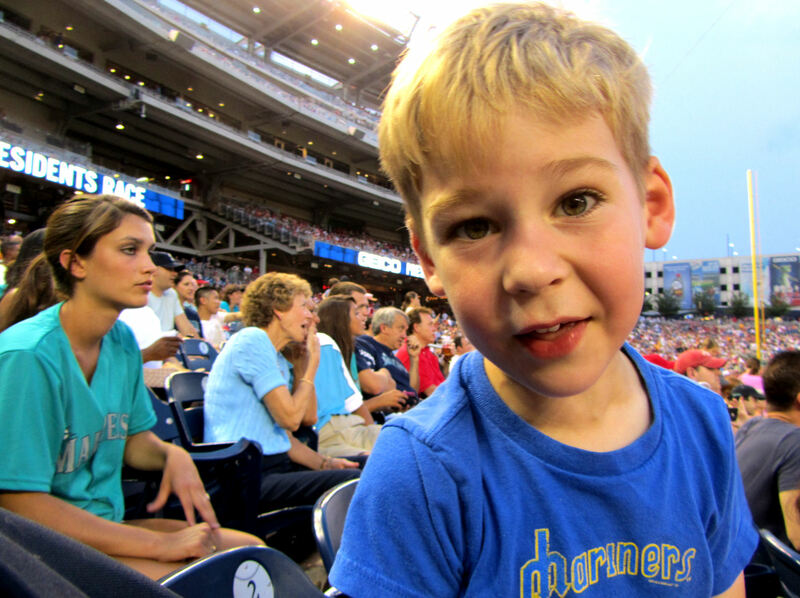 …and when my Mom and Tim finally arrived (and the lights had been turned down), I got a bonus picture of Tim. Tim requested that it be a *thumbs up* photo. See all of those people on the field? 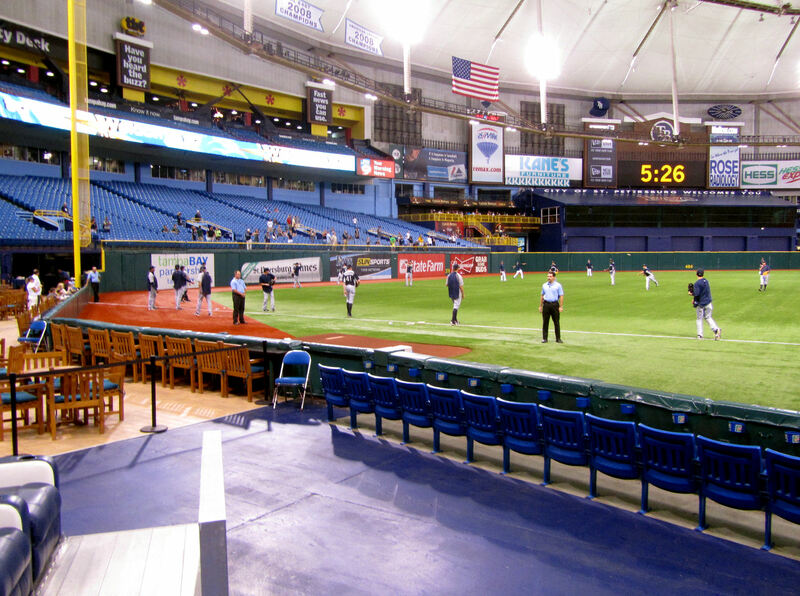 On Friday nights, the Rays turn off the main lights, turn on some disco lights and dance music, and let fans leave the game by walking across the field to an exit in CF. 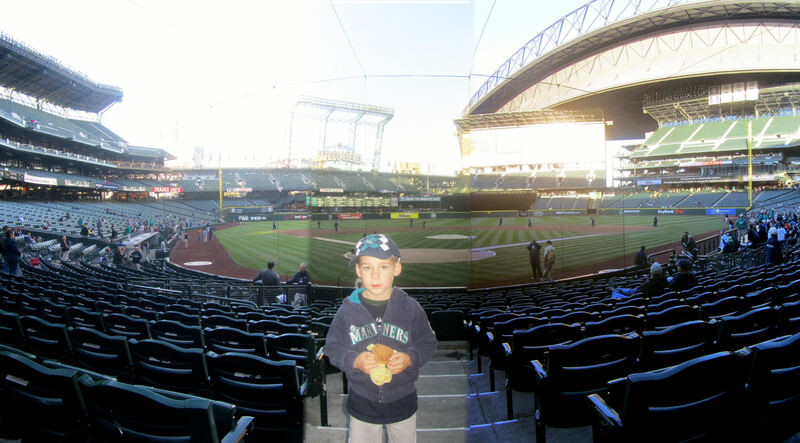 If you click on that picture to enlarge it, you can see Tim dancing on both sides of the panorama. …we called it a night. 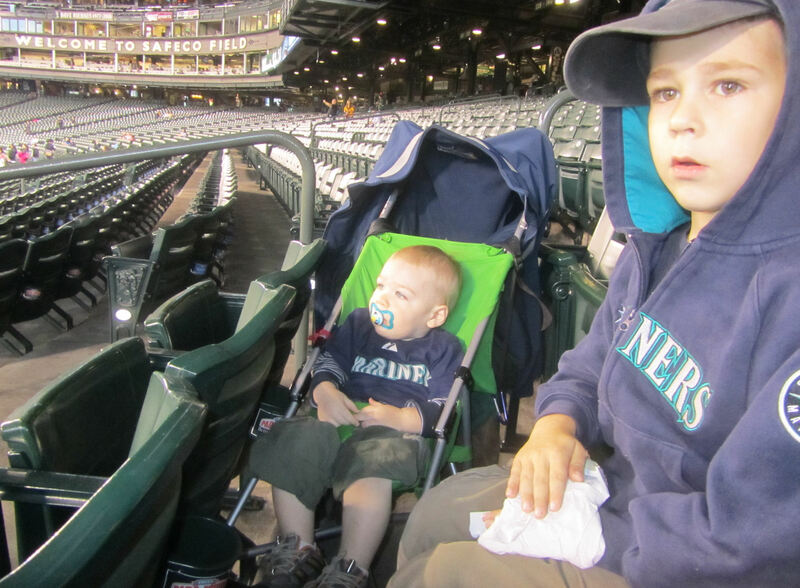 We’d be back again the next day (August 20, 2011) hoping for our first Mariners win of the season. 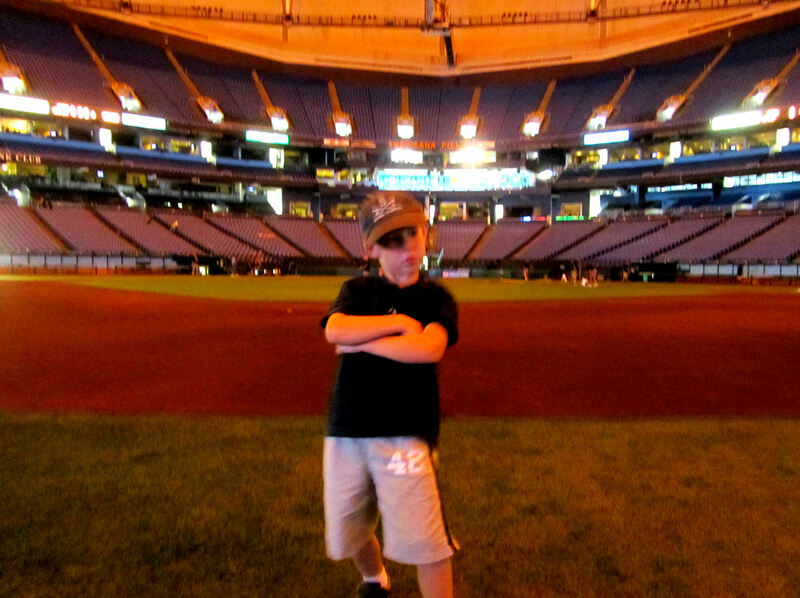 I have to say, despite the crushing Mariners loss, I really liked Tropicana Field. 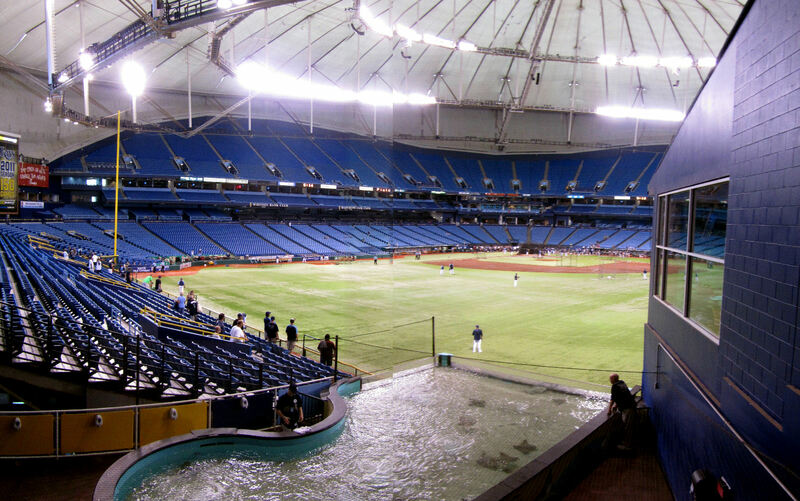 I grew up among rumors of the Mariners moving to St. Petersburg to play in this very building. 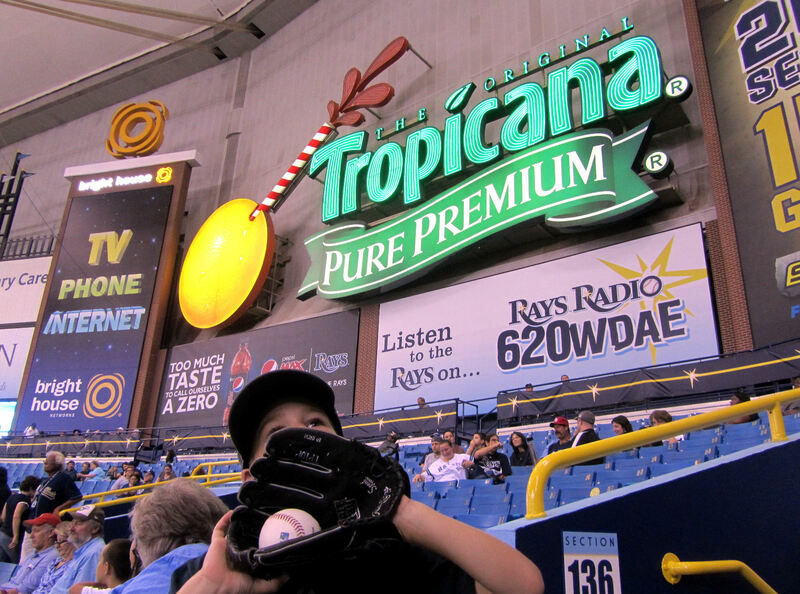 Because of that, I’ve always had negative feelings about Tropicana Field. 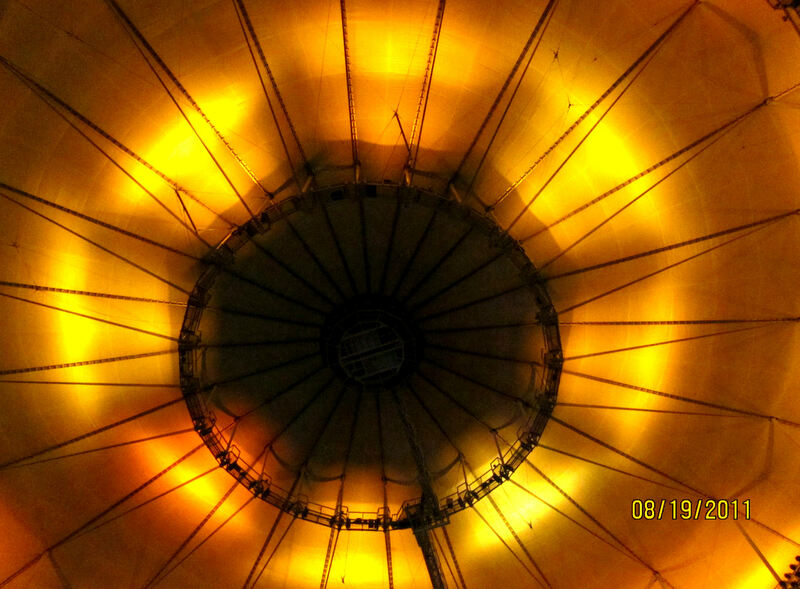 But I grew up going to and absolutely loving the Kingdome. 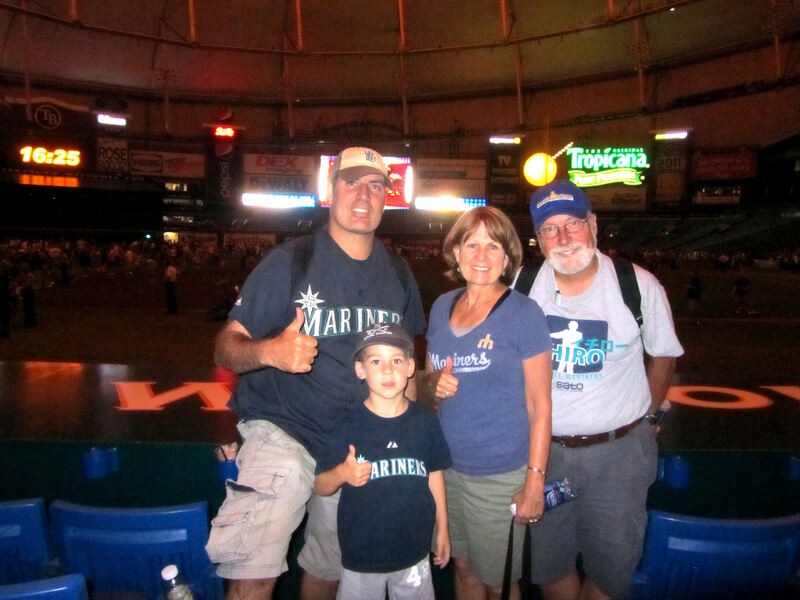 And like the Metrodome in 2009, I felt right at home at Tropicana Field, a great little domed stadium. 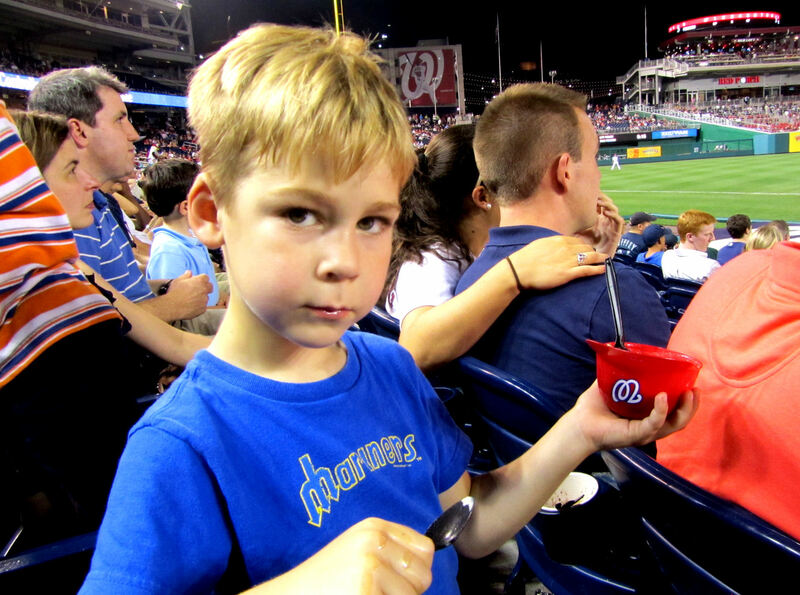 19 Ice Cream Helmet(s) (Orioles (2), Nationals, Phillies (2), Rangers (2), Mets (1), Reds (1), Tigers (1), Marlins (2), Braves (2), Rays (1)). Okay. We’re two games into the regular season and I have finally reached our final Spring Training entry. 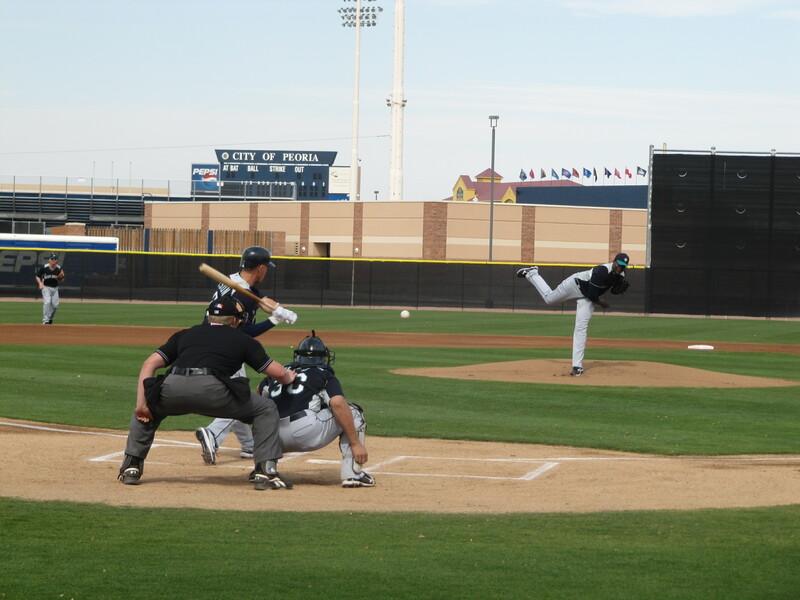 This is a split entry between a Mariners intrasquad game and the Mariners/Padres Fan Fest at the Peoria Sports Complex. 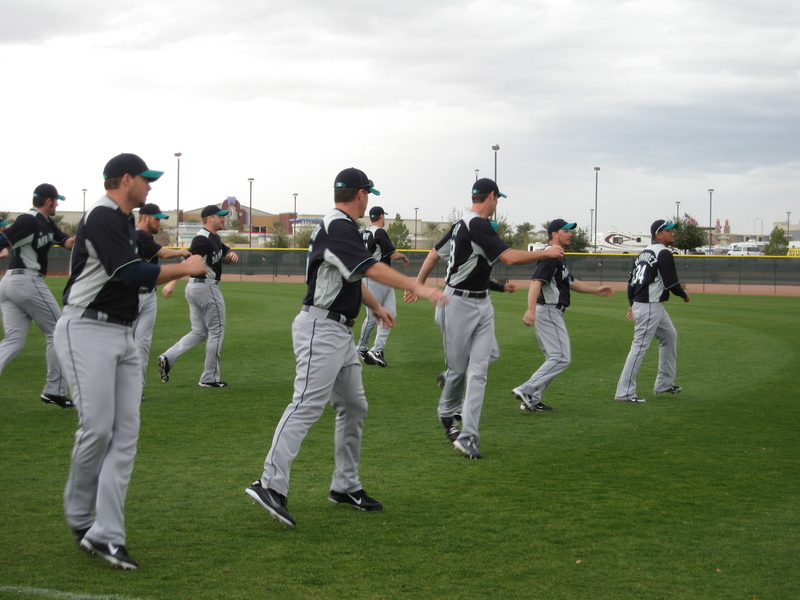 We went to Spring Training for the first week of full-squad work outs. 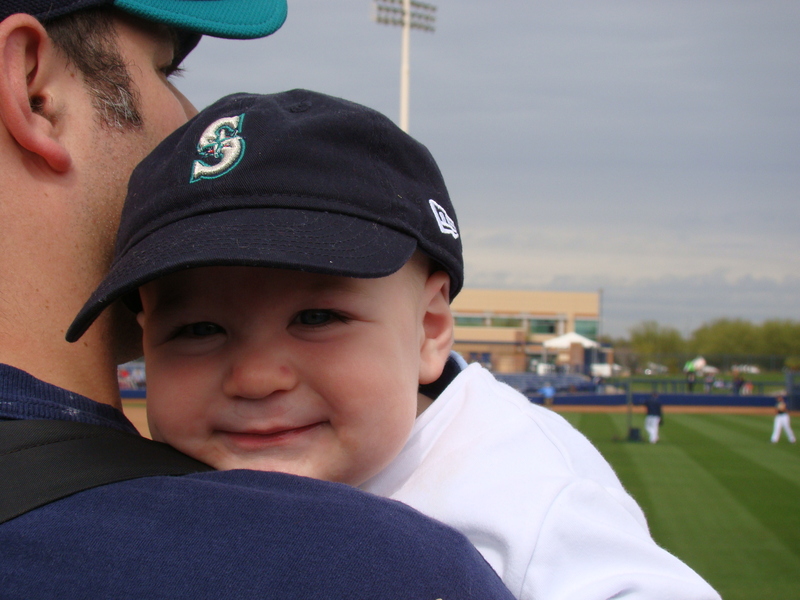 The first game against another team was the day we left. 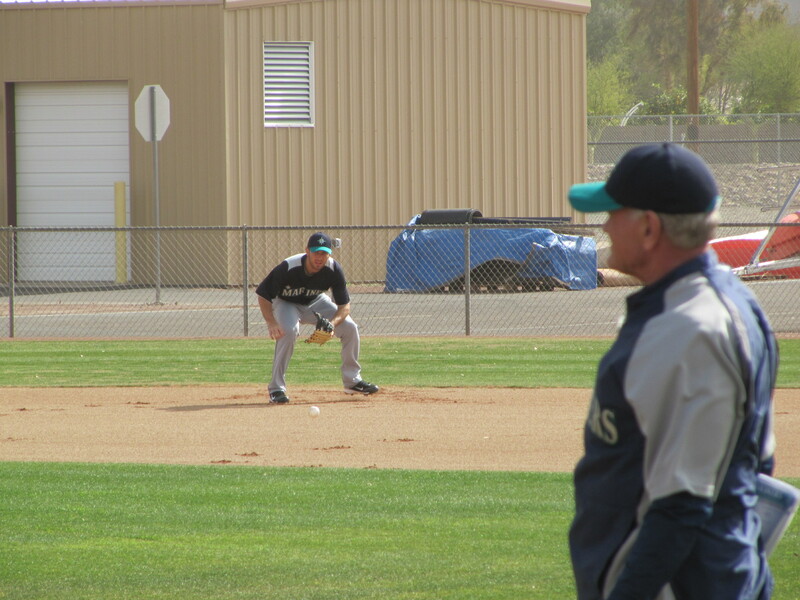 But two days before we left, the Mariners played an intrasquad game. 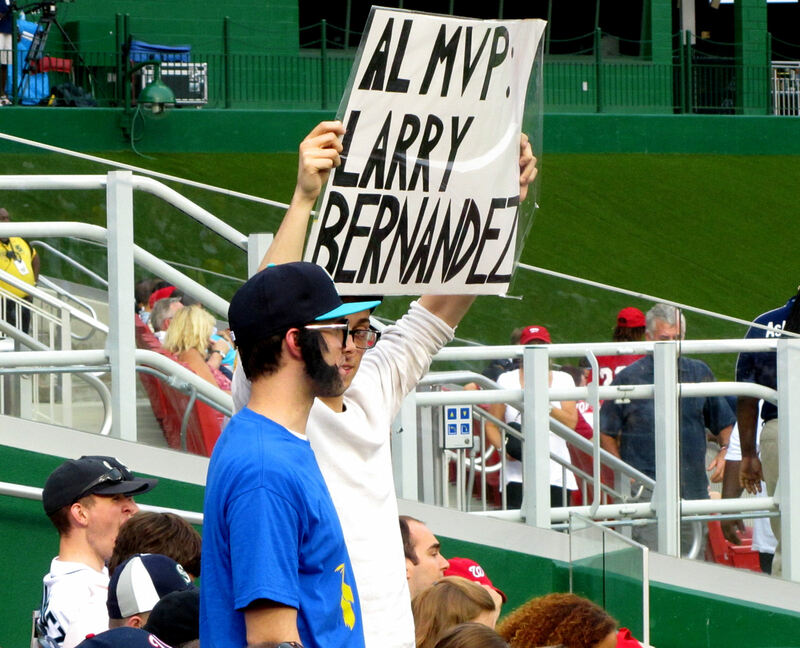 I’d never been to a Major League intrasquad game. It was pretty cool. 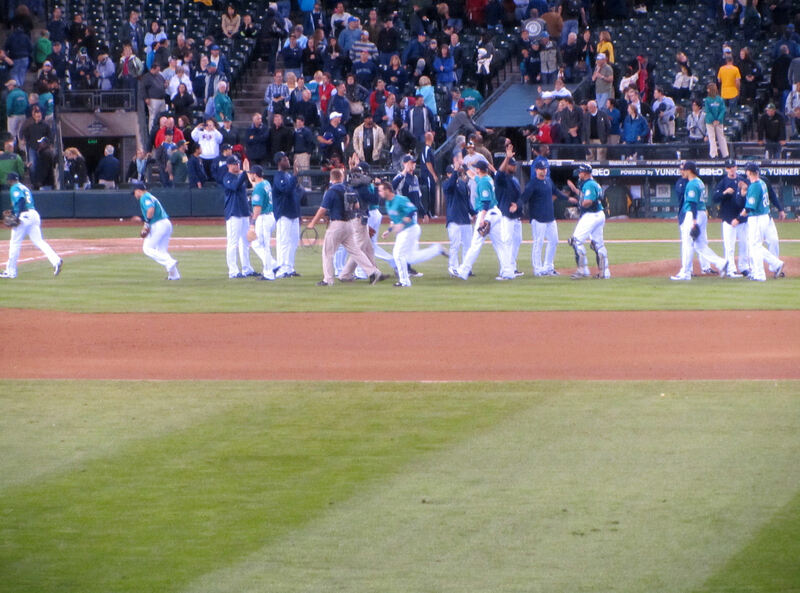 And the Mariners won! And he met a little friend (just to the left of Tim in the last picture) named Sean to play around with. 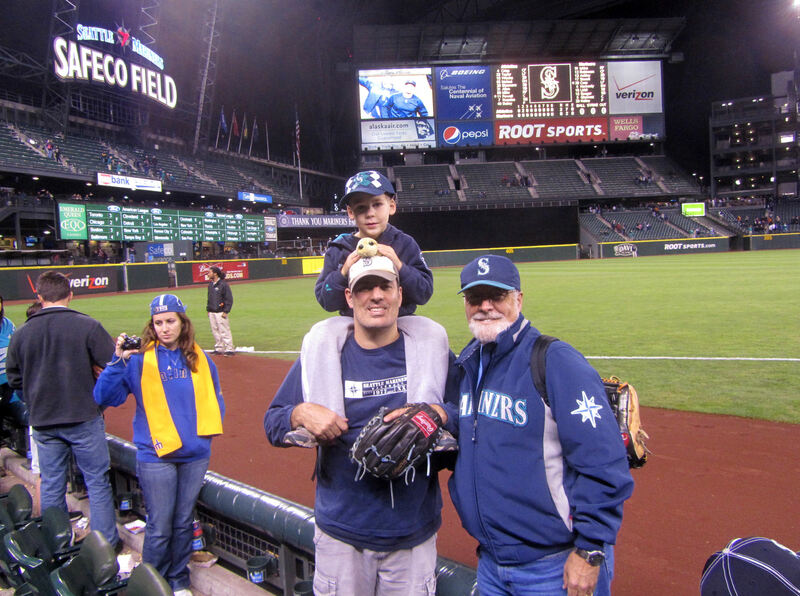 My dad and Sean’s dad, the guy with the blue shirt and glove right in the middle of the picture, were my main foul ball competition. 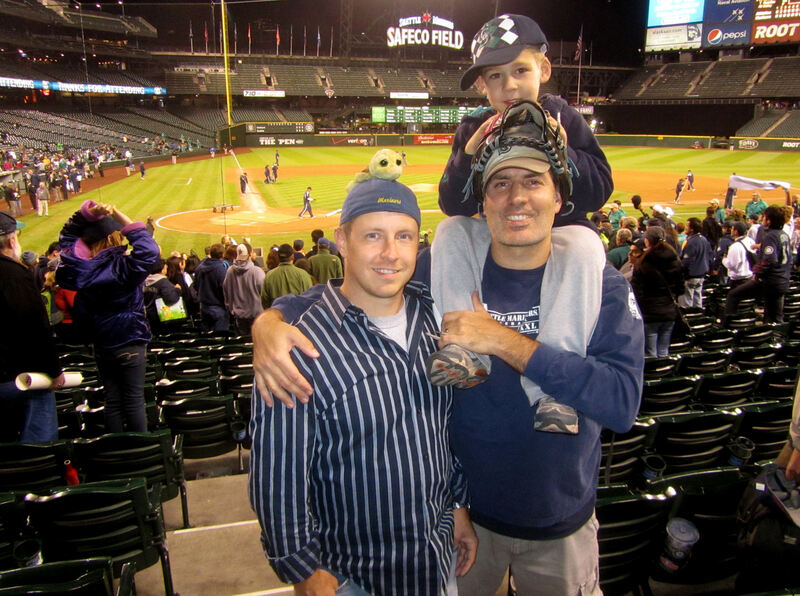 Both my dad and I only played for fouls until we got one, then we concentrated on watching the game. As that last sentence implies, yep, we both got one. 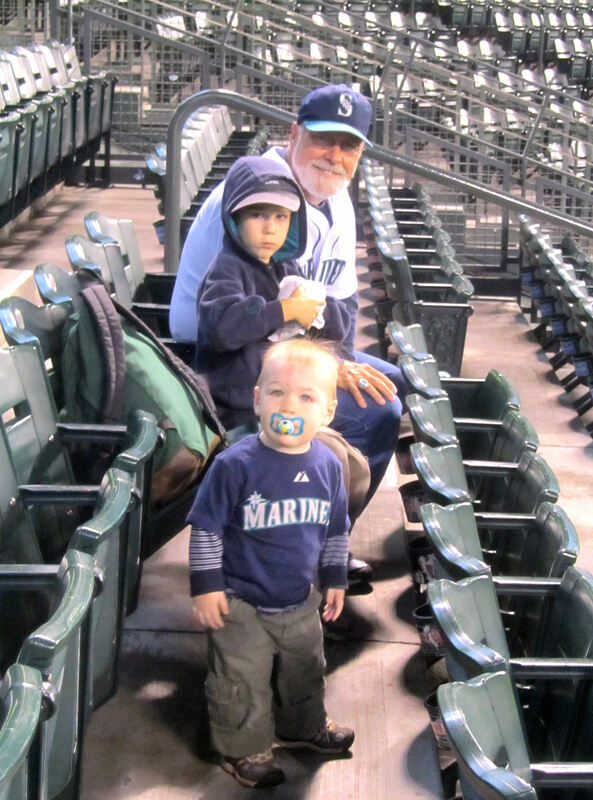 My dad generally set up in the grass behind the 3B dugout — about 1/2 way back. 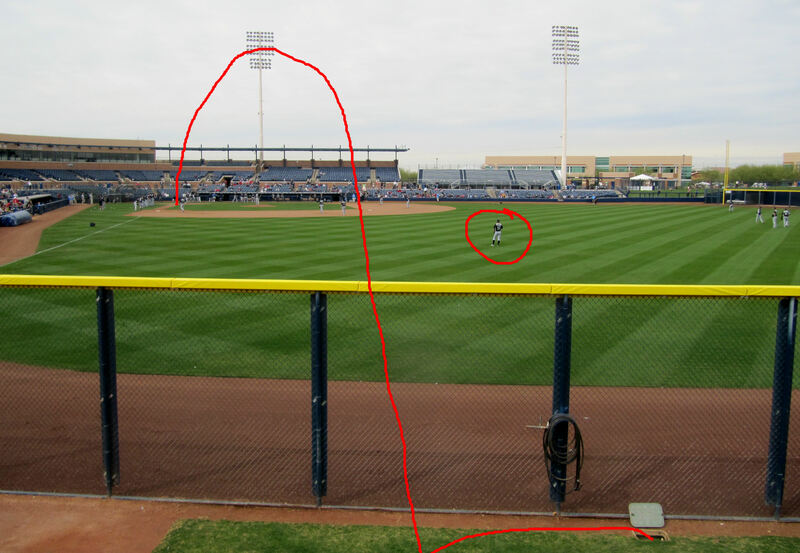 I set up on the walk way (where the long yellow arrow beings) for righties and I shifted behind home plates for righties. 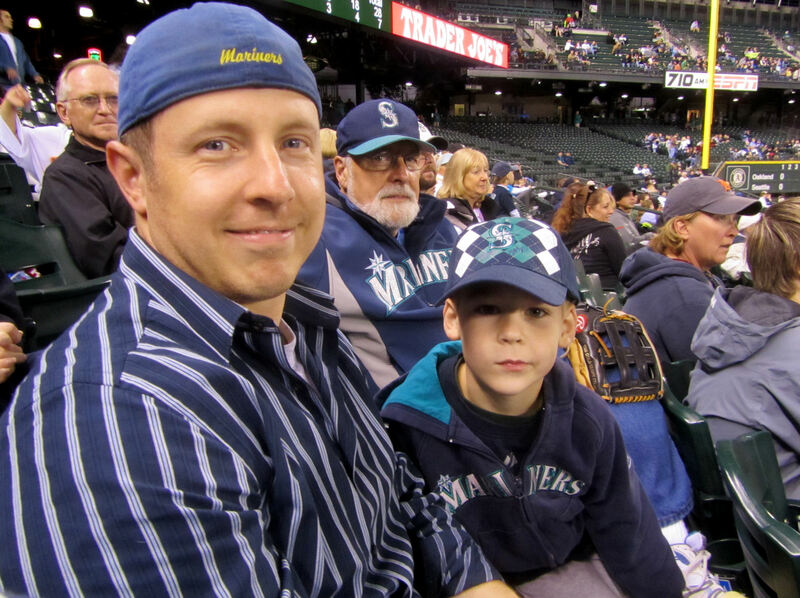 My dad ended up getting a foul ball from Chone Figgins in the bottom of the first inning. 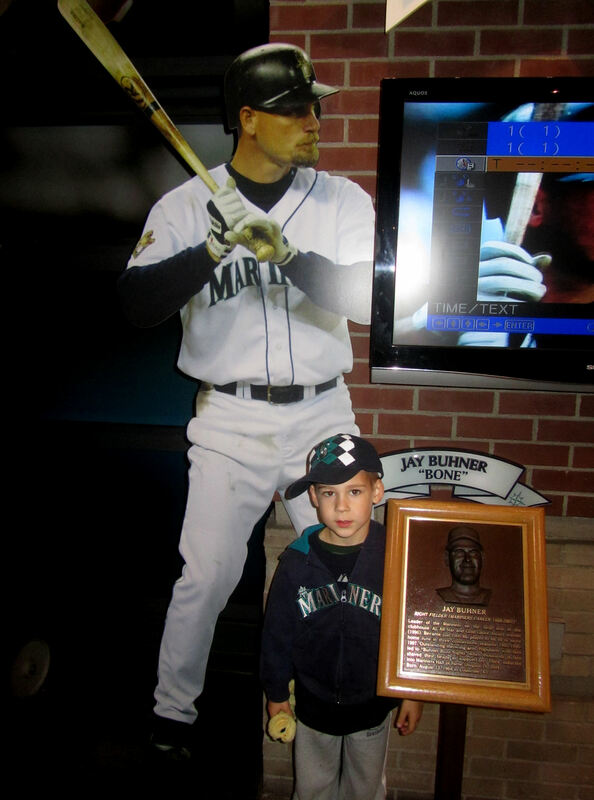 He had moved all the way back to the beginning of the short yellow arrow to chat with the “usher” who works by the entrance to the Mariners clubhouse building. 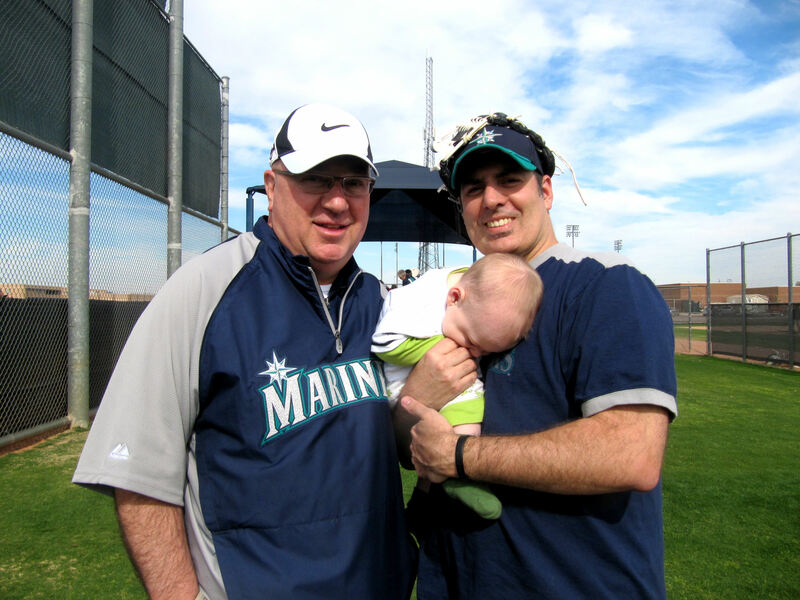 Figgins blooped a little looping foul right over me. It was either mine or my dad’s for the snagging. But I had to chase after it, while it was naturally traveling right to my dad. 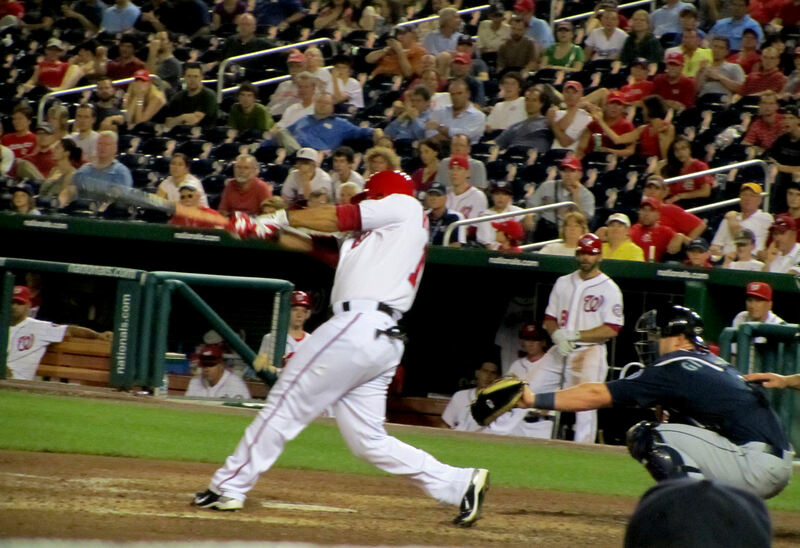 He scooped it up while I was still about 20 feet behind the ball. 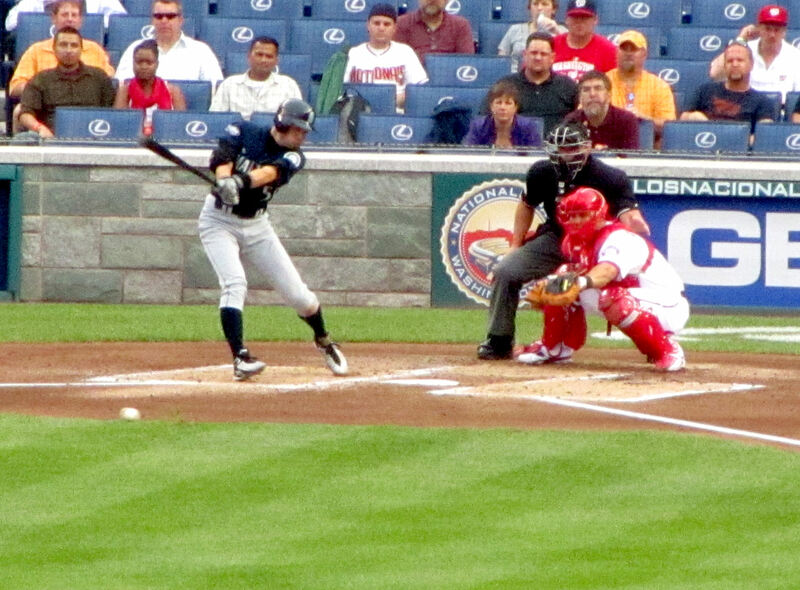 A couple innings later, I was on the walkway when Dustin Ackley (lefty) came to the plate. When he popped a foul straight back, I figured there was no chance I would get it. 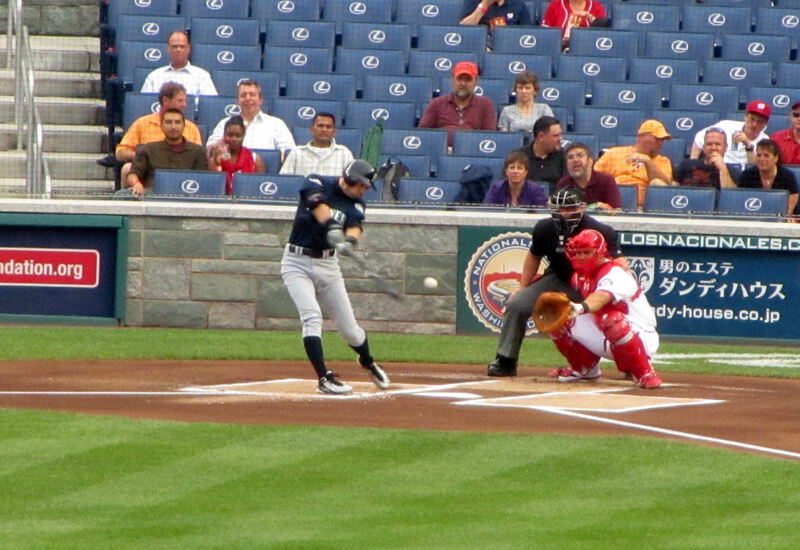 But for some reason, the 5-10 guys over in that direction stood motionless while I ran from the walkway all the way to the back corner (next to M7) and scooped up the foul ball. 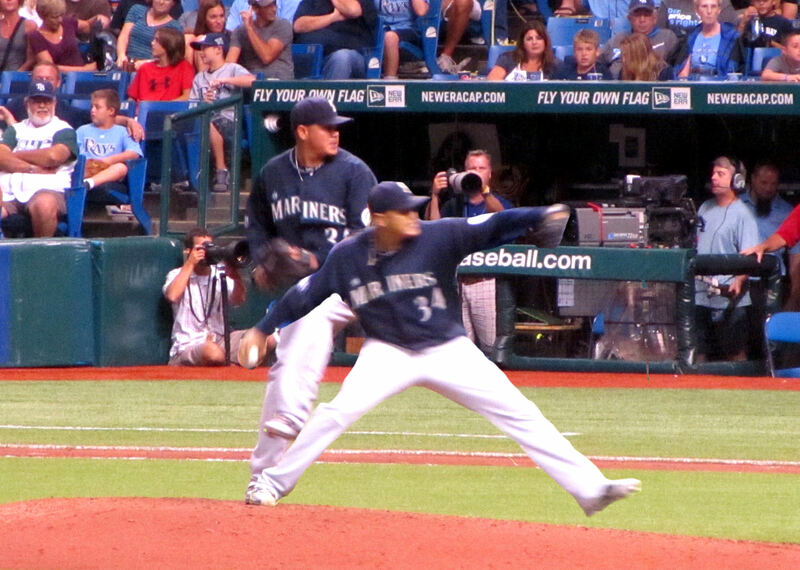 Pineda was out of the game and I’m not sure who pitched it. 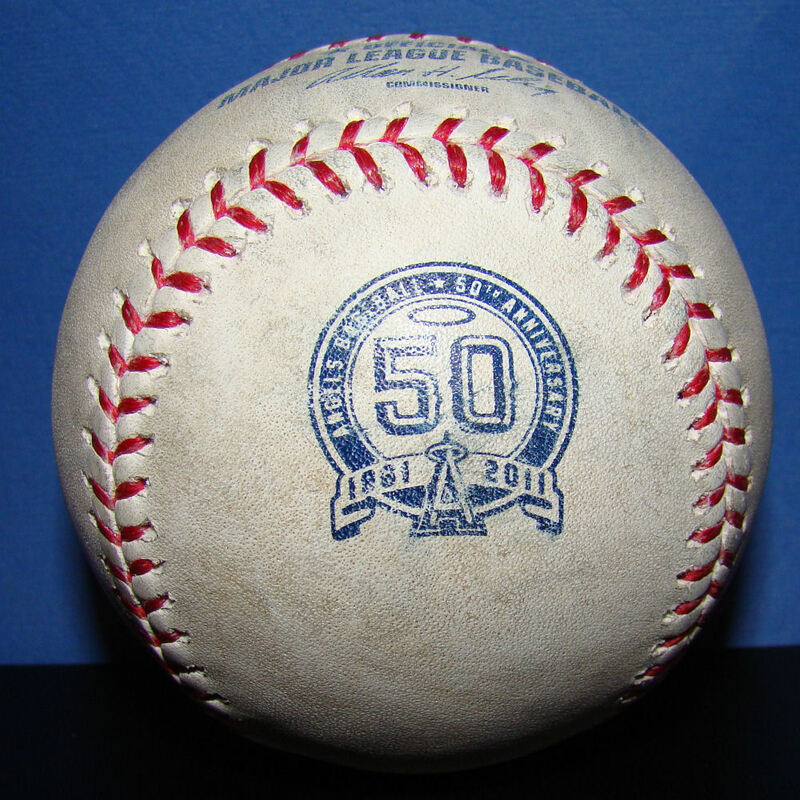 It’ll be cool to have this baseball in years to come when Ackley (hopefully) develops into a star player for the Mariners. 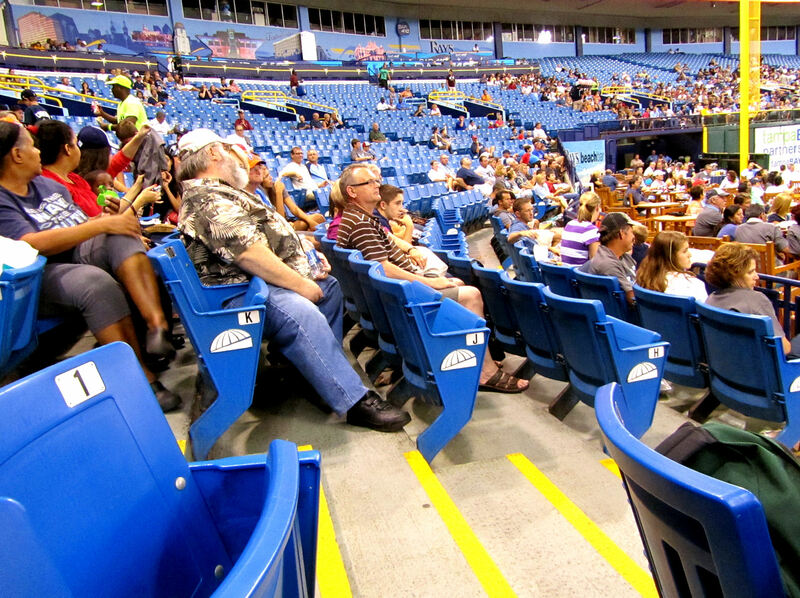 After getting that foul, I stopped playing for fouls and met up with the rest of my family at the 3B stands. 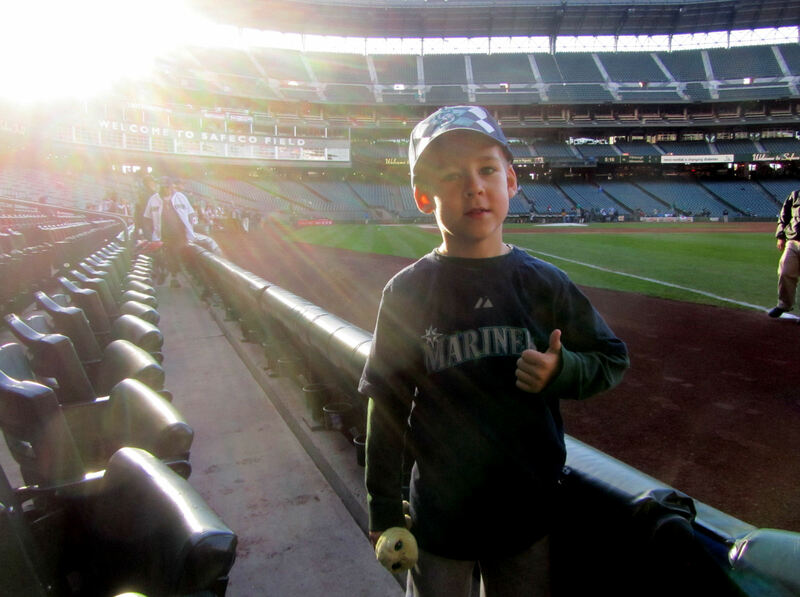 I ended up holding Kellan for the rest of the game, and when Mariners “bat boy” Jason Phillips saw us, he tossed a baseball over the fence to us. That guy is great to us! 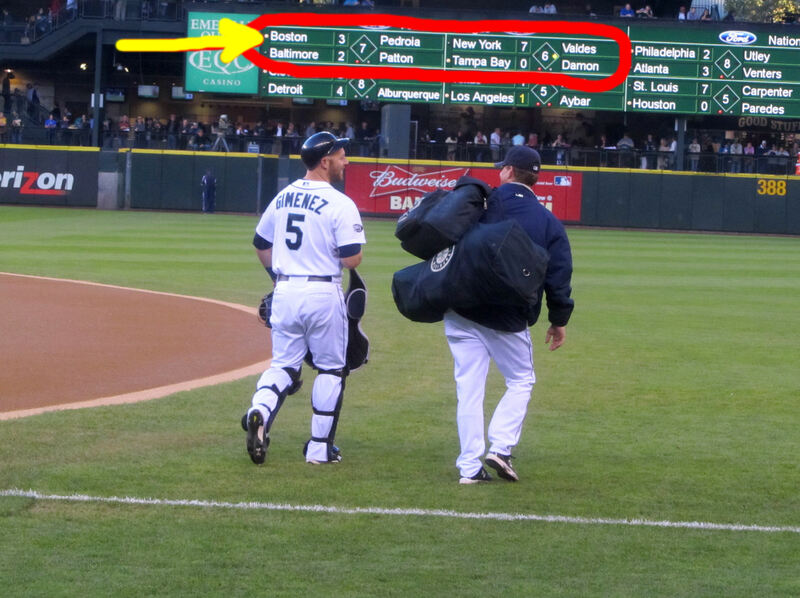 As shown in that last picture, the Mariners had a two-man umpiring crew working the game. 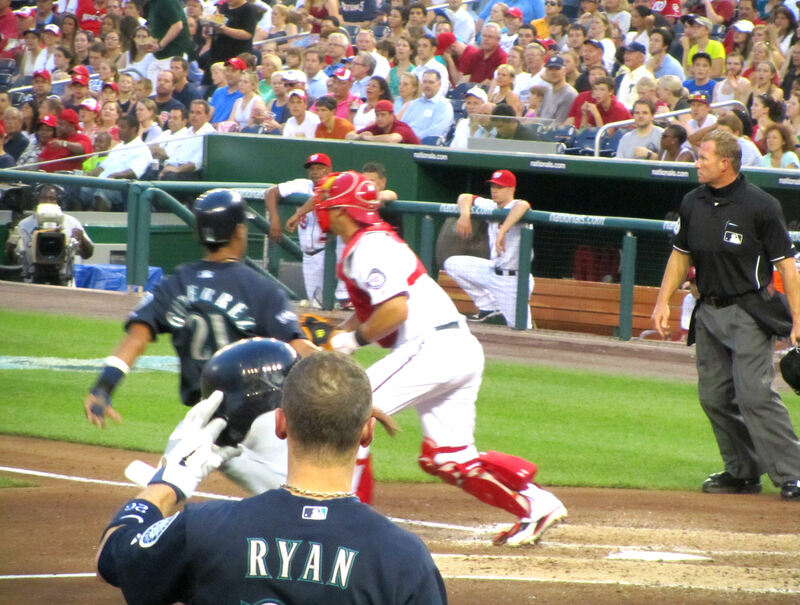 I’m not sure who they were, but they seemed like regular MLB umps. 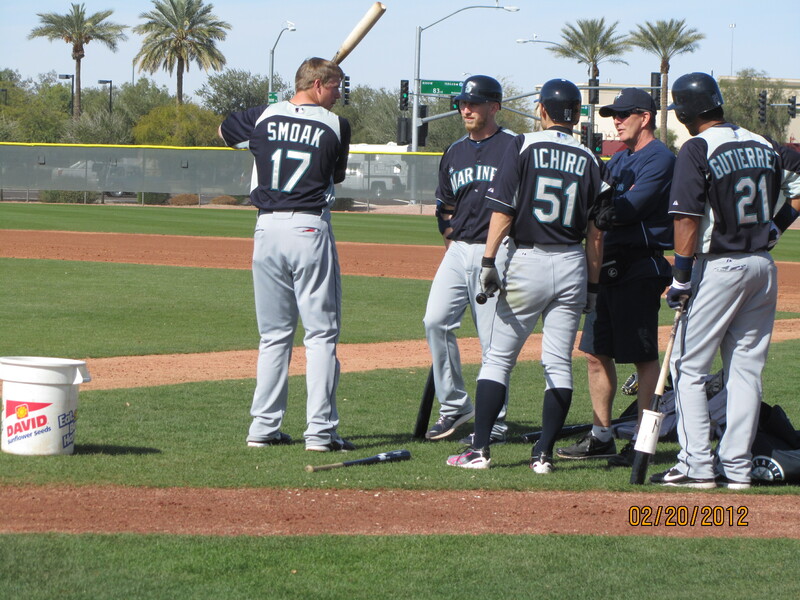 However, they could be the guys who work the various rookie/fall/etc. 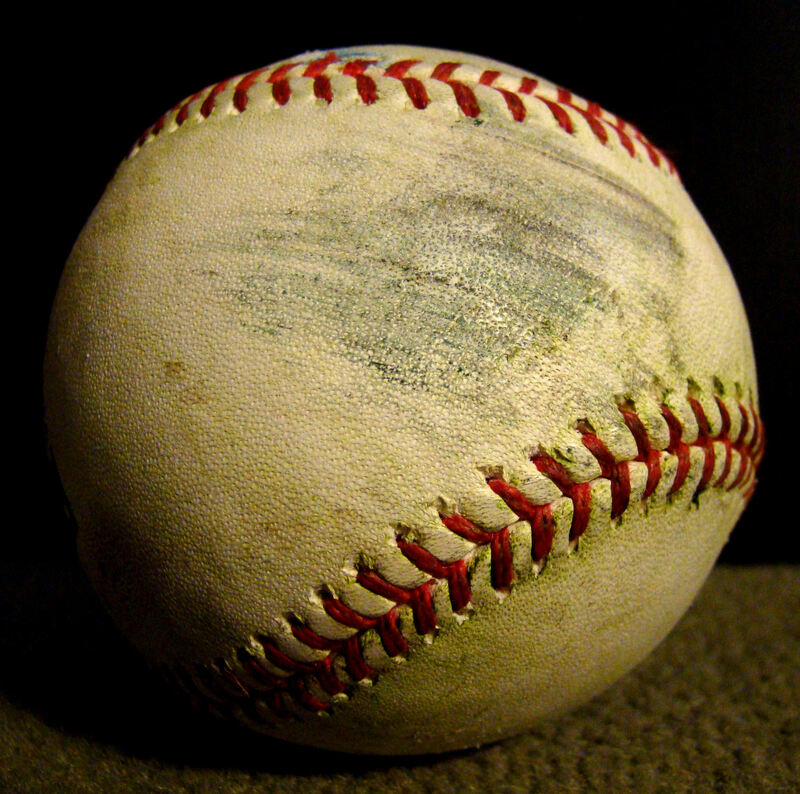 leagues that are played in Arizona throughout the year. 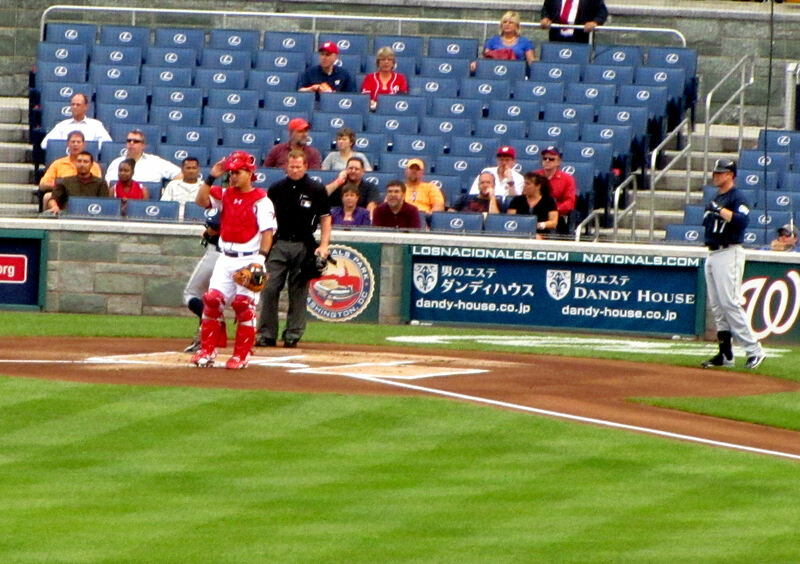 Anyway, despite the high school sized crowd, the umps made the game feel much more official. 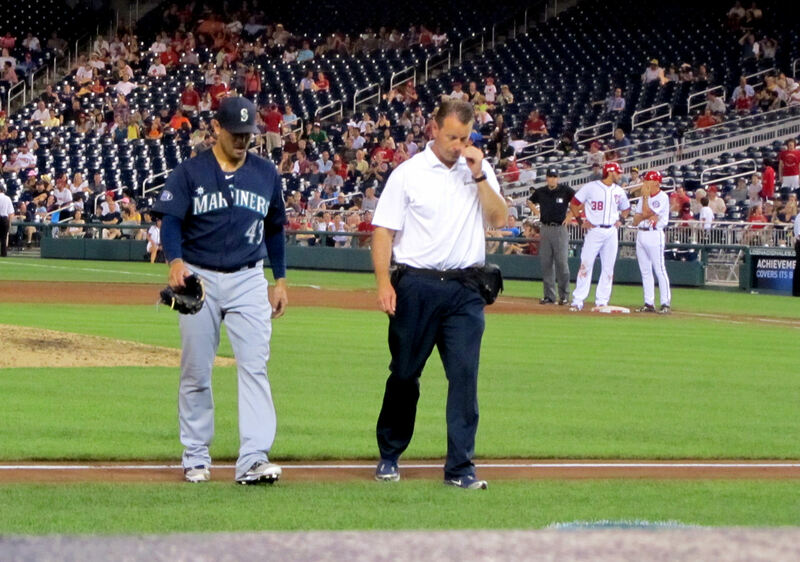 During the game, when Michael Saunders got picked off second (he just broke for third even before first movement), the third unidentified Mariners exec. busted out in laughter and exclaimed, “Ha! Does he think he’s wearing an invisible suit!? He think he’s wearing an invisible suit!” It can’t be good to have the bosses mocking your boneheaded move like that! A momemt after parting ways with Jack Z., Jack called back to us to introduce us to his wife, Debbie. It was funny because she wasn’t standing there when I was chatting with Jack, and its not like Jack and I are hang out all the time, but for whatever reason he thought he should come back to introduce me to Debbie. 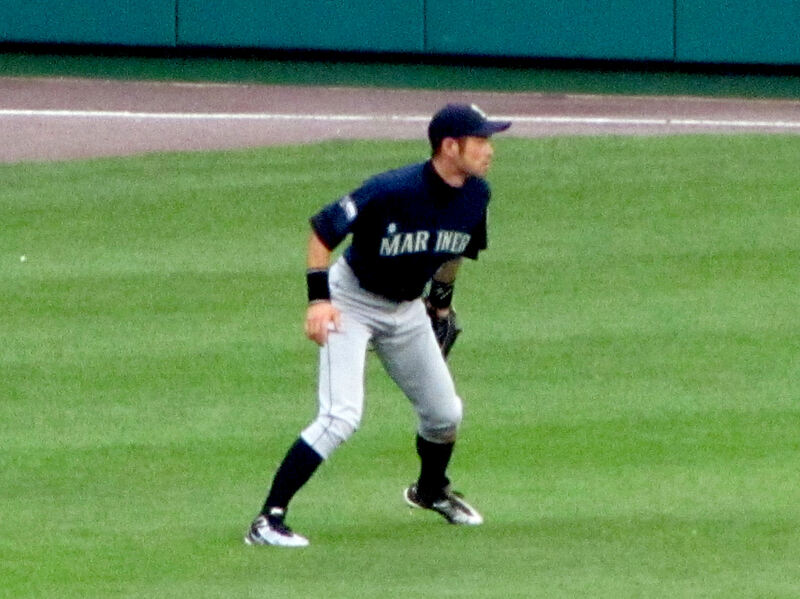 One last game note, although I didn’t get any pictures because I was playing for fouls, Ichiro lead off for Pineda’s team and was 2-2 on the day with two singles. 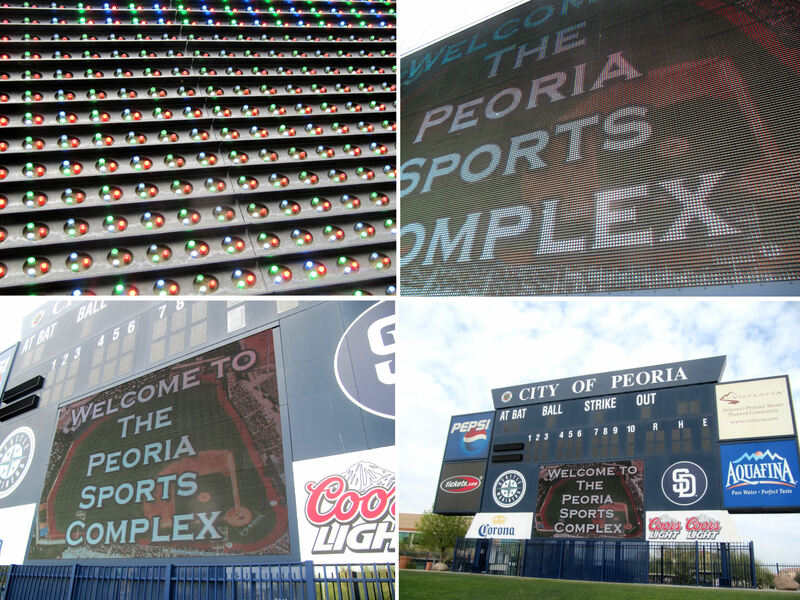 On our last full day in Arizona, we attended Mariners/Padres Fan Fest at the Peoria Sports Complex main stadium. 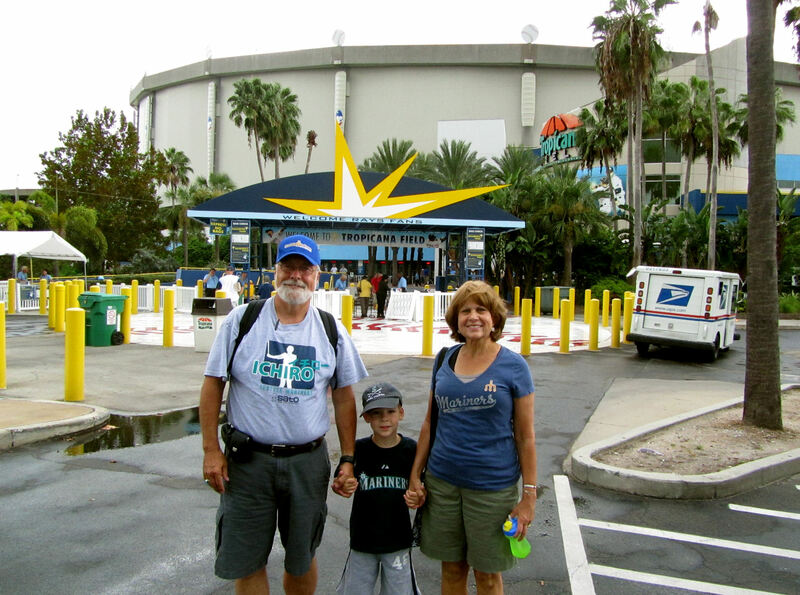 My folks, Tim and I headed over first and Colleen and Kellan joined us after Kellan’s morning nap. 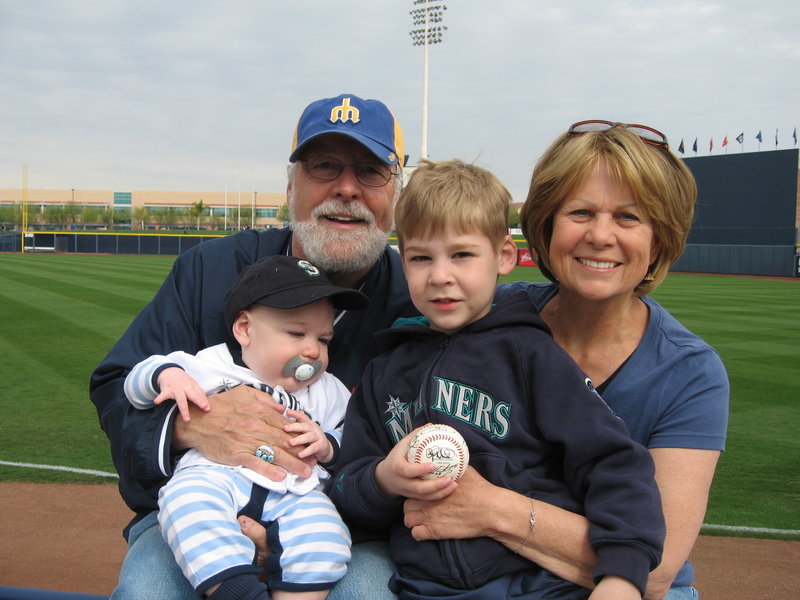 When we entered the stadium, Tim was handed a little string backpack with baseball cards, a promotional baseball, and a sharpie from a local baseball card store. 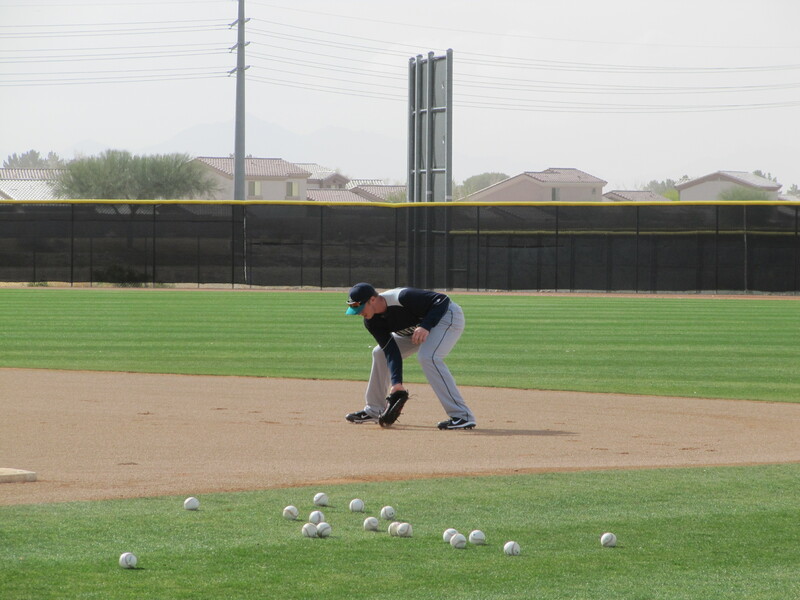 The Padres were on the field. 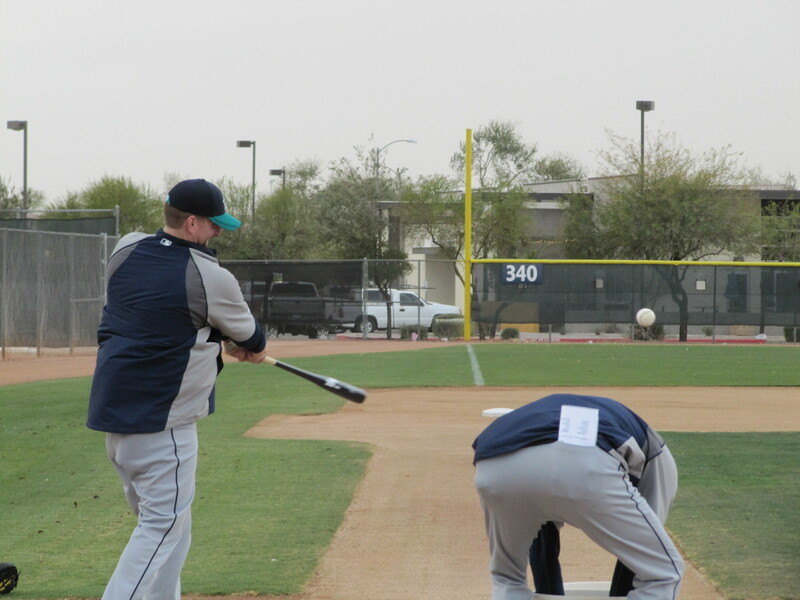 Right off the bat, I split off from my folks and Tim so I could run over to the Mariners practice fields and see if the guys were practicing before Fan Fest. They weren’t. 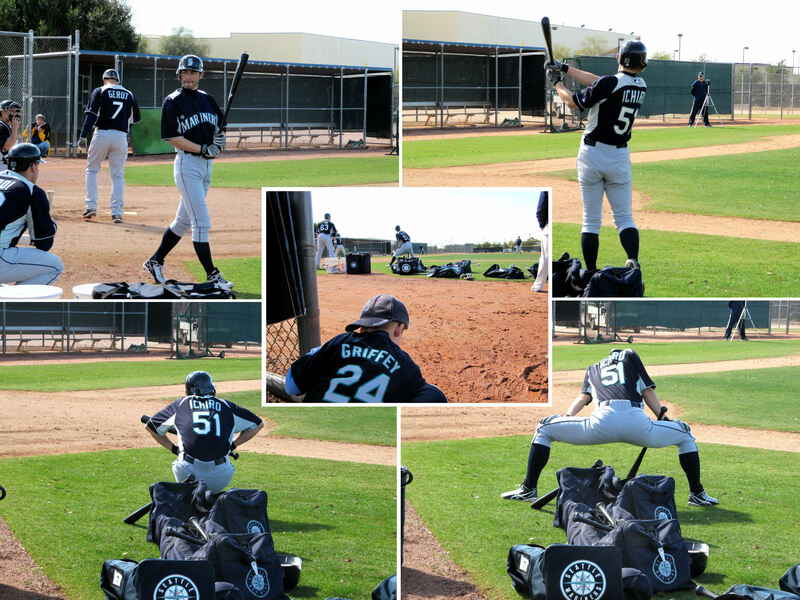 It was the first day of minor league camp and the only guys on the practice fields were minor leaguers. 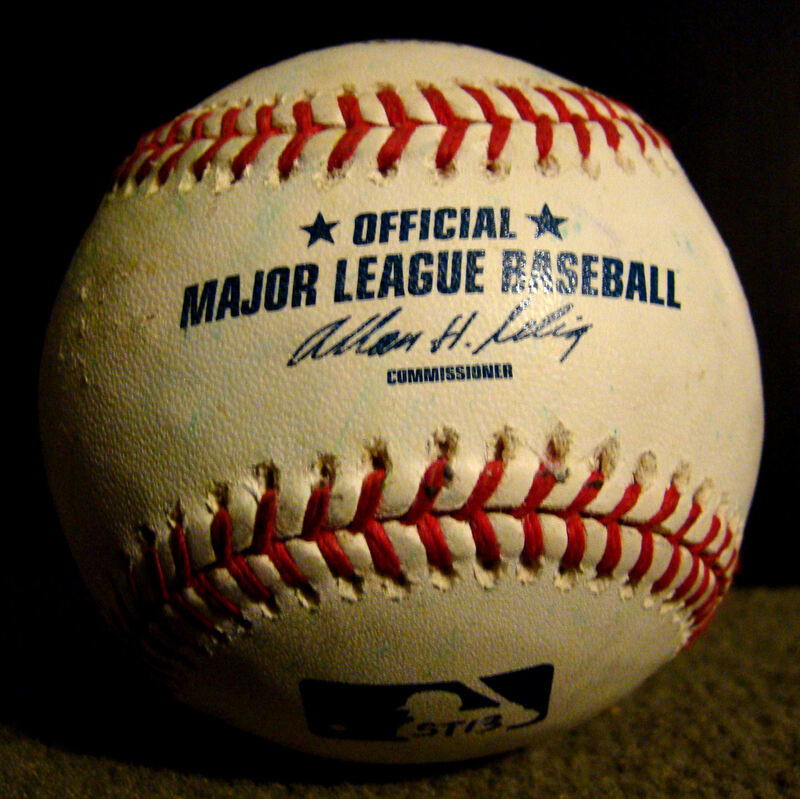 …tossed me a completely unsolicited baseball over the RF bullpen. 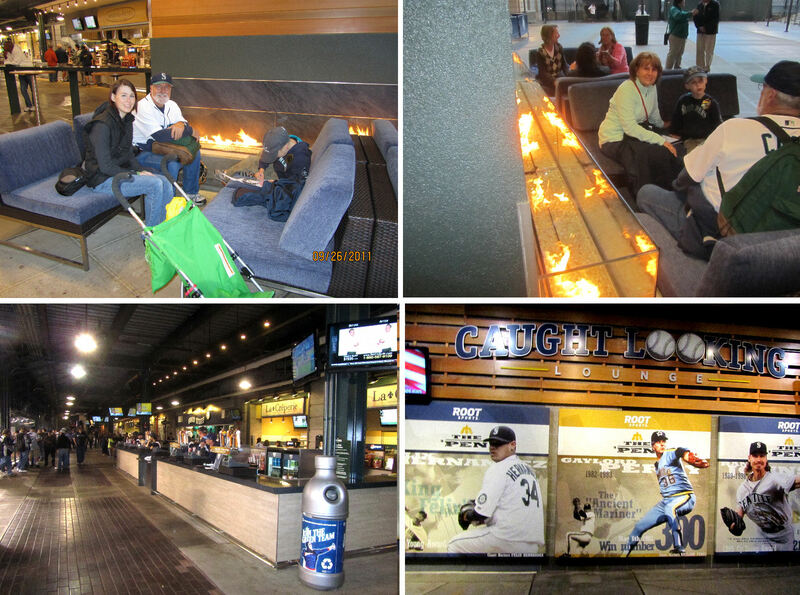 Finally, I decided that they must be in the concourse behind the infield grandstand. Once I headed over there, I found them fairly quickly. 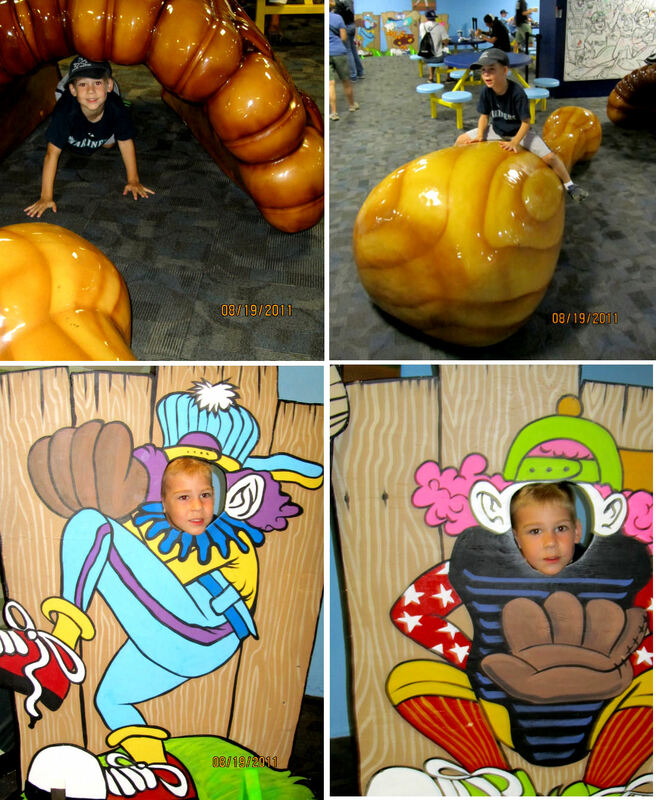 They had been checking out all of the kids stuff set up in the concourse. I think they’re both hilarious. 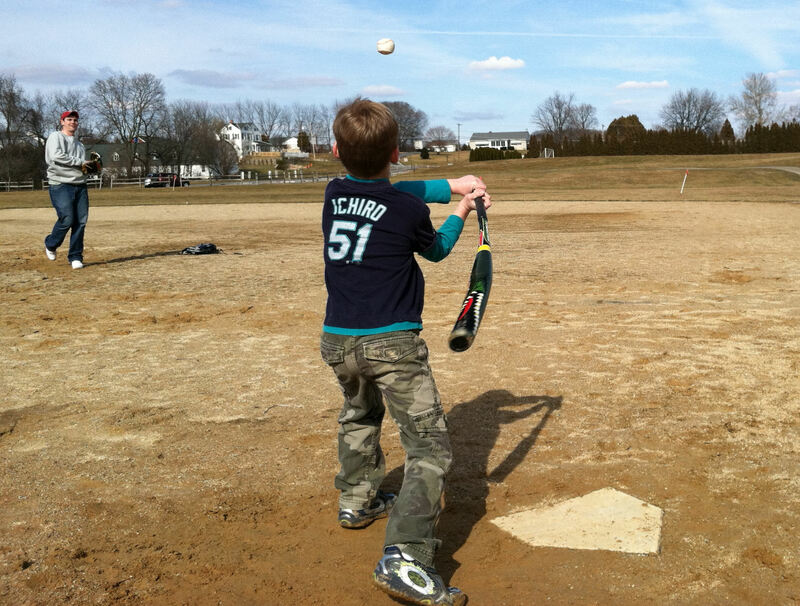 …and his pitching skills at a pitching station. 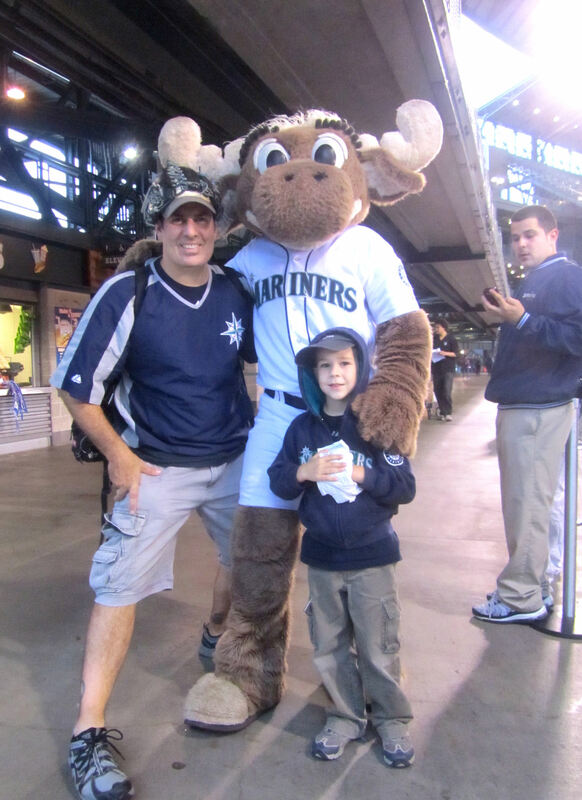 …I chatted briefly with a guy who I thought might be Jack Wilson’s dad (he had a “family pass” and his last name was Wilson), but it turned out he is Josh Wilsons dad. The funny thing is that he REALLY looked a lot like Jack Wilson. 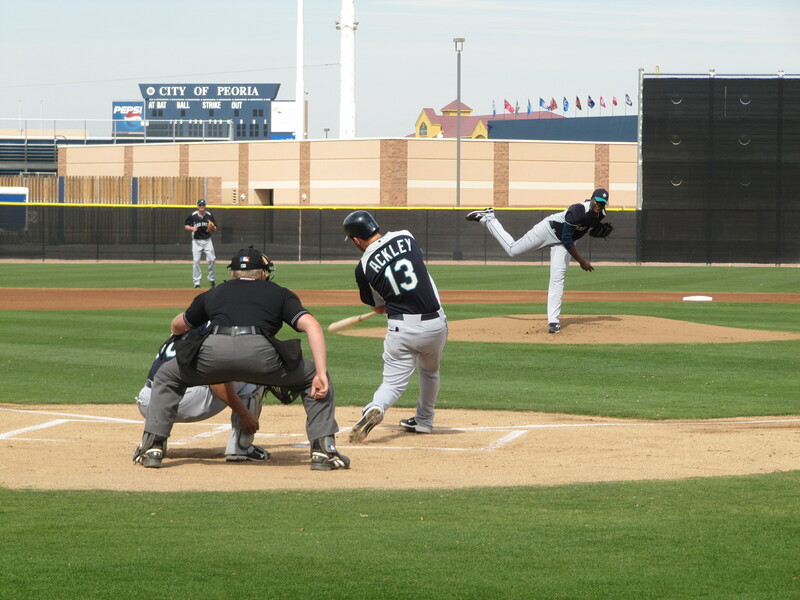 I had heard that the Mariners would be on the field around 11 a.m., and the time was fast approaching. Colleen and Kellan had arrived by this time. 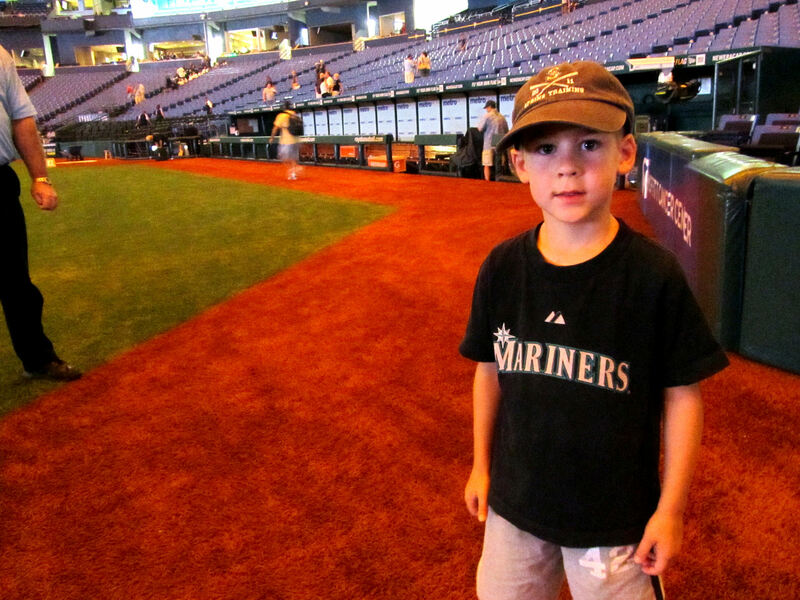 I grabbed Kellan and headed over to the 1B foul line where players enter the stadium from the clubhouse. 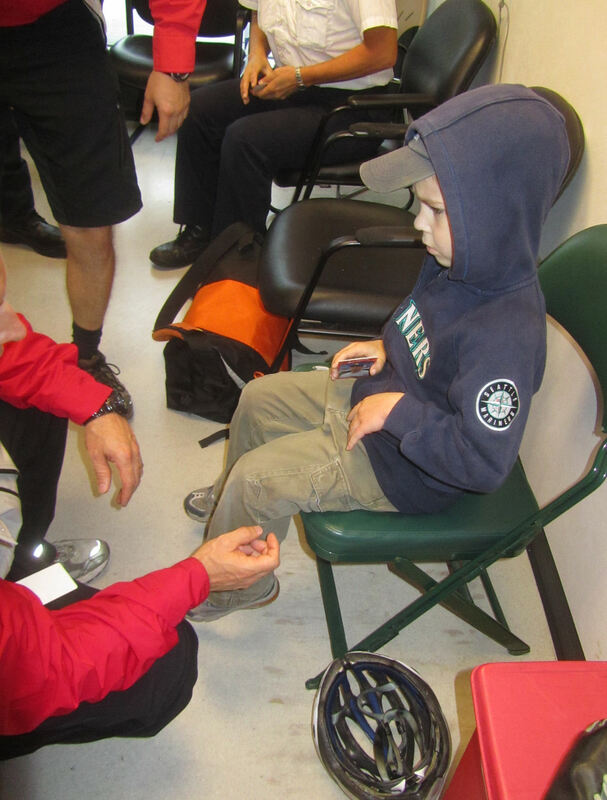 Last season, the “professional” autograph seekers boxed out all the kids during Fan Fest. 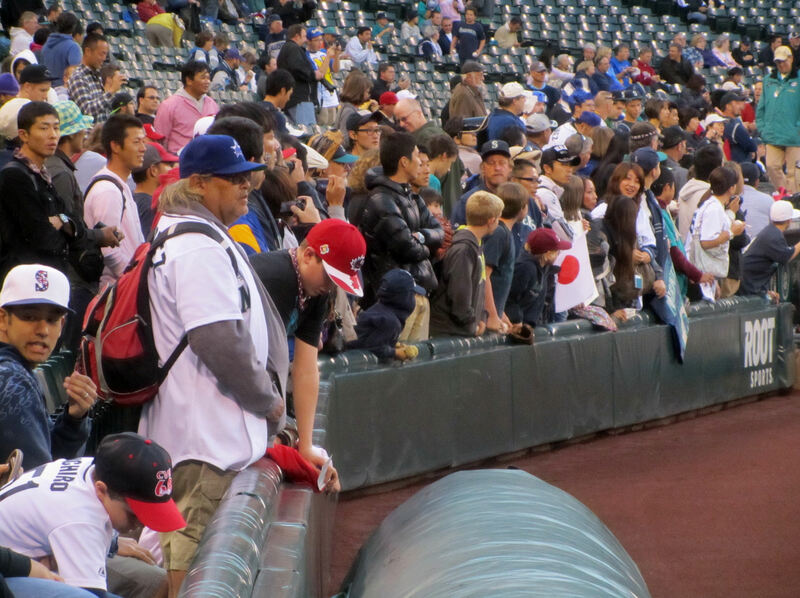 So this year, they had a rule that only kids and their adult companions could get into the first couple sections down the 1B line — the best autograph area once the players enter the stadium. 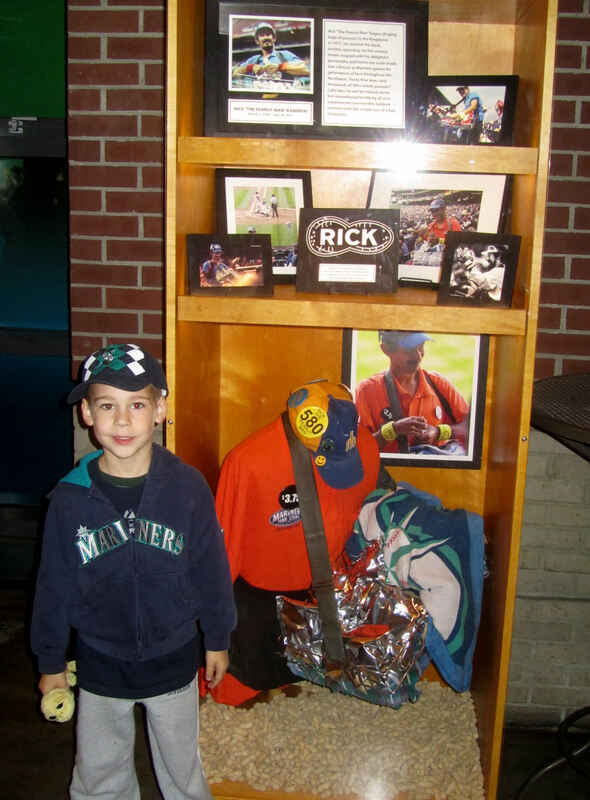 As previously featured in its own entry, the first Mariner we connected with at Fan Fest was Kellan’s first pitcher, Luke French. 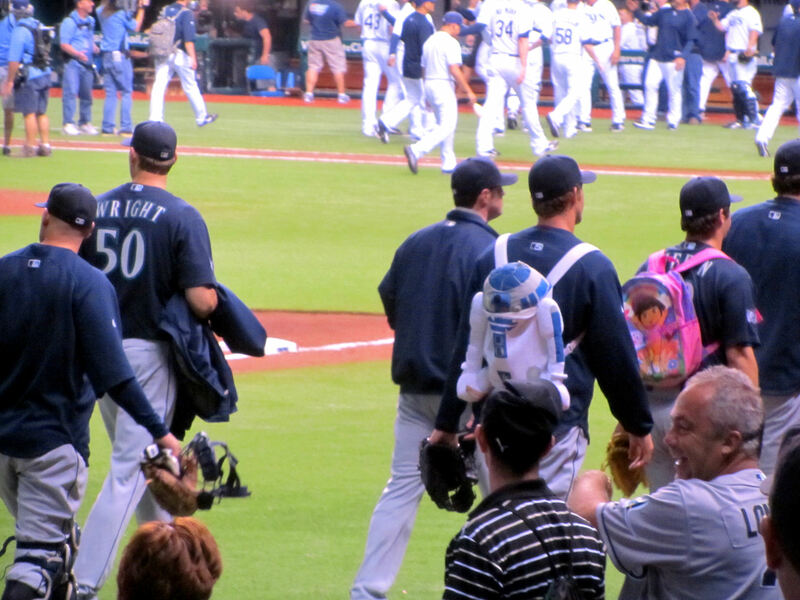 …who literally took 1-2 minutes to chat with each kid as he signed autographs. He was very cool. Way to go, Jamie! 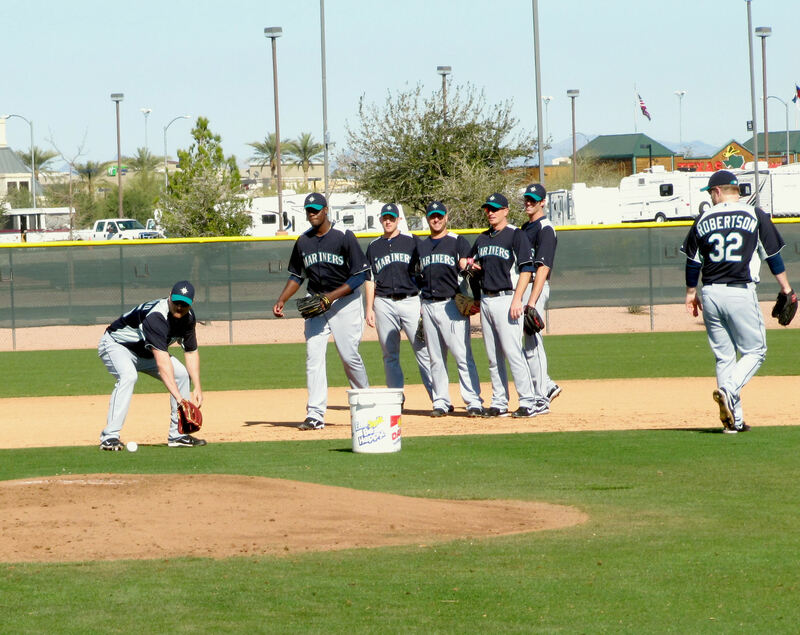 Top Left (top to bottom): The Mariner Moose, Jamie Wright (#50), and Matt Tuiasosopo (#27). 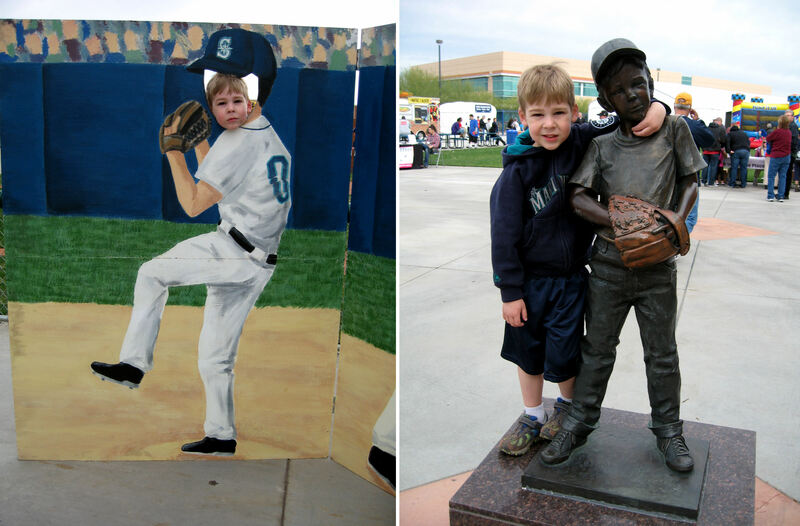 Top Right (top to bottom): Chone Figgins (#9), unsure, unsure. 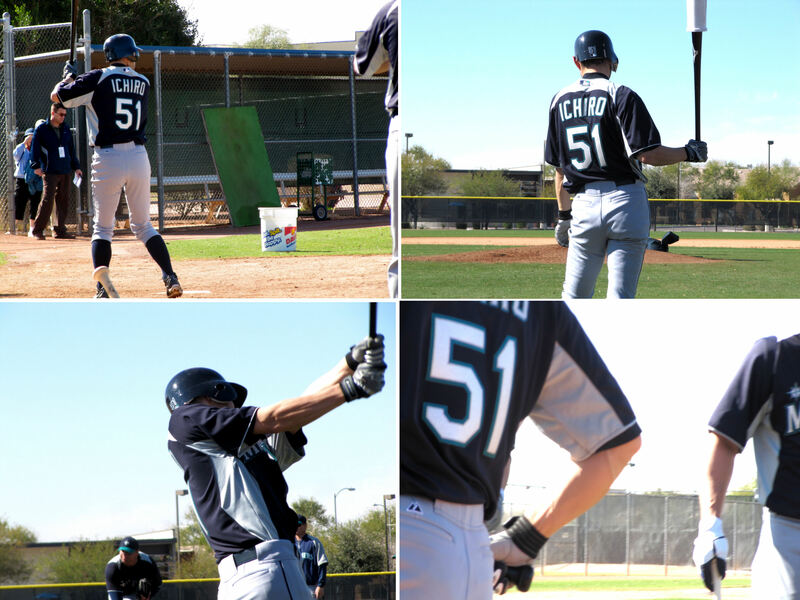 Bottom Left (top to bottom): unsure, David Aardsma (#53), unsure. 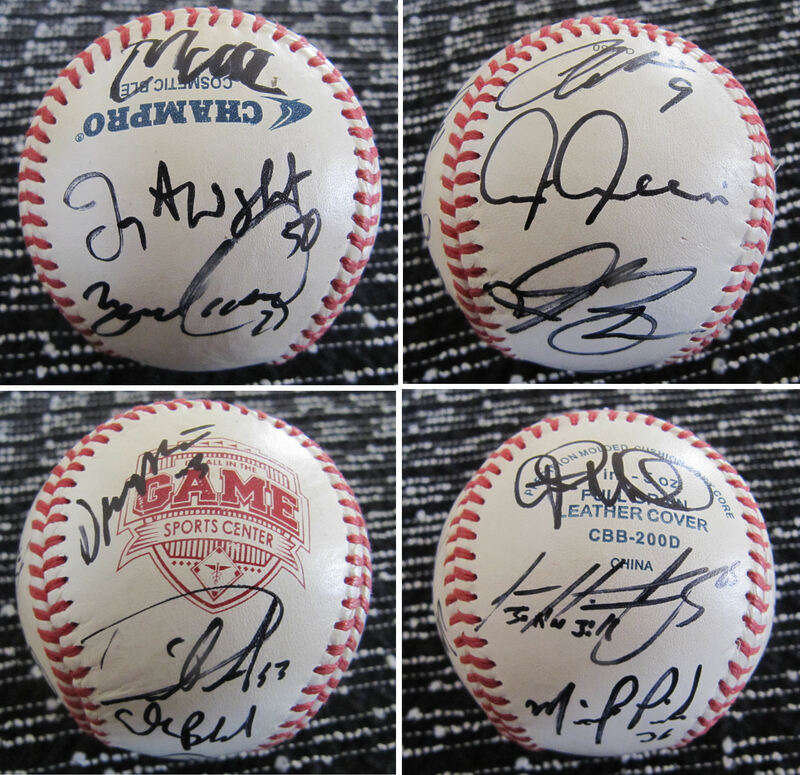 Bottom right (top to bottom): Justin Smoak, Luke French (#25), Michael Pineda (#36). 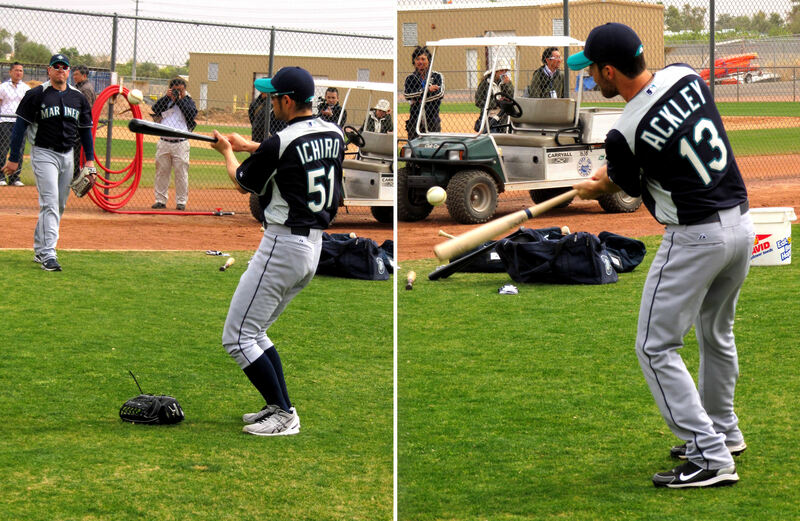 Next, it was time for the Mariners to take some BP. 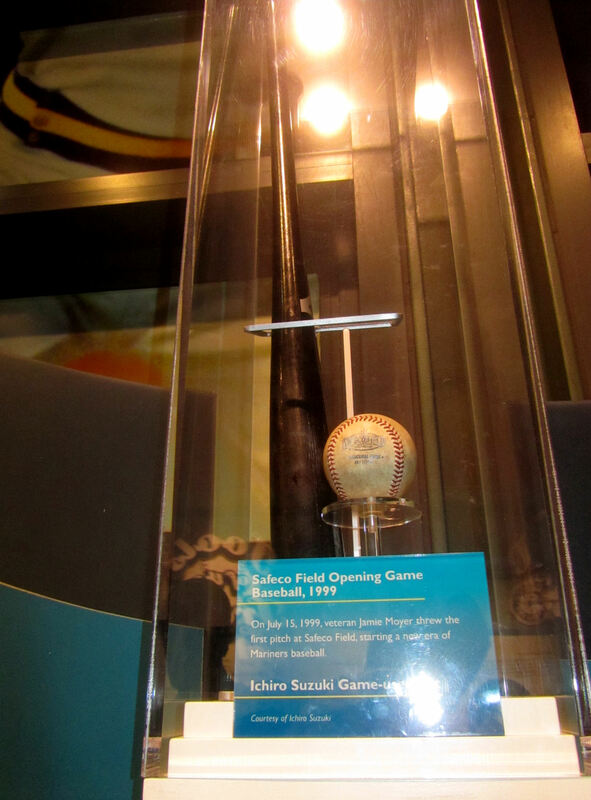 My goal for the day was simple: Catch a homerun hit by Ichiro. 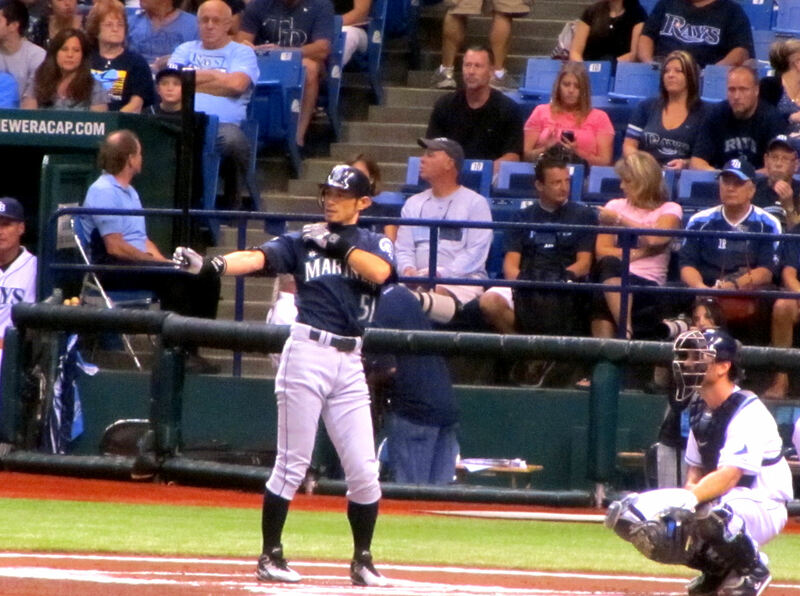 Ichiro hit several homeruns to RF (where we were). But all but one landed in the bullpen. 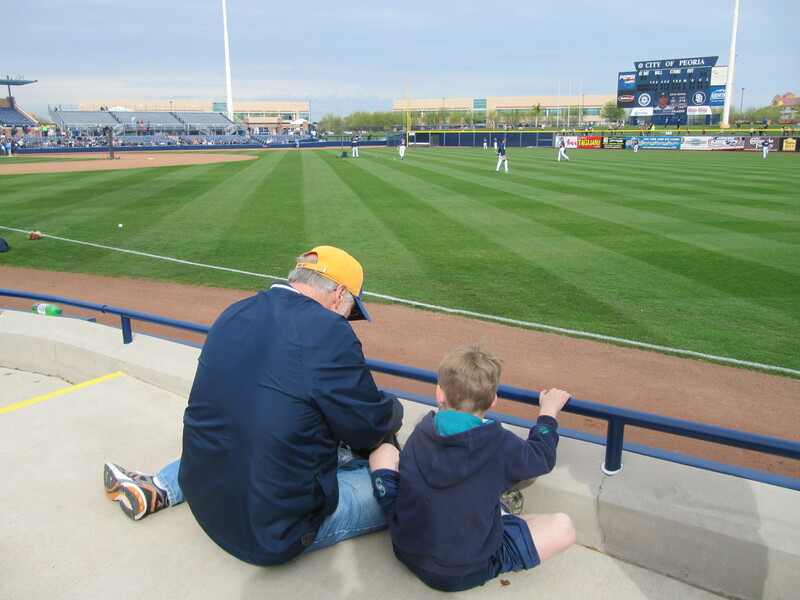 My dad should have caught the one that landed on the grass berm, but he was mugged by some out-of-control fan who made everyone miss the ball on the fly (my dad made no effort to dive on the pile for the baseball in the grass). 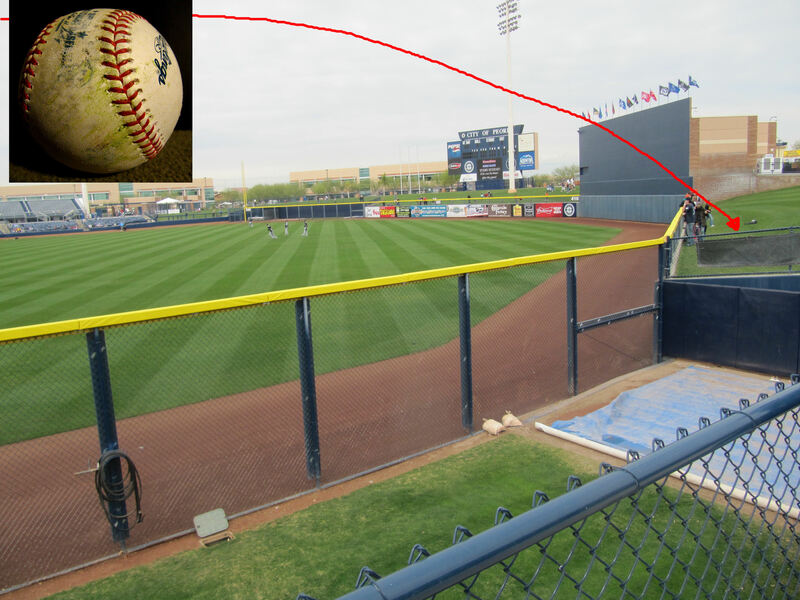 As illustrated in the picture above, Ichiro’s homerun was coming right at me, but it fell short, hit the back wall of the bullpen (about 5-10 feet below me) and bounced directly into a box on the ground (I think it was the control box for the hose hanging on the fence). Very impress, Ichi! 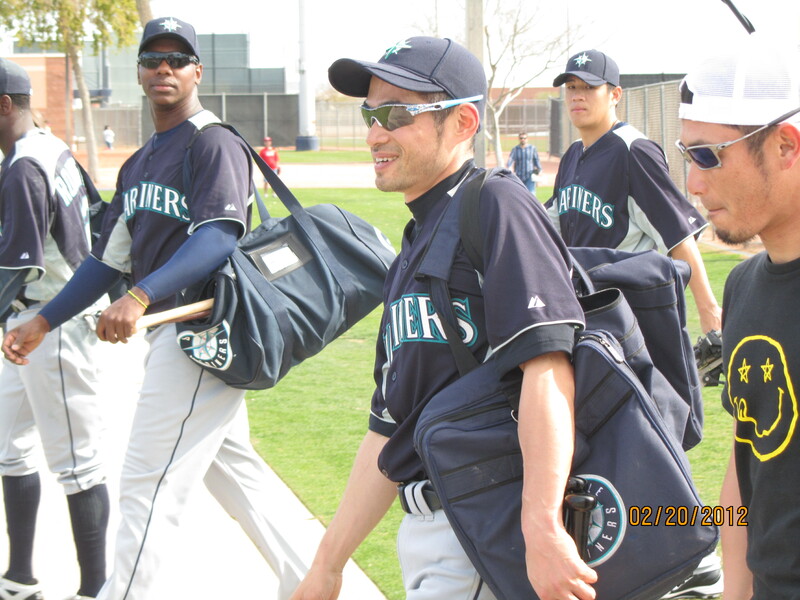 After Ichiro finished hitting, I was certain that he would call it a day and head back to the Mariners clubhouse. 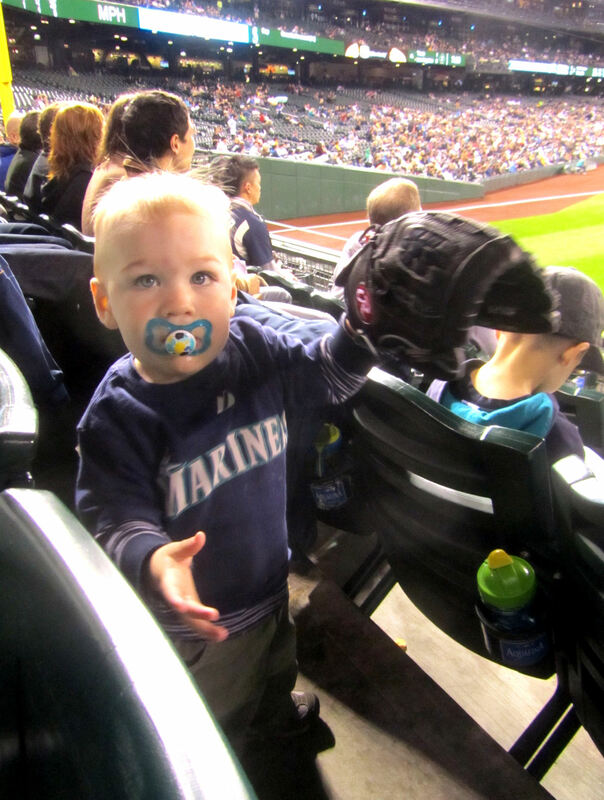 But, to my surprise, he grabbed his glove and headed out to RF. 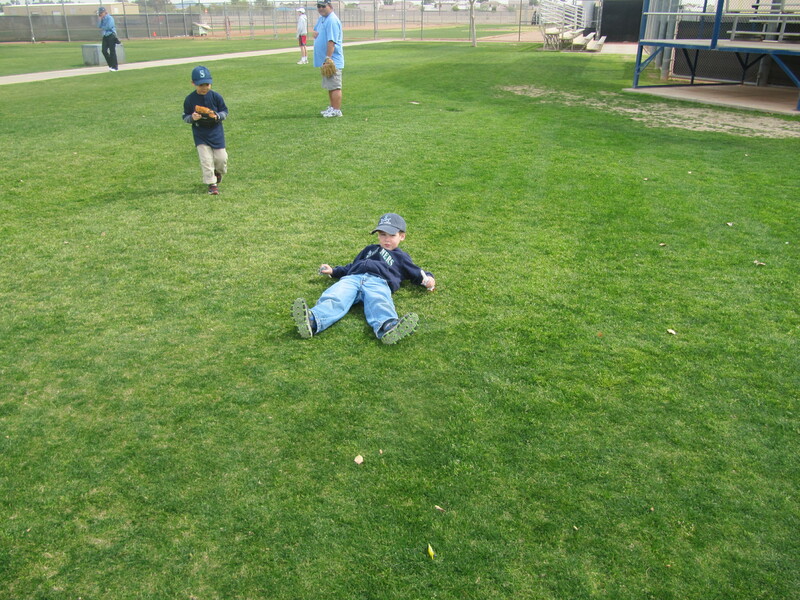 The first Ryan foul bounced high off of the warning track over a teenaged kid (probably 13-14) and right to me and Tim. 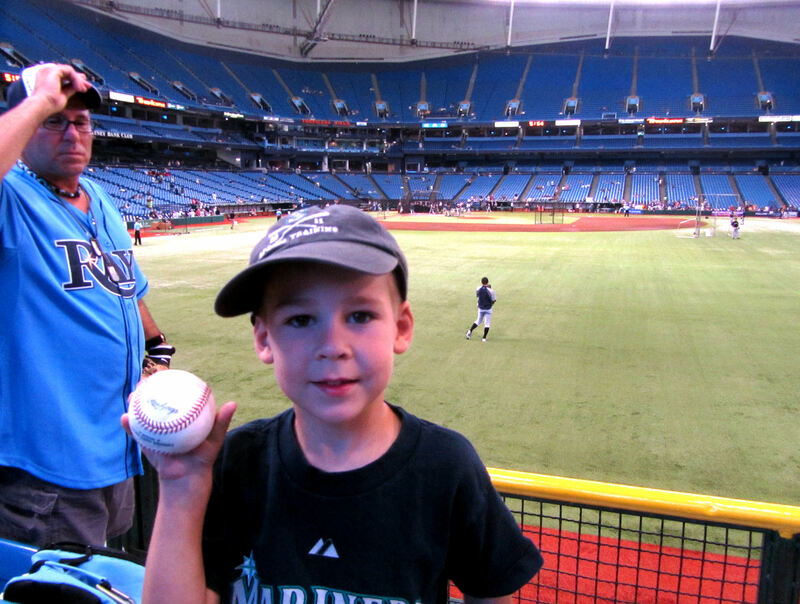 The second Ryan foul ball rattled off of several fans gloves, including that same kid. 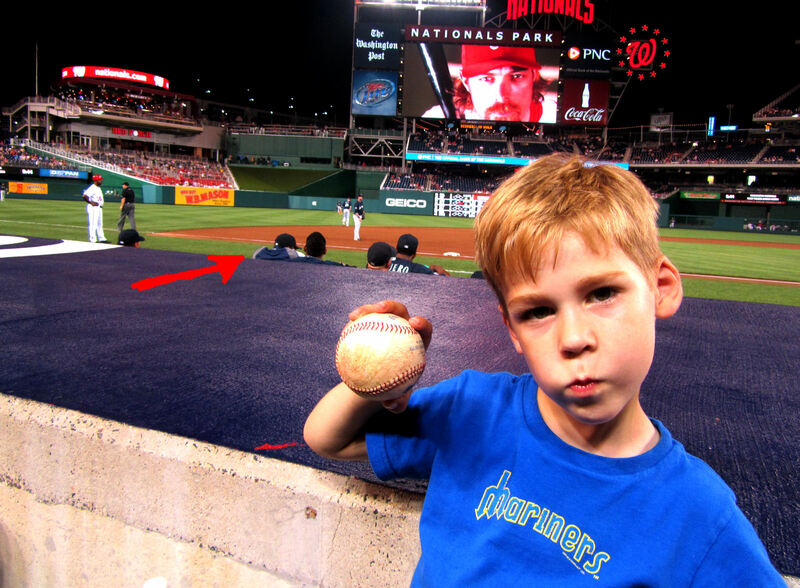 I felt bad for him and tried to give him the baseball. But he declined, explaining that he has about 100 of his own already. 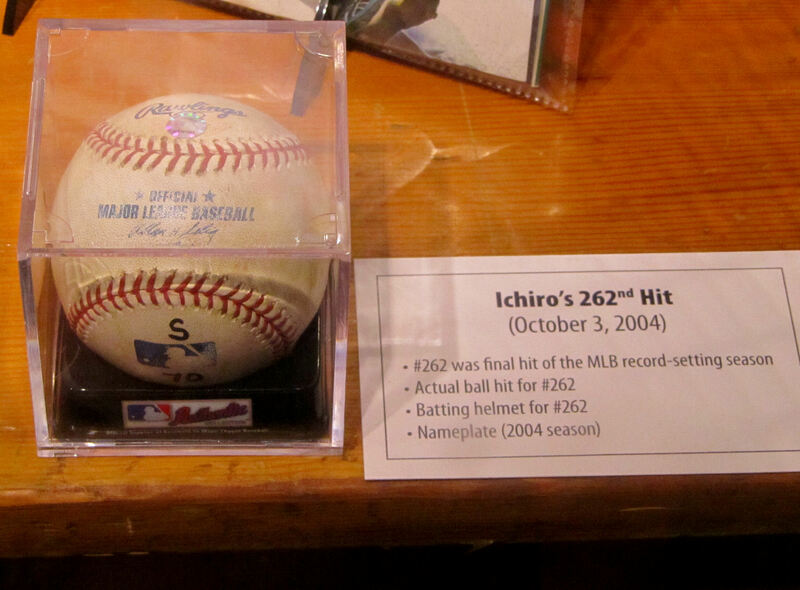 Our first baseball ever from Ichiro. 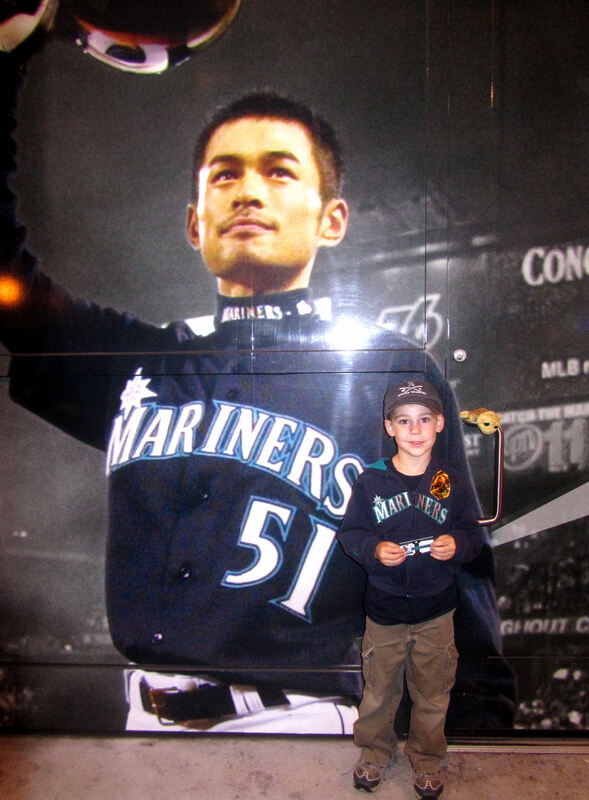 Ichiro is hands down Tim’s favorite player. 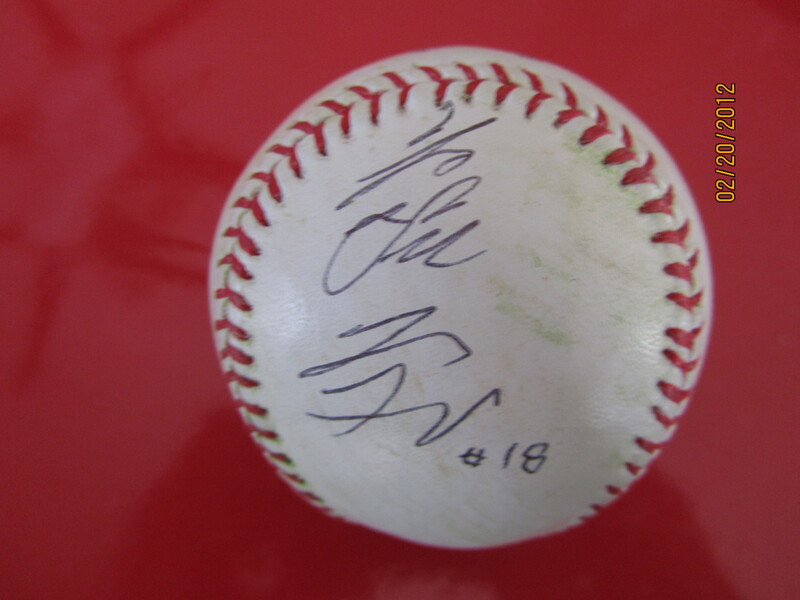 So its awesome to get a baseball from him. 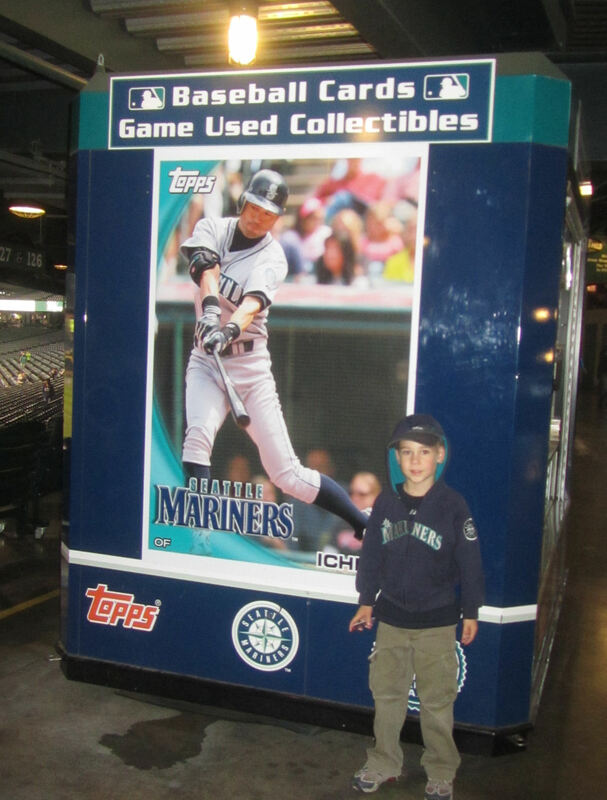 Tim put his Ichiro baseball right next to his bed with an Ichiro baseball card in a display case next to it. 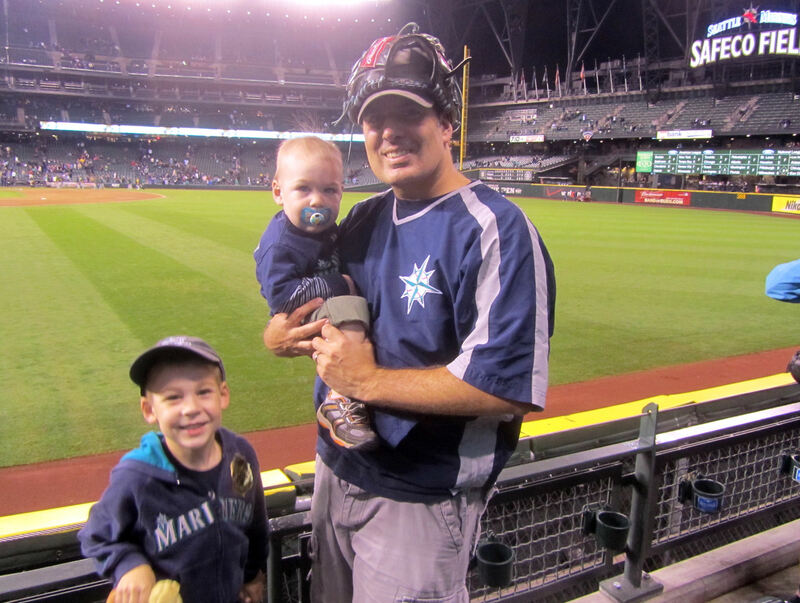 …and our final baseball of the day from Jack Wilson (above to right). 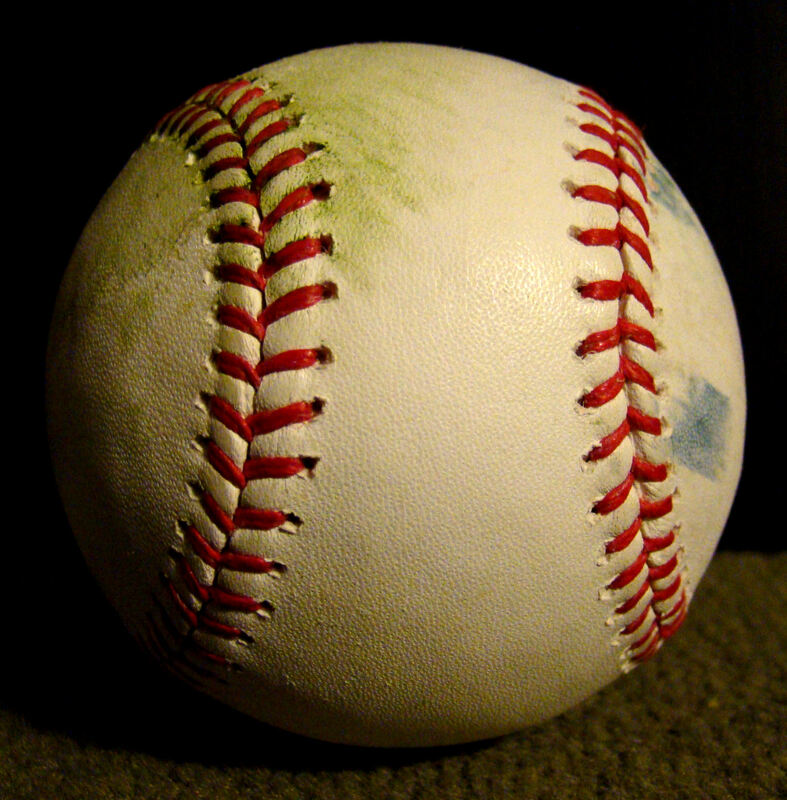 The Wilson baseball was funny. 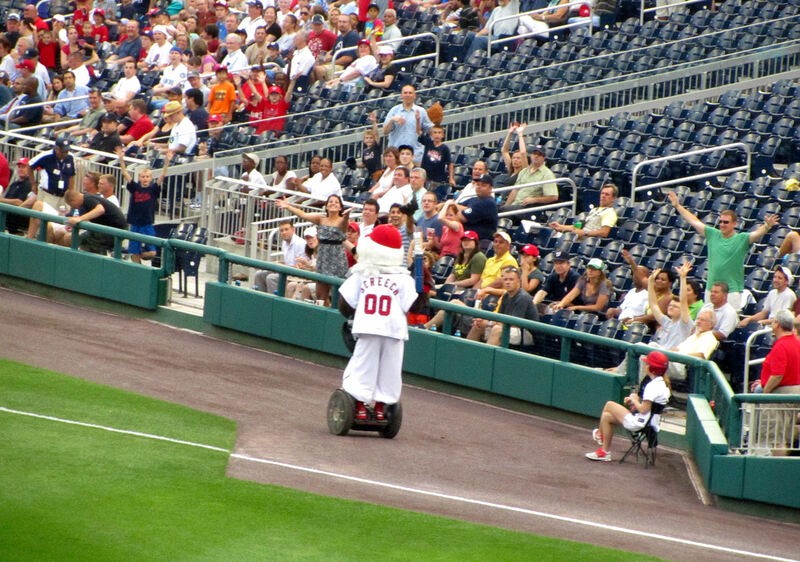 We were back in RF and everyone collectively decided it was time to head out to get some lunch. 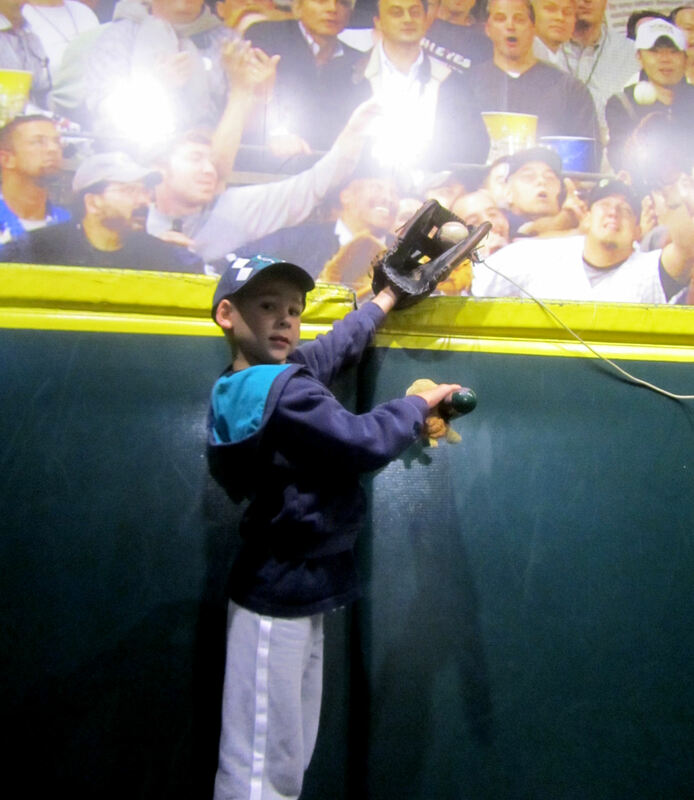 As we were leaving the berm in RF, Jack was retrieving a baseball from the warning track just below the bullpen. 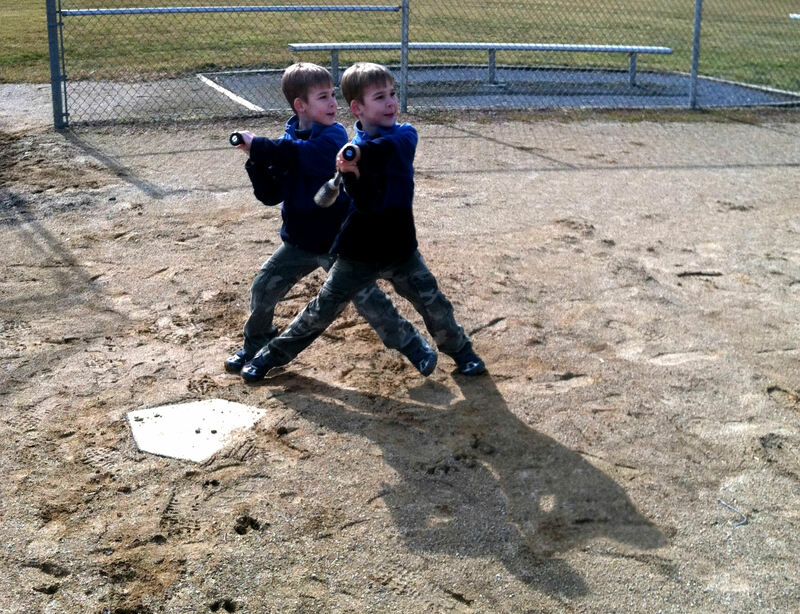 I called down, “Hit me over the shoulder, Jack!” Jack looked up, hiked the ball to himself, rolled out of the pocket to the right, and threw a post pattern to me up on the berm. 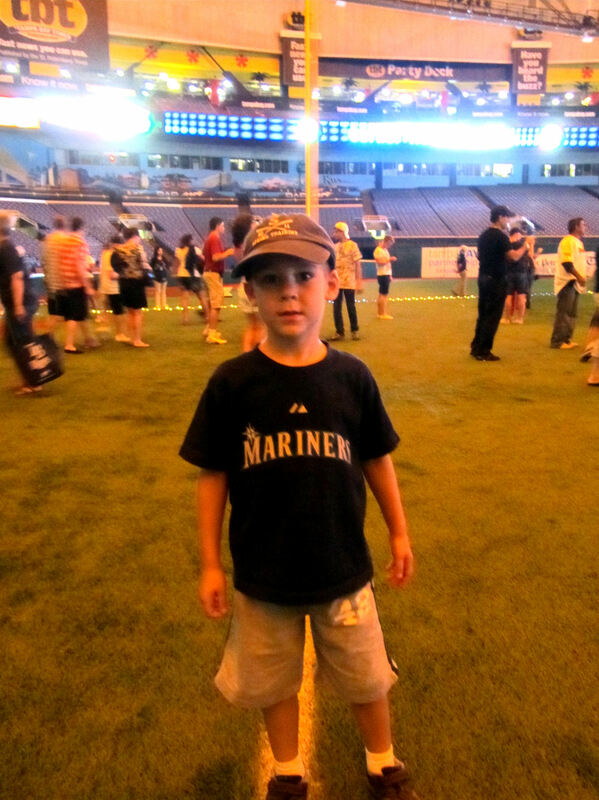 Thirty seconds later, Jack threw a laser to my dad as he crossed the bridge over the players entrance to the field. Thanks again, Jack! (on behalf of my dad). 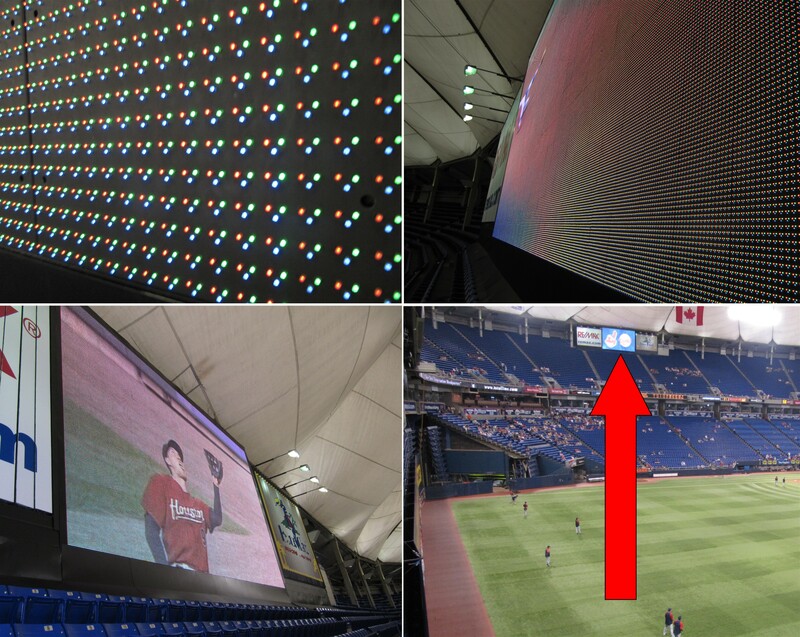 …that are similar to the pictures I took a couple years ago at the Metrodome. And that was it. 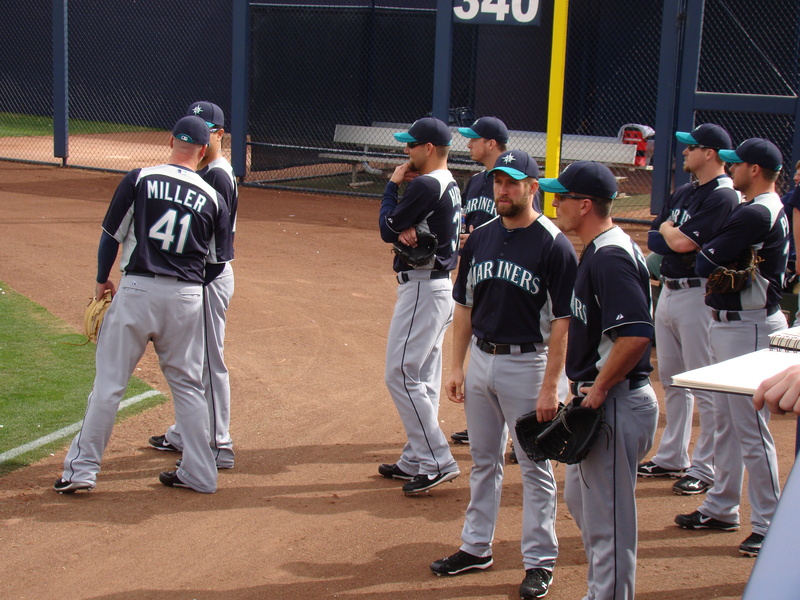 The next morning, I drove by the complex and saw some Mariners milling around by the clubhouse building. 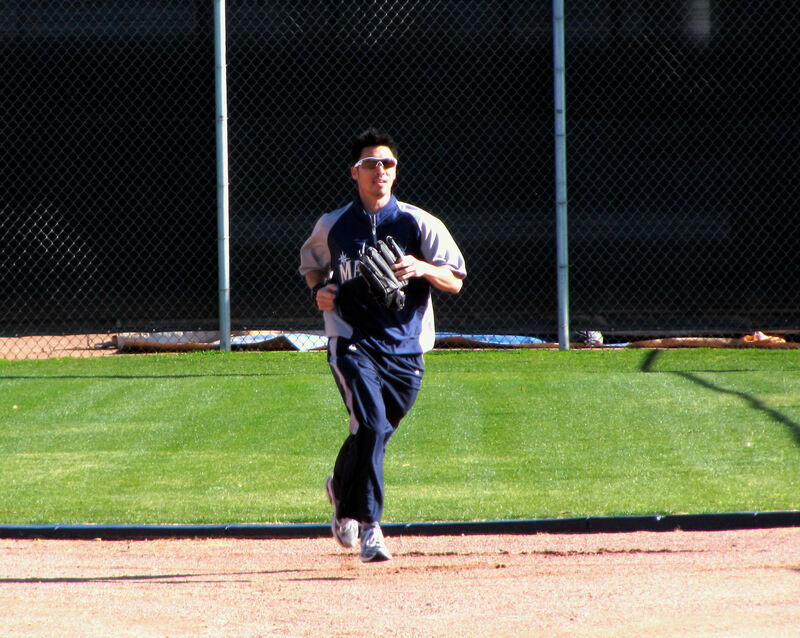 But there was no major league work out due to the first Spring Training game later that day. Later that day, we caught out plane back to Pennsylvania. 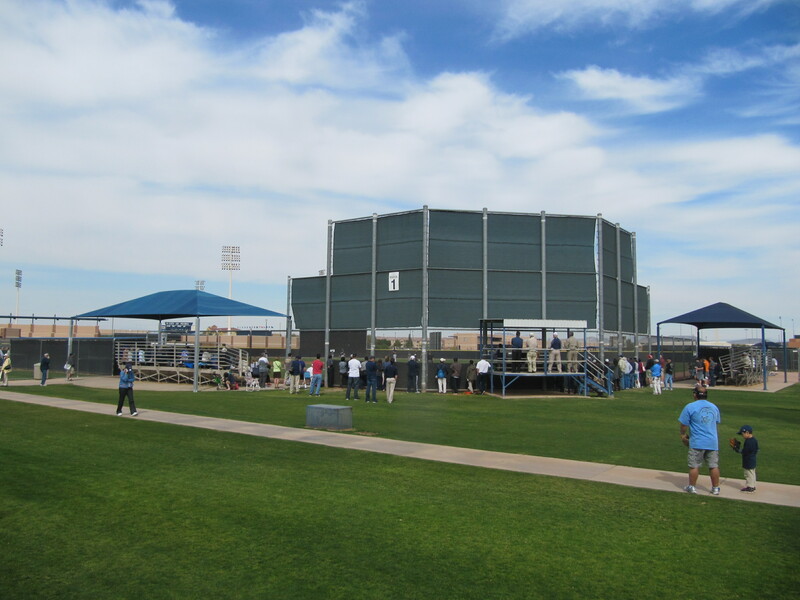 It was a great time at Spring Training, and we left more excited than ever for the regular season to start about a month later.